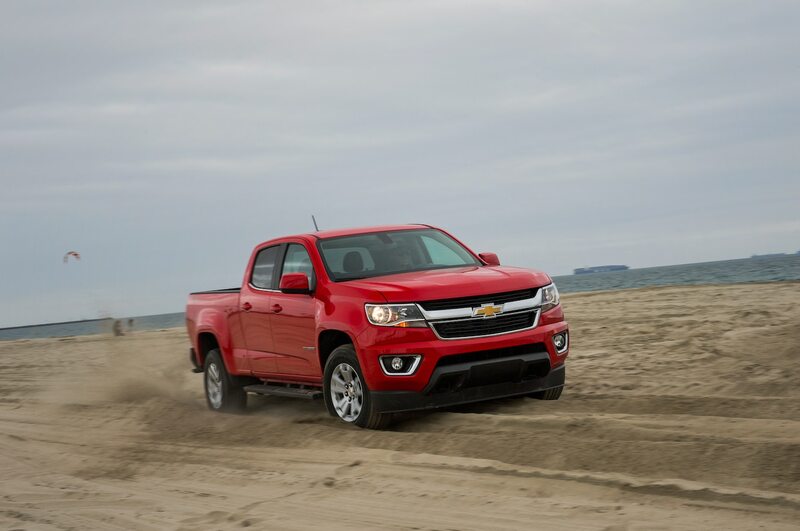 The Chevy Colorado provided a nice ride both empty and loaded. 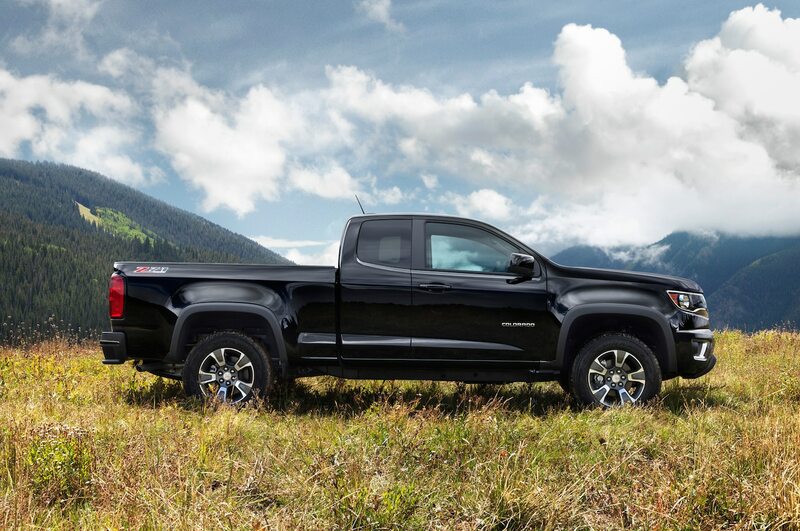 The Colorado also provides a considerable value for consumers looking at that segment, another criteria Motor Trend judges weighed. 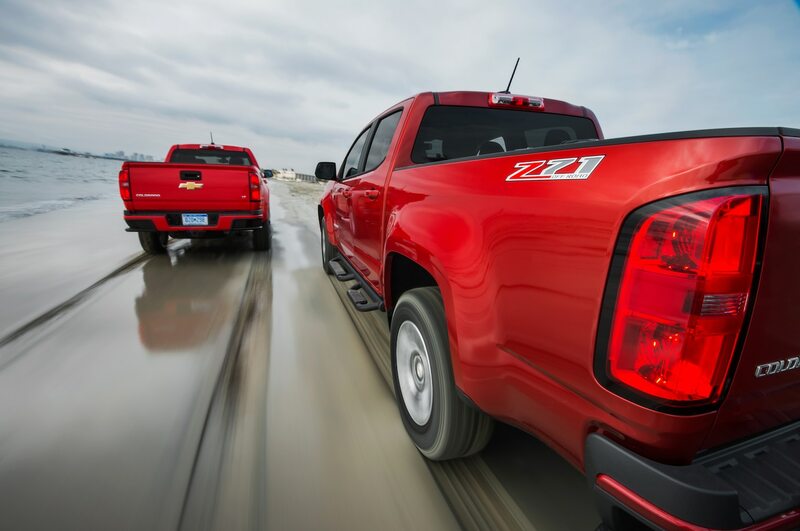 Our two test vehicles, an extended cab work truck with a sticker price of $23,300 and a crew cab Z71 pickup at $36,210, were the least expensive of the TOTY contestants. 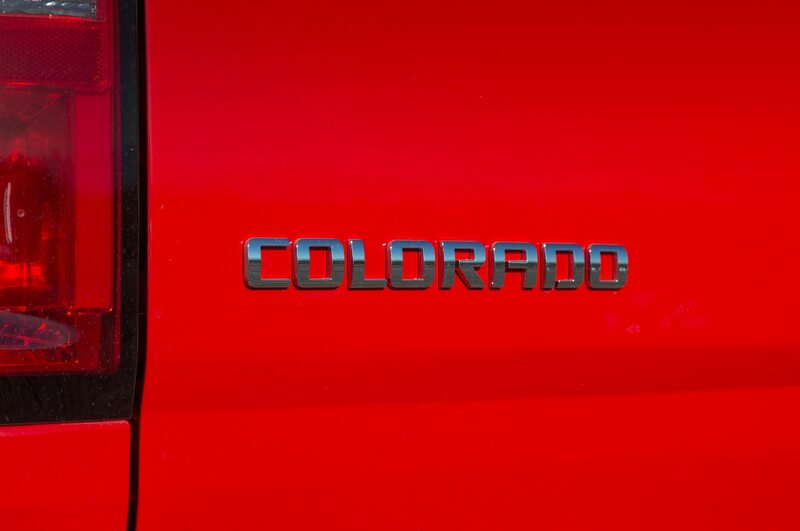 You could buy three Colorado work trucks for less than the $74,665 F-450 we tested. 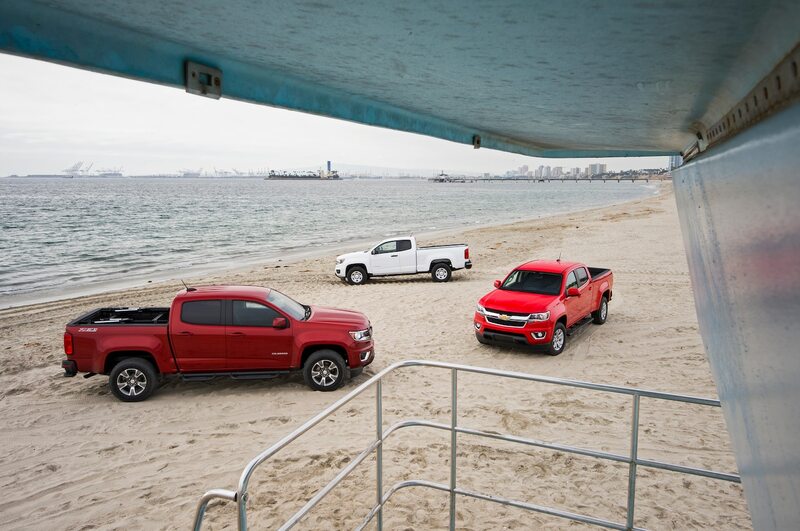 Granted, those are short-bed to long-bed comparisons, but the Colorado represents solid value in its segment, comparably priced against the (less impressive) Tacoma and Frontier. 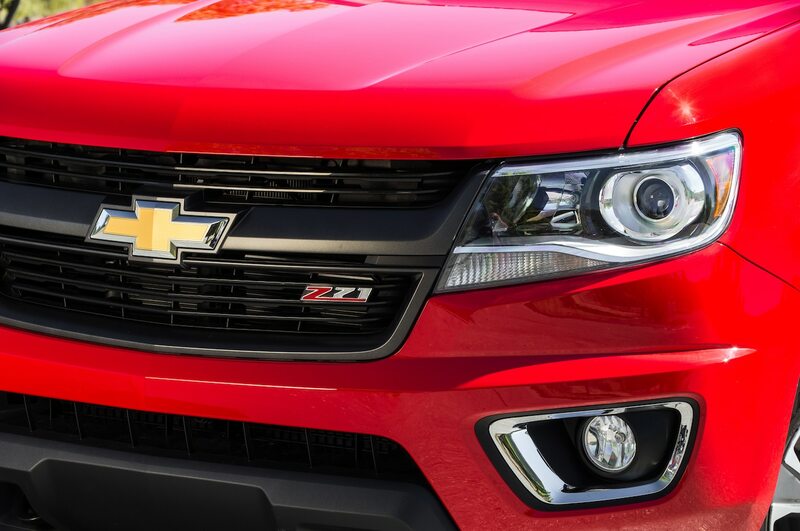 The lower price never left editors wanting for more. 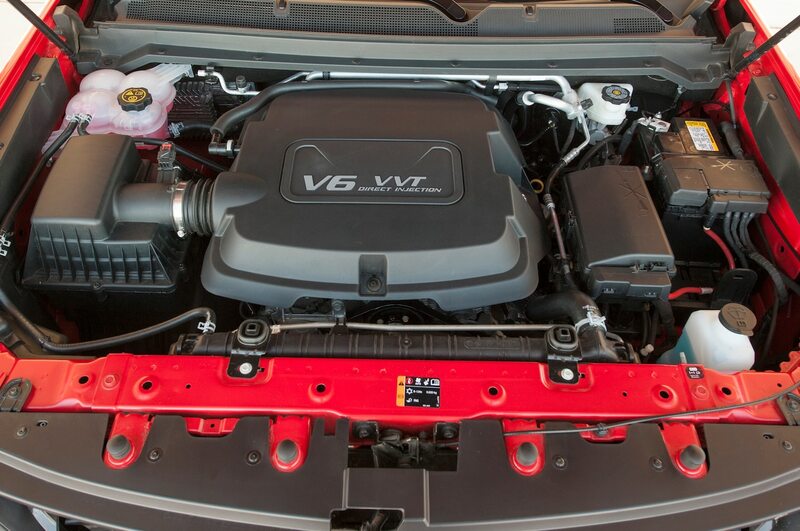 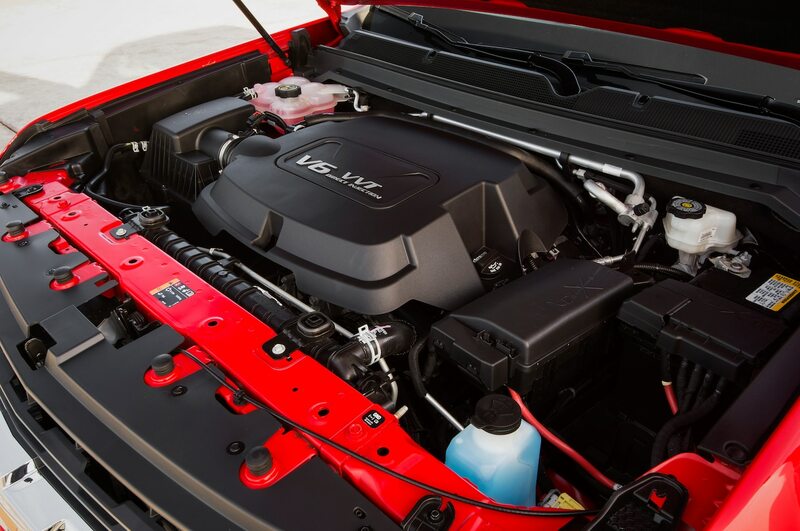 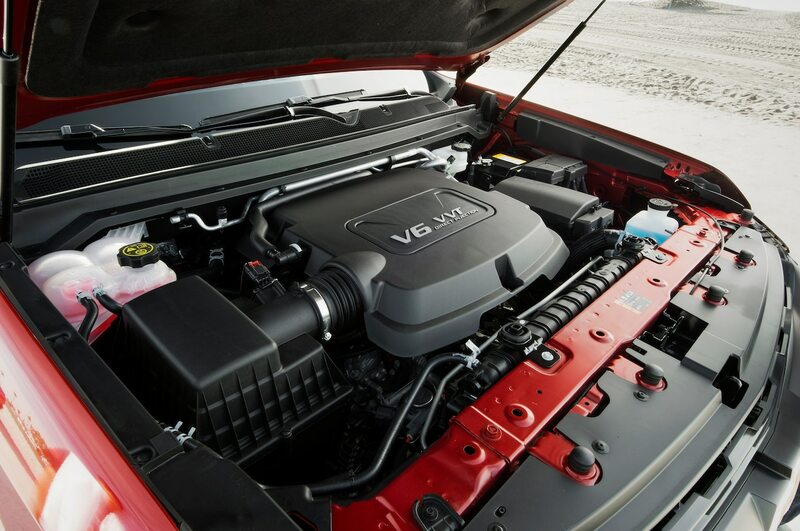 There are currently two engines to choose from: a 2.5-liter four-cylinder and 3.6-liter V-6. 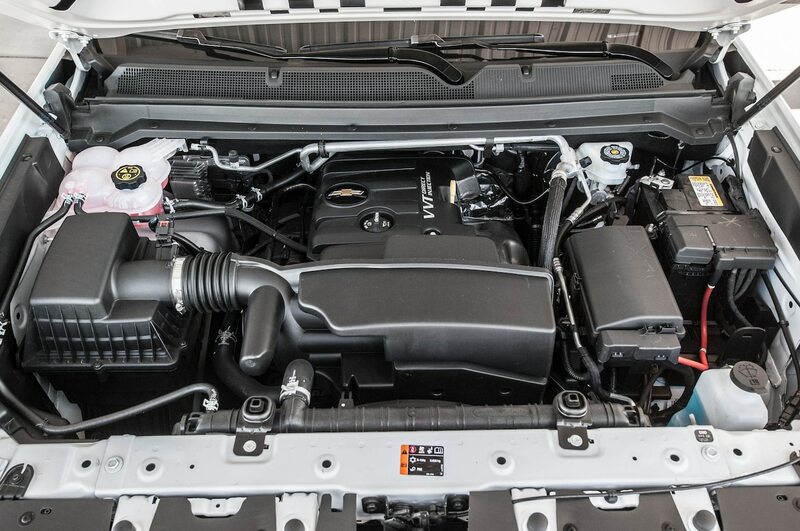 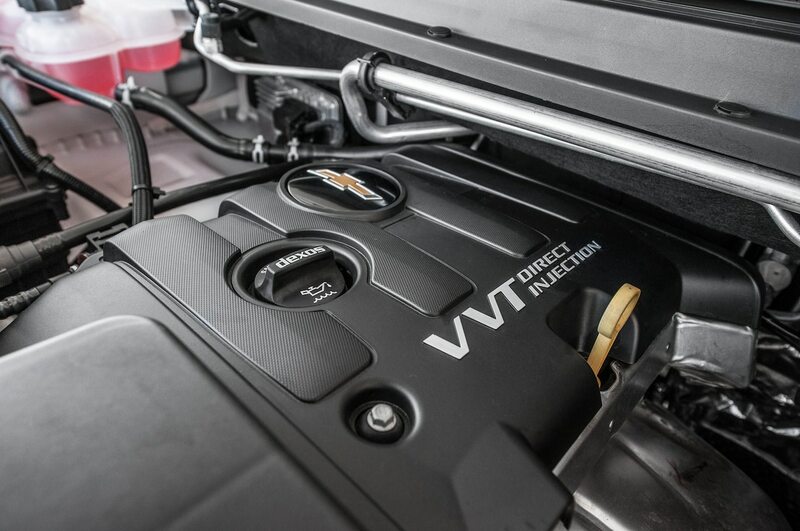 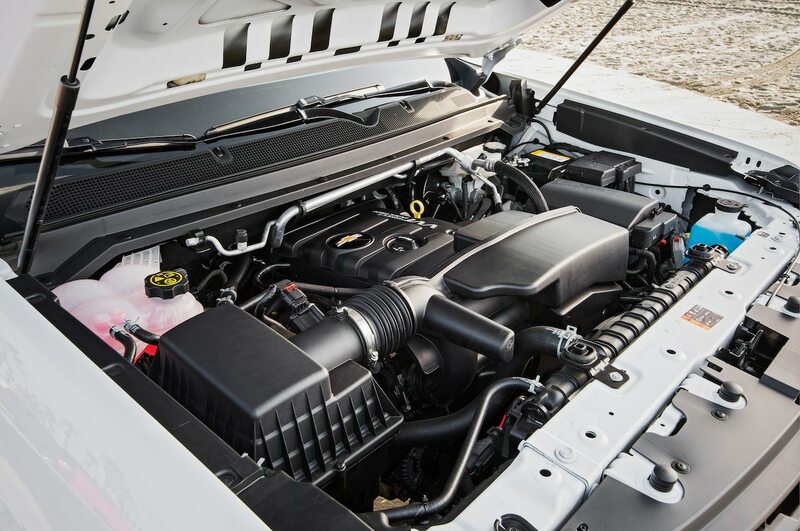 Next year, Chevrolet will introduce a 2.8-liter turbodiesel I-4, slightly modified from the overseas market. 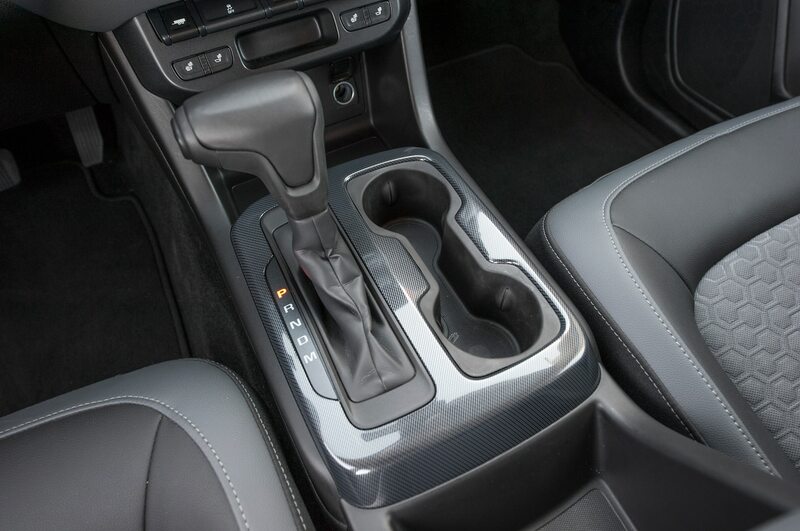 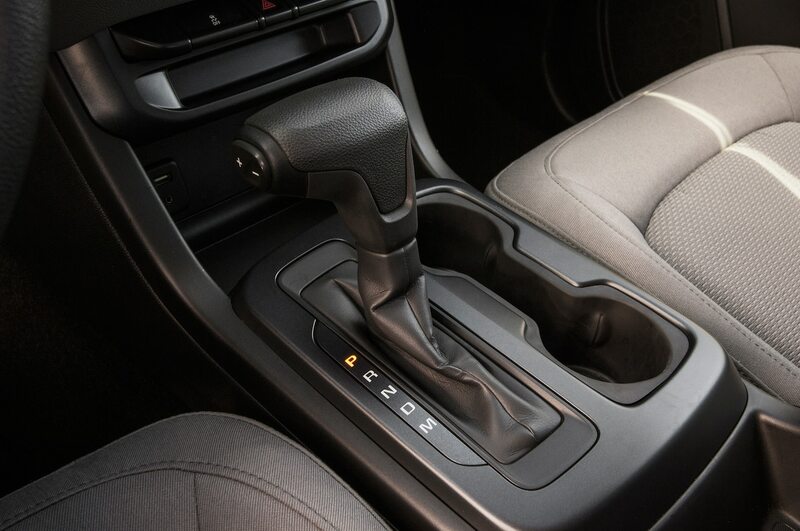 All the engines are mated to a Hydramatic six-speed automatic transmission or, on lower trim levels of the 2.5-liter, an Eaton six-speed manual. 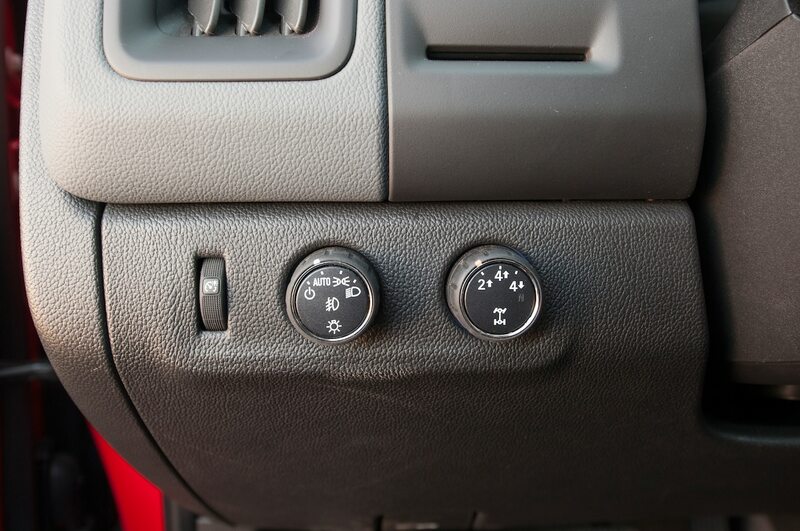 Our two testers came with the automatic, which received the one consistent gripe from editors. 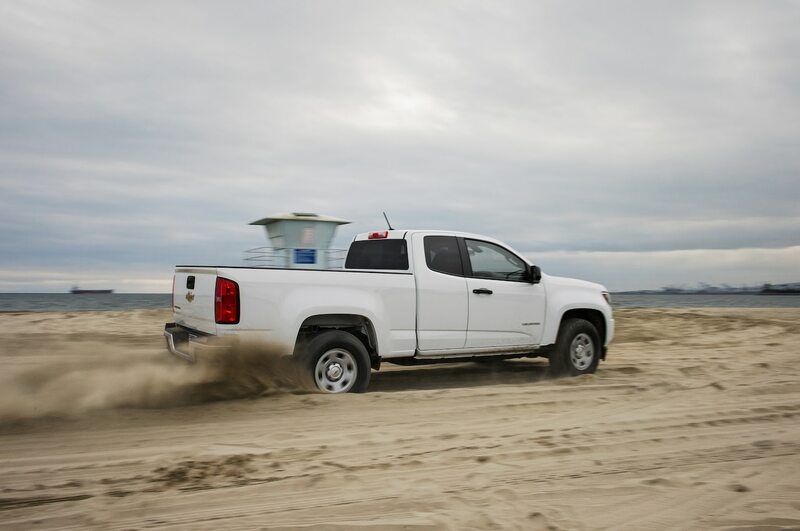 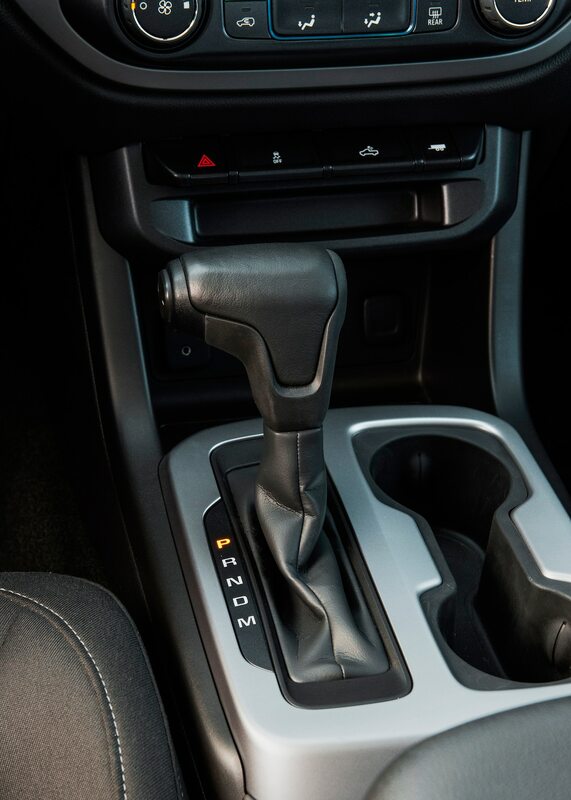 While the transmission provided good acceleration and never lurched, it did seem to want to get to sixth gear in a hurry, sometimes causing the Colorado to lag. 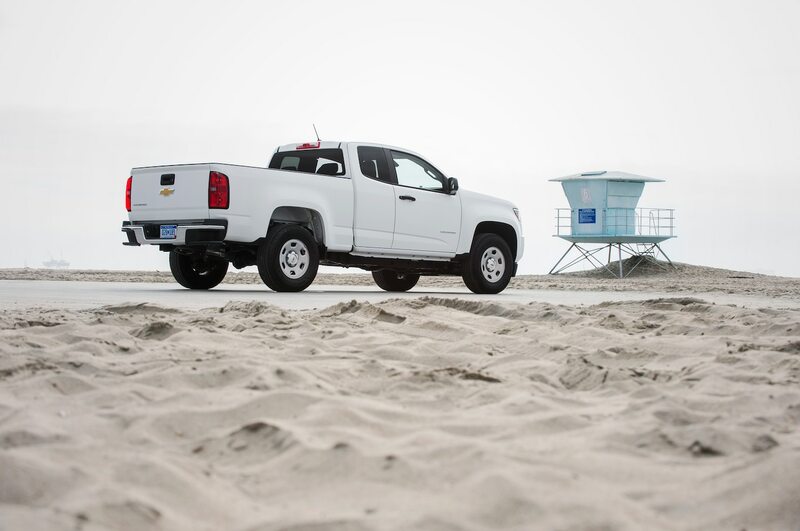 But stomp on the accelerator, and it would drop a gear or two, and the truck was off and running. 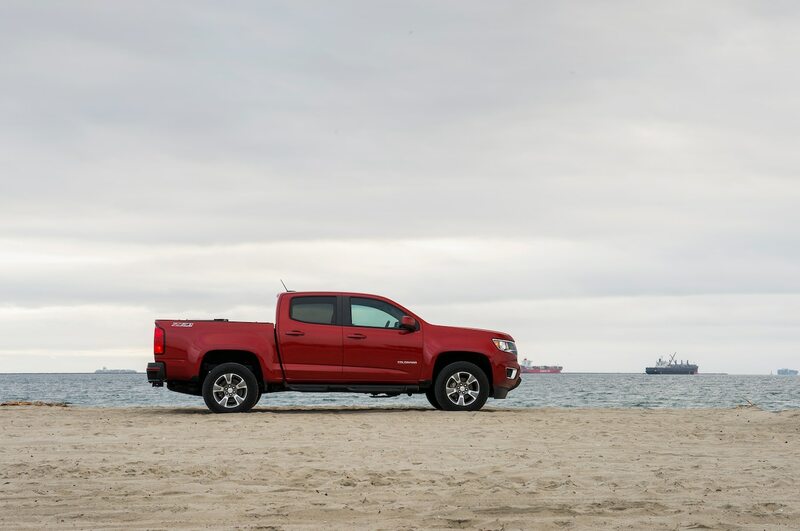 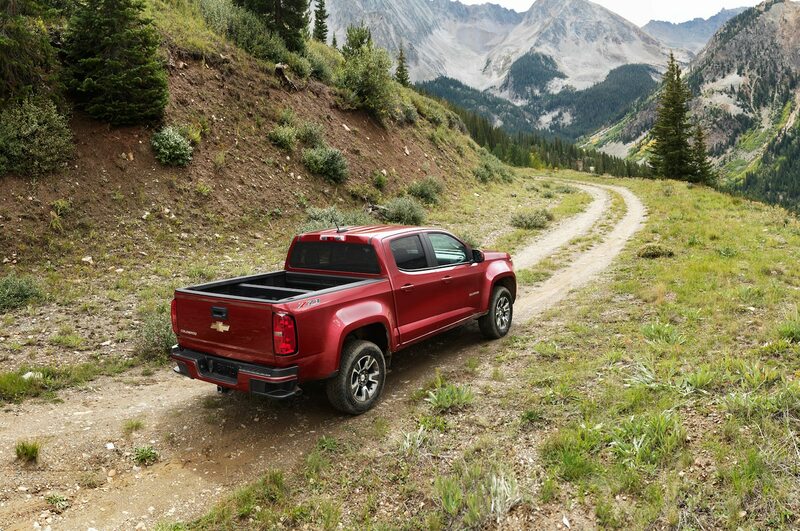 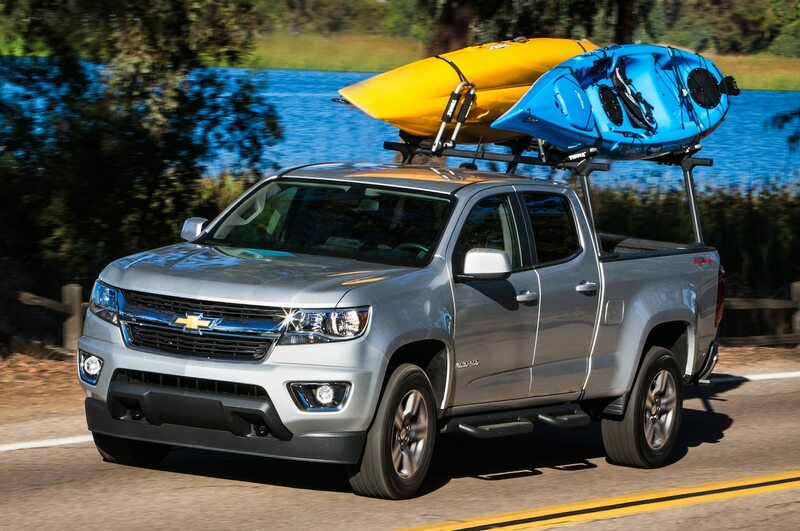 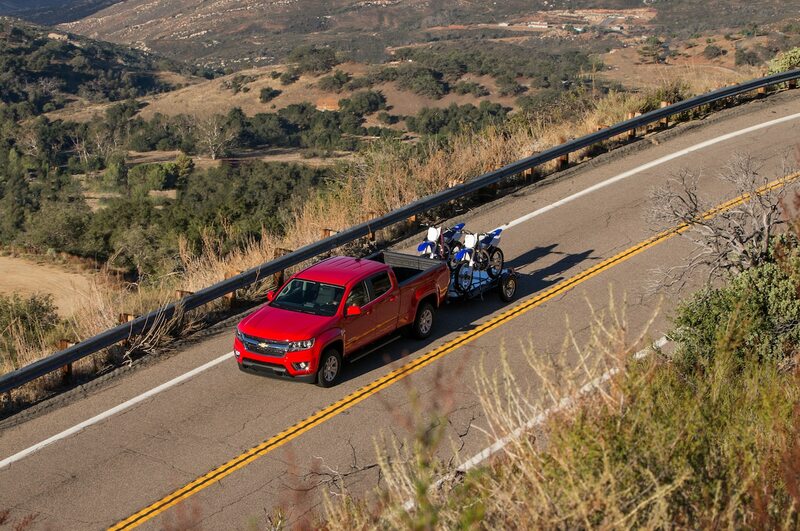 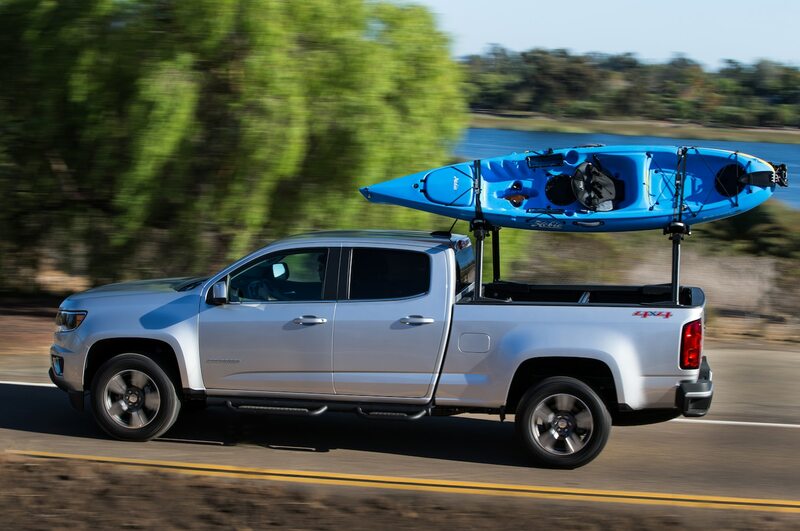 The Colorado is rated to tow 7,000 pounds with a V-6 and towing package, which we did not sample. 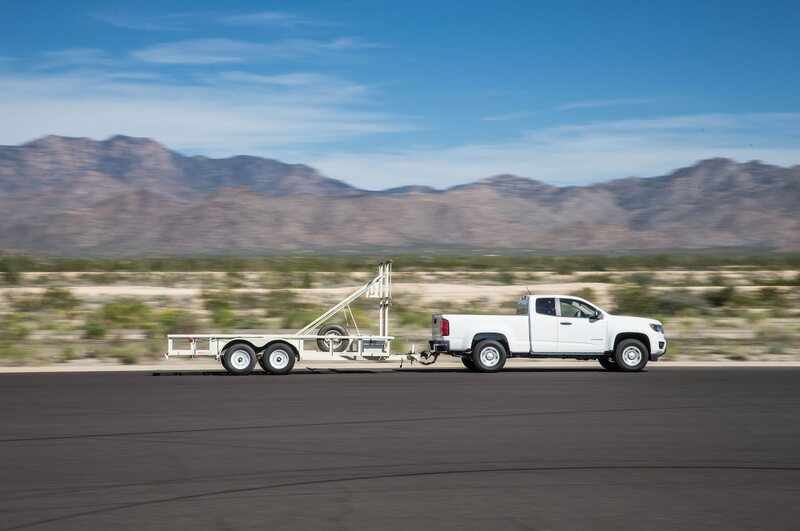 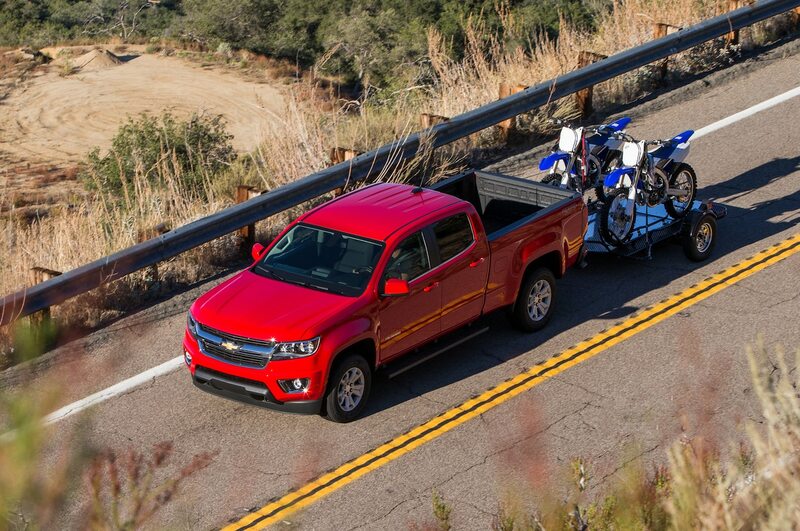 The 2.5-liter is rated for 3,500 pounds, but Chevy doesn’t sell a hitch on 2.5-liter models, so we put one on and towed a 3,000-pound trailer. 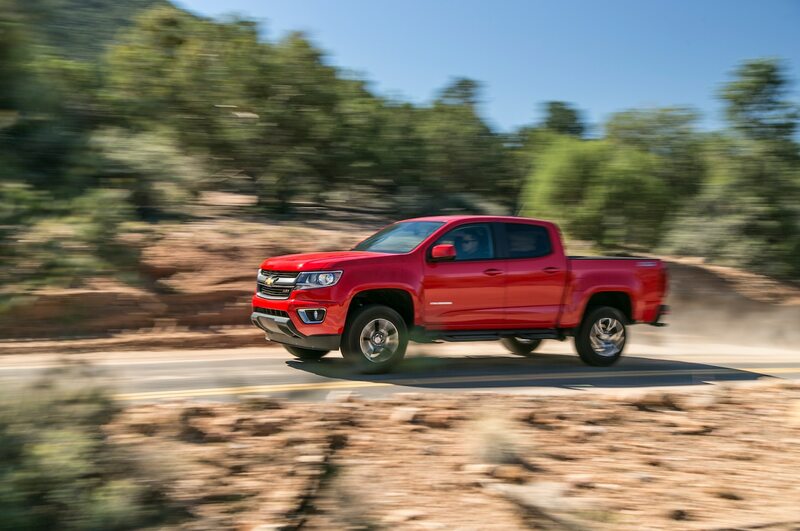 Acceleration to 60 mph slowed from 9.3 to 17.4 seconds — slowing just slightly more as a percentage than its GMC sibling Canyon 3.6 V-6 did with the same trailer (7.7-13.3 seconds). 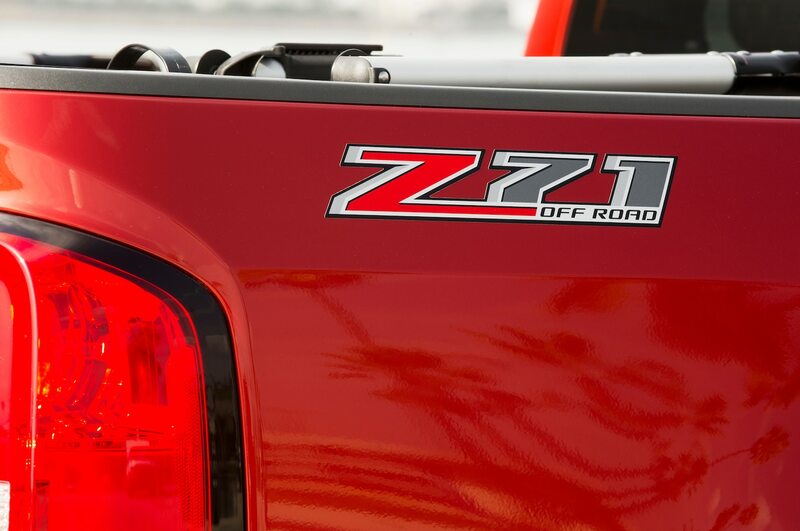 Our Z71 model did not include a hitch. 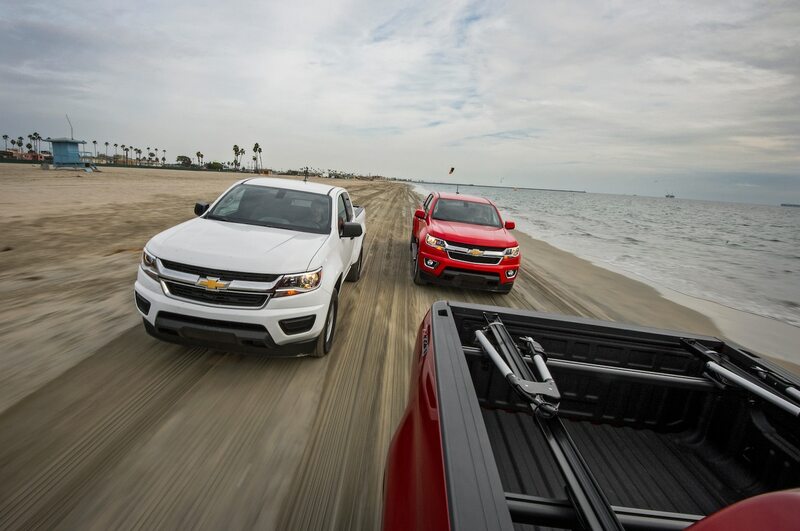 With the 2.5-liter four-cylinder engine creating 200 hp and the 3.6-liter V-6 generating 305, both trucks had more than enough muscle. 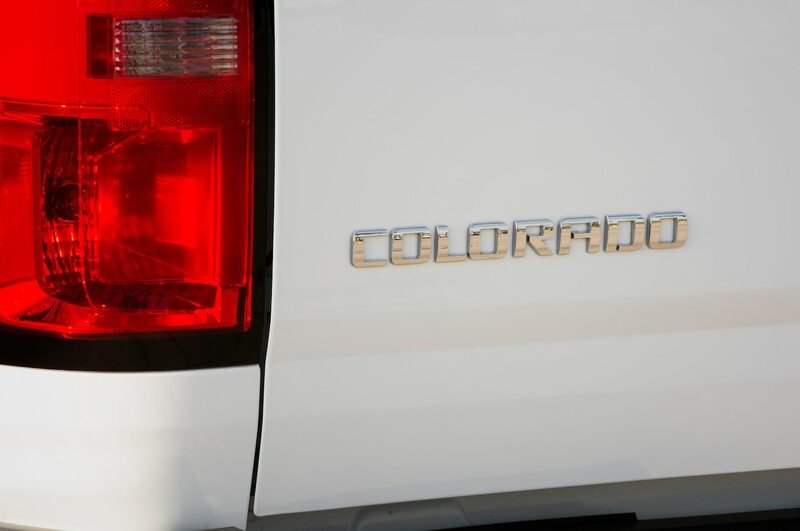 Colorados weigh between 3,900 pounds and 4,450 pounds depending on configuration. 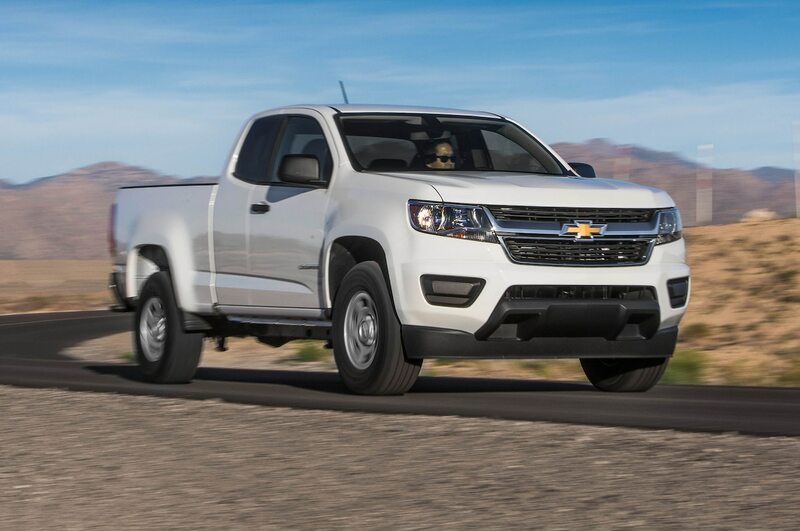 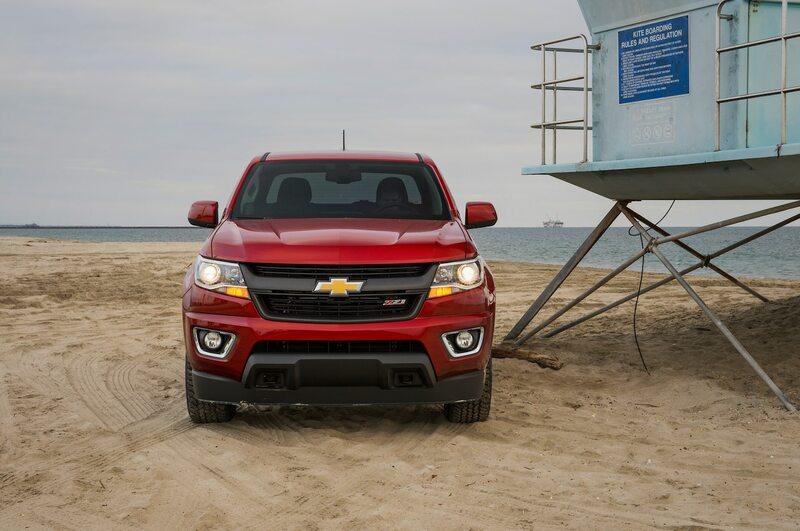 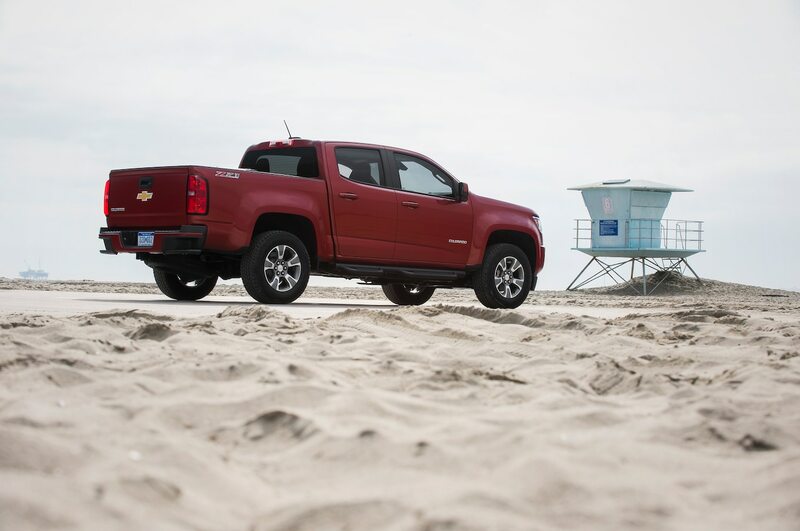 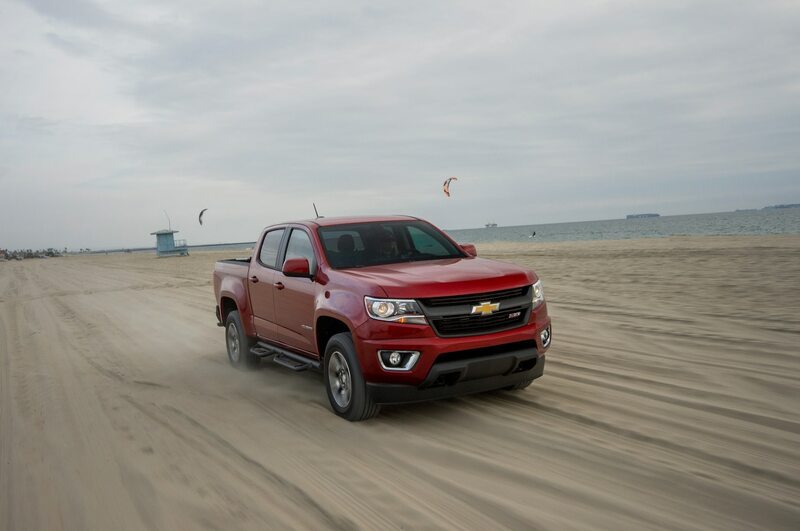 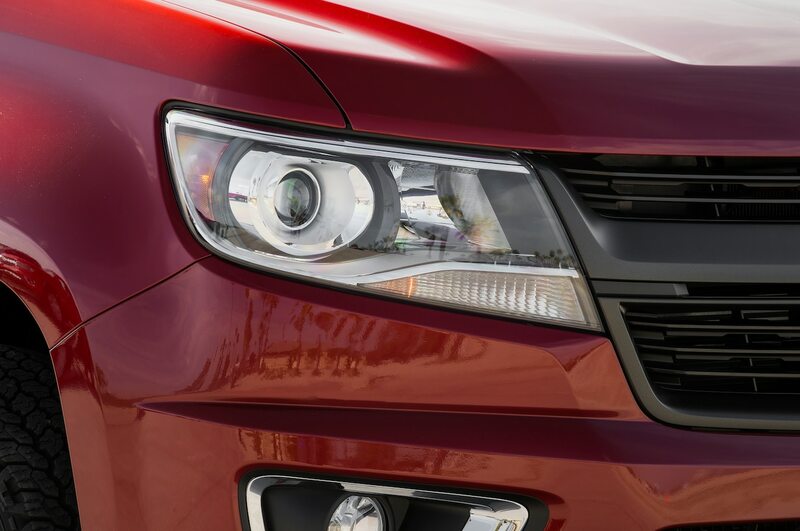 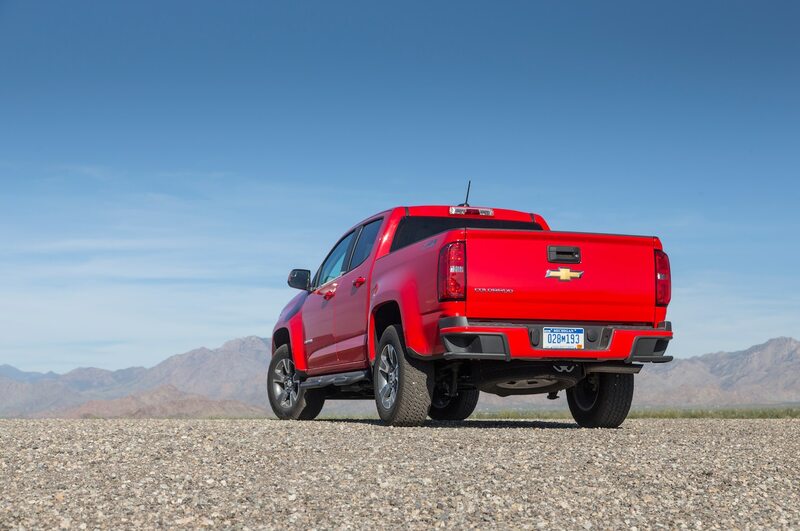 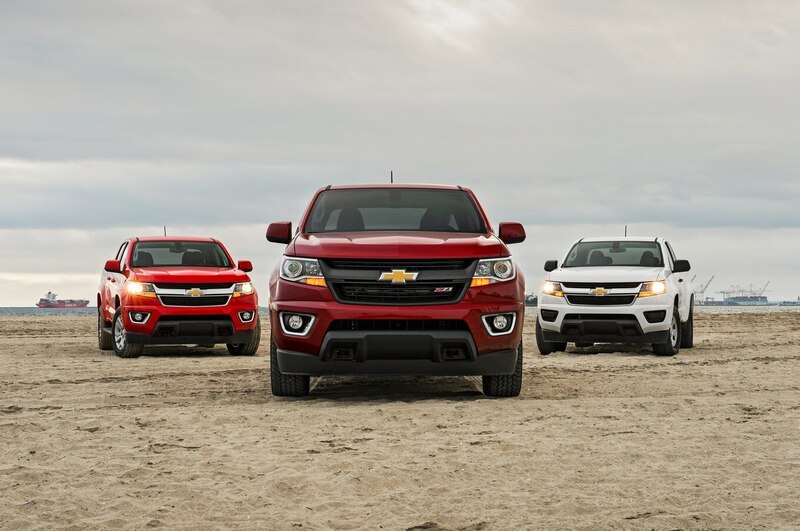 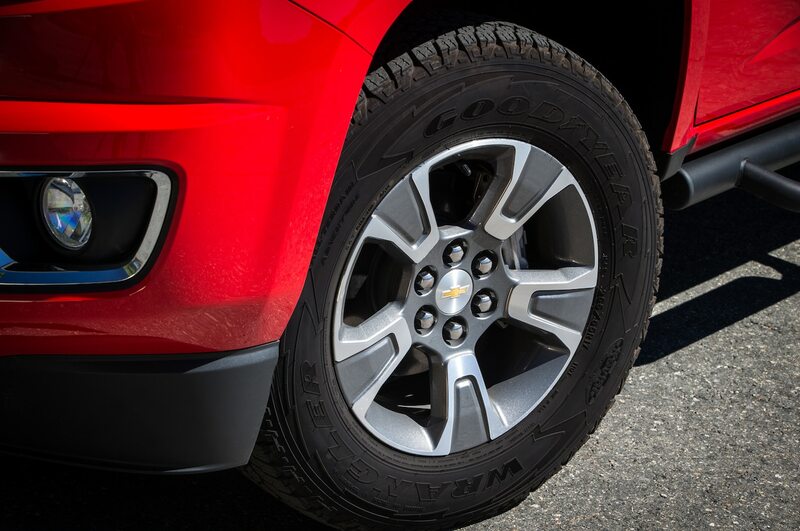 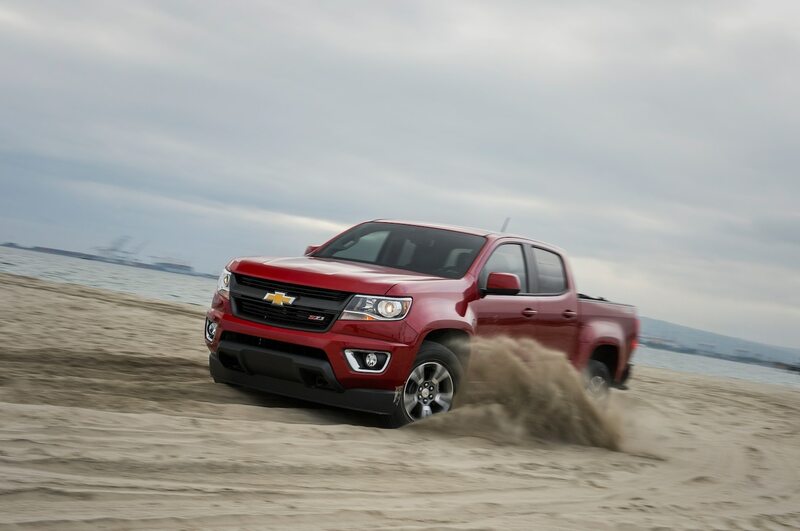 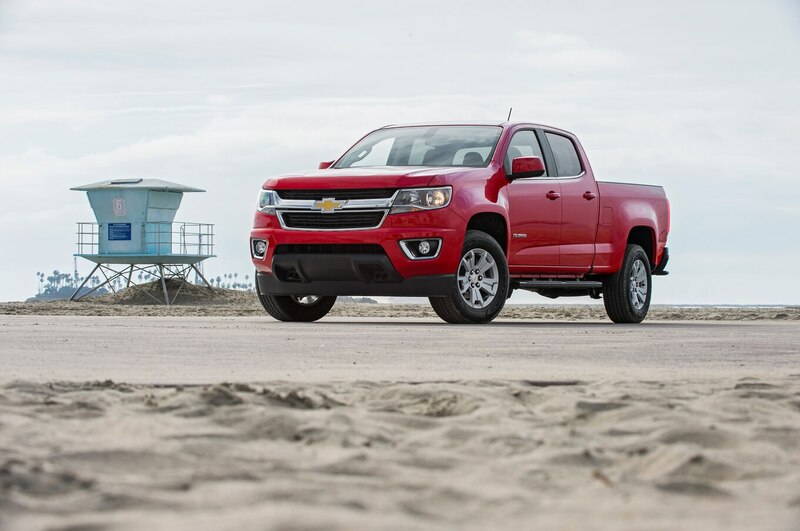 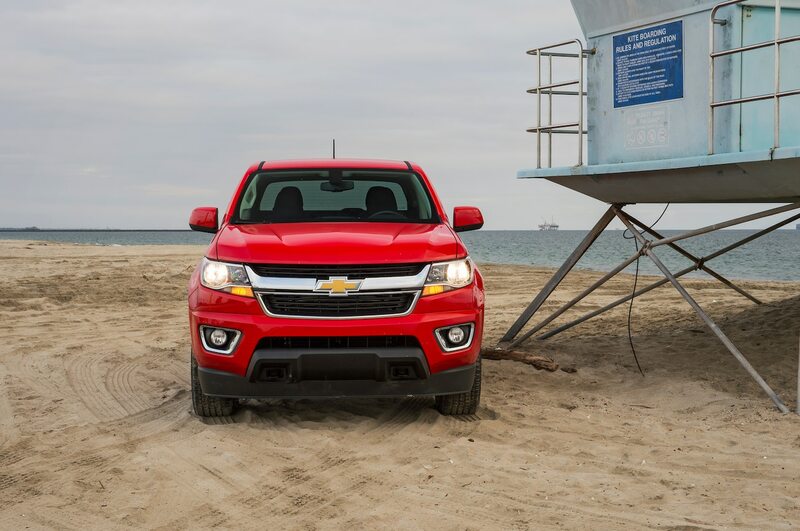 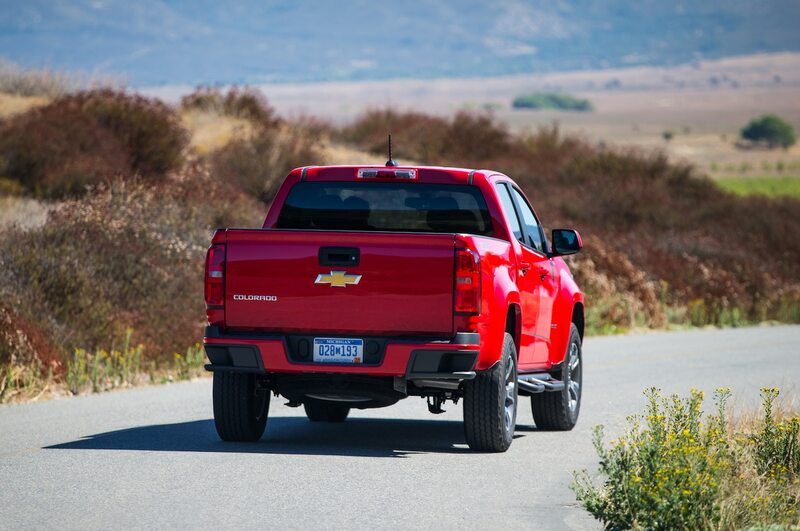 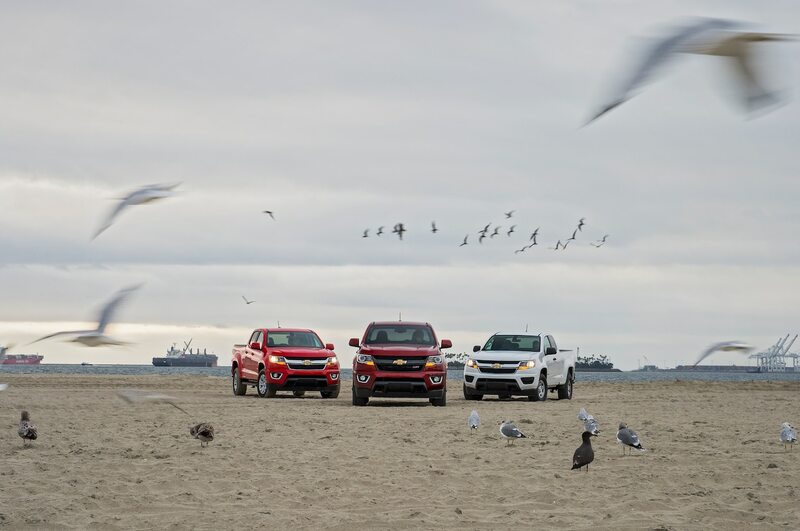 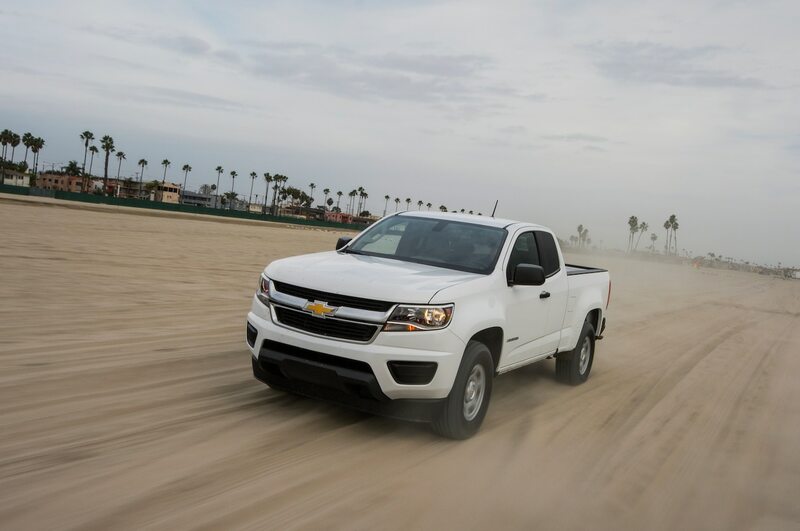 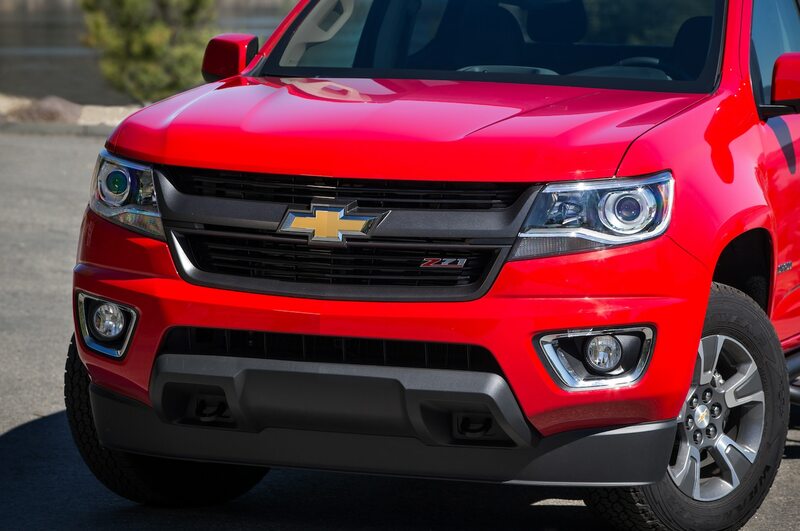 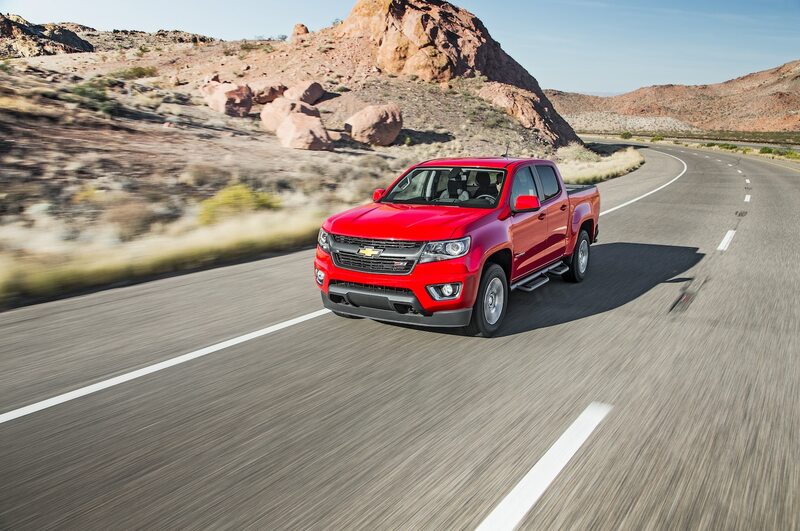 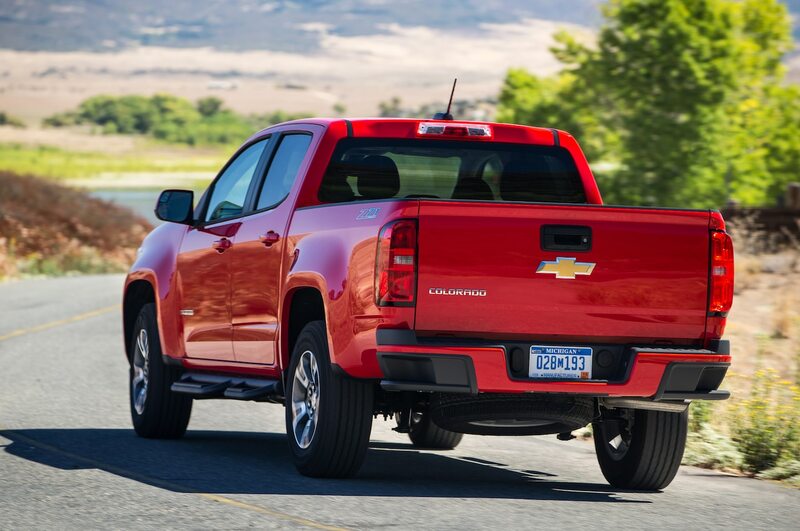 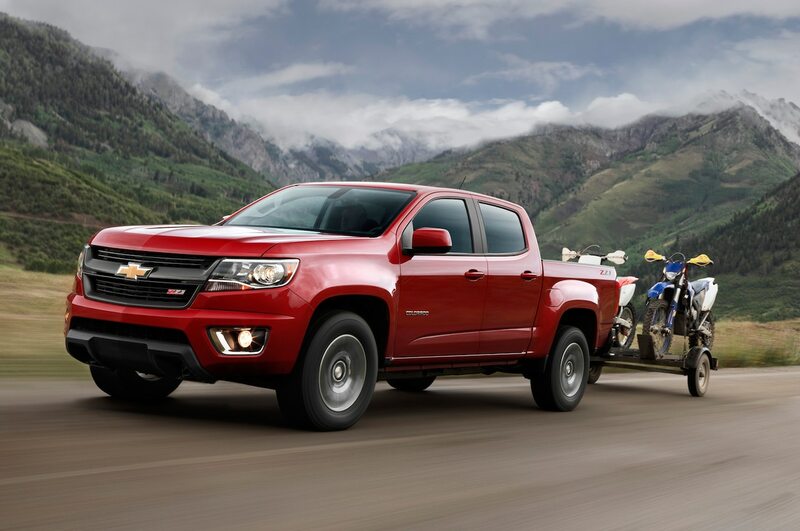 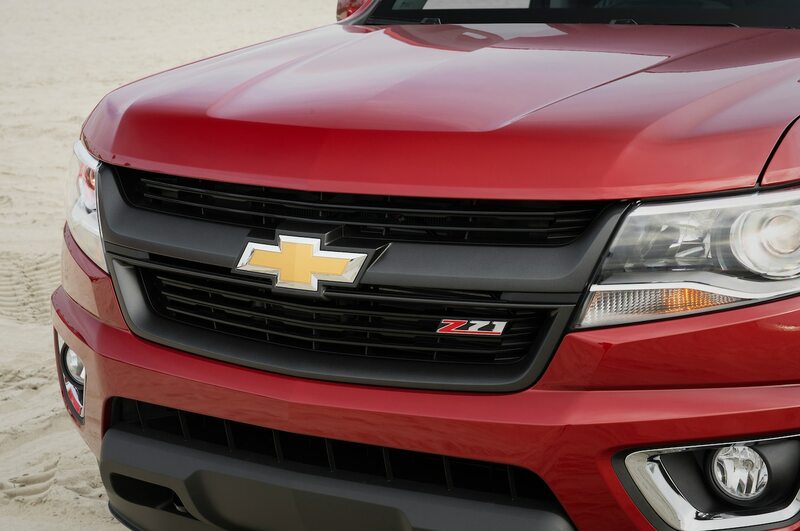 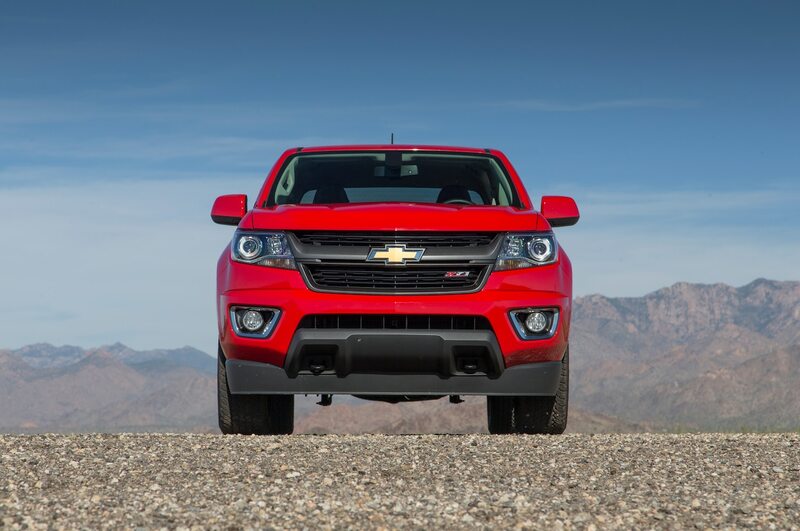 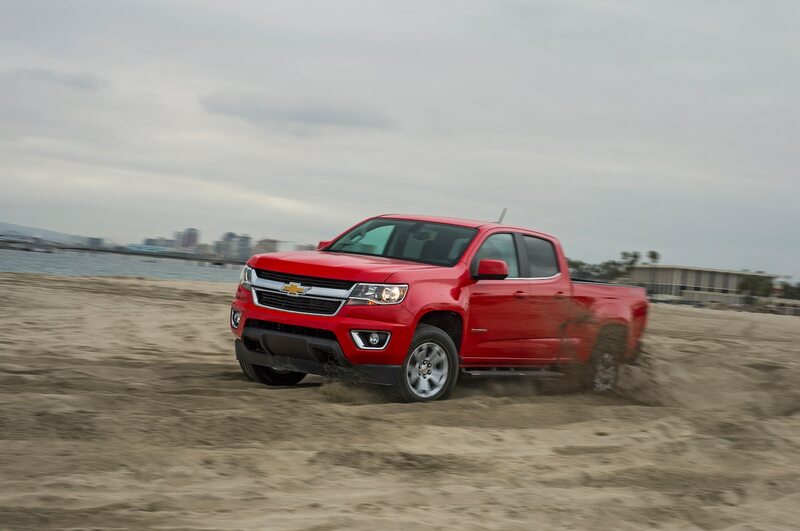 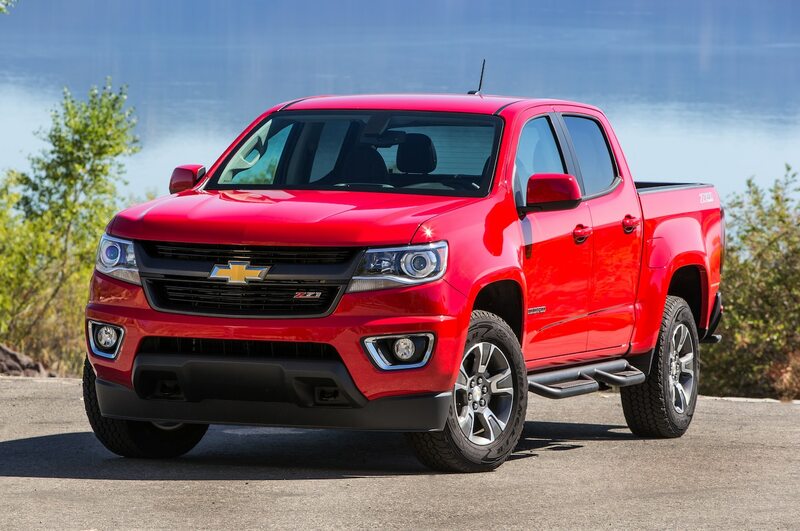 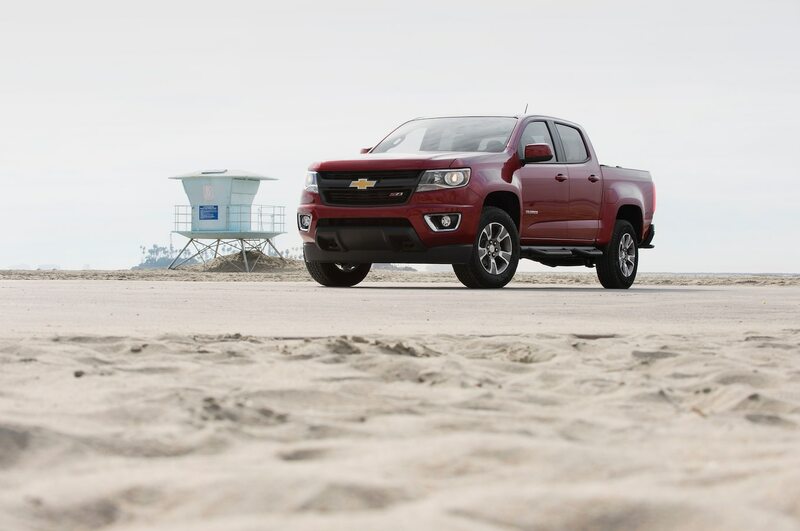 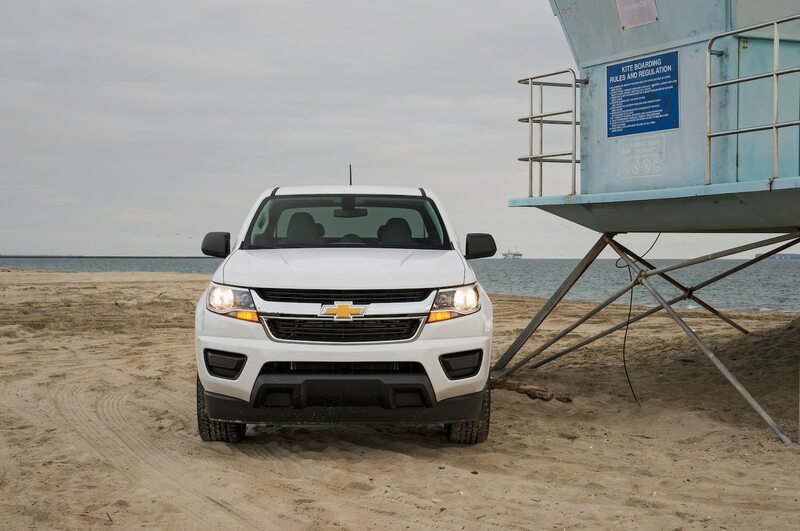 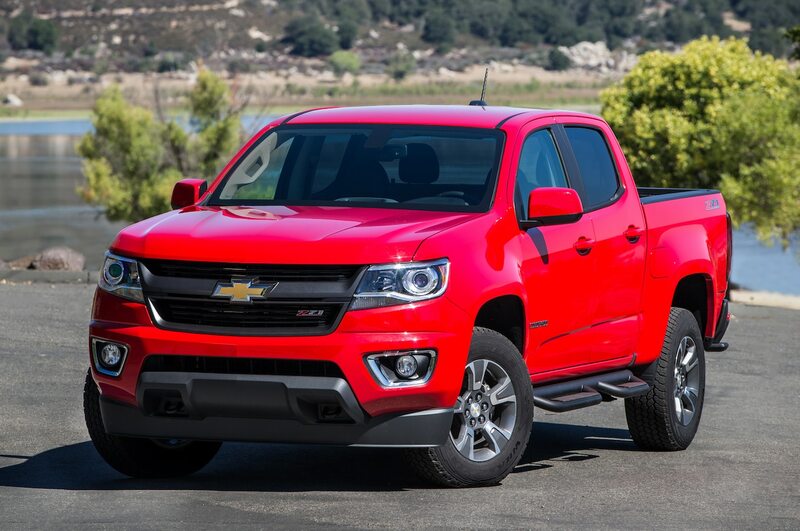 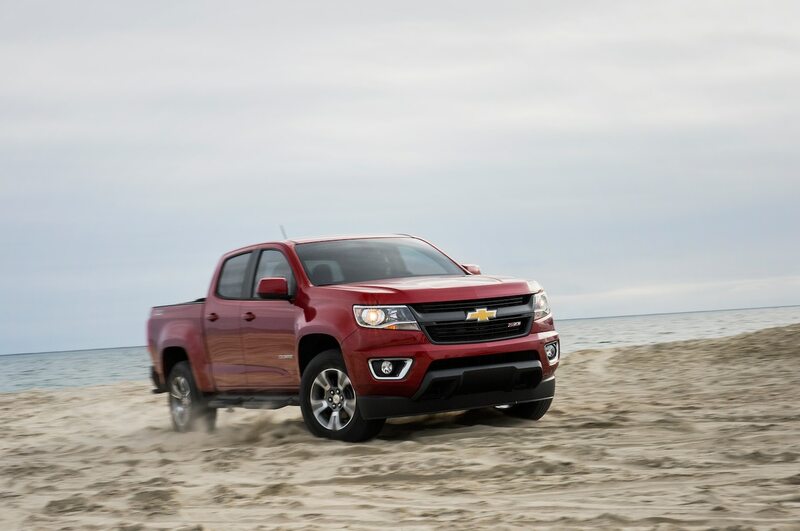 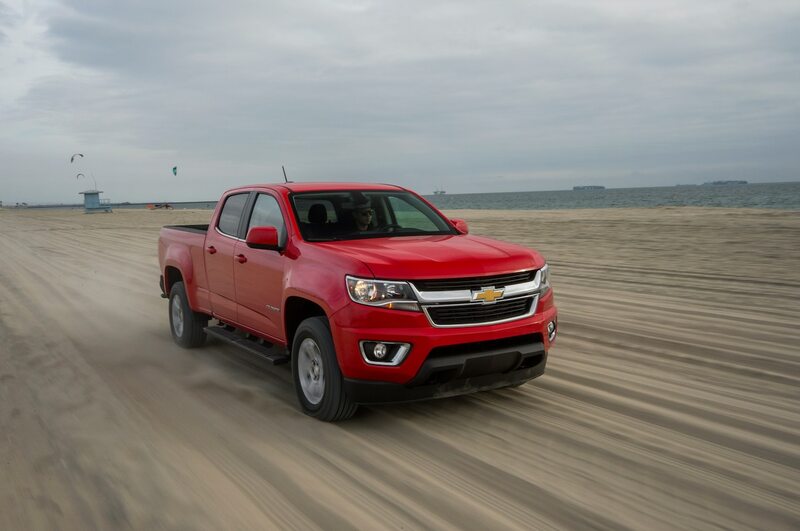 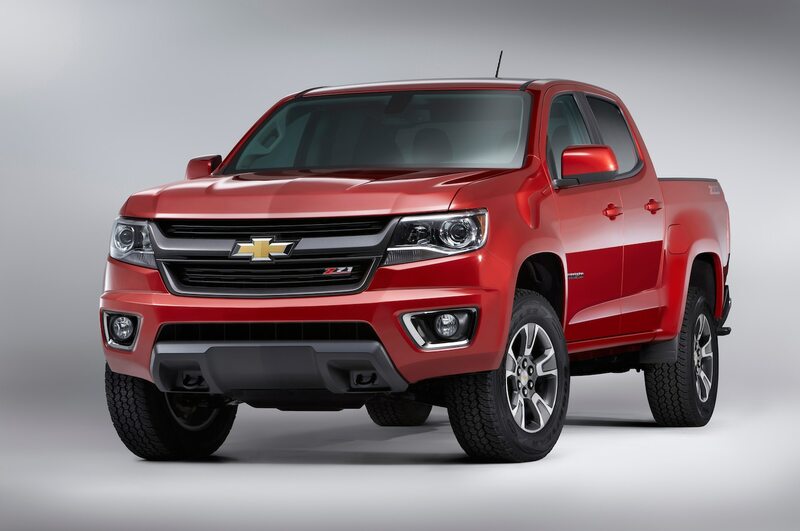 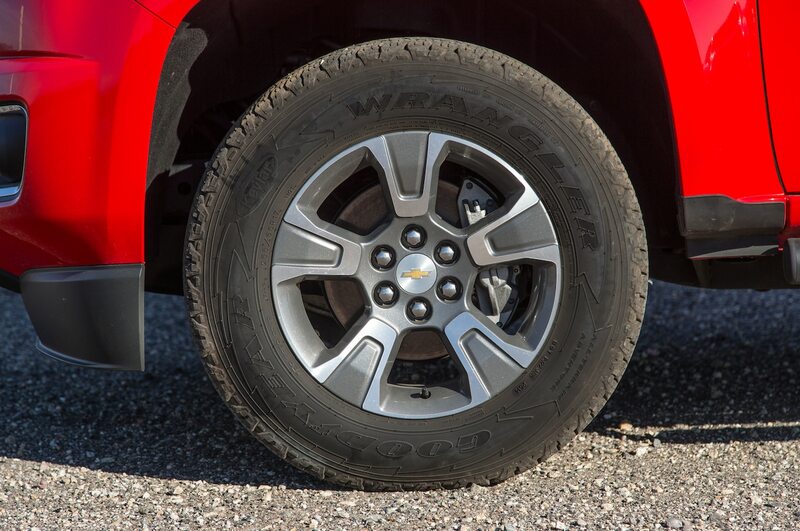 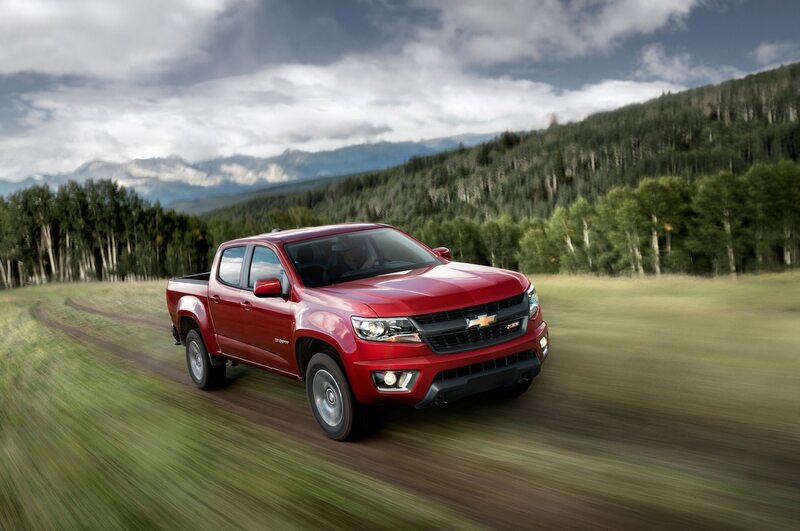 Additionally, Chevrolet keeps the construction of the Colorado simple. 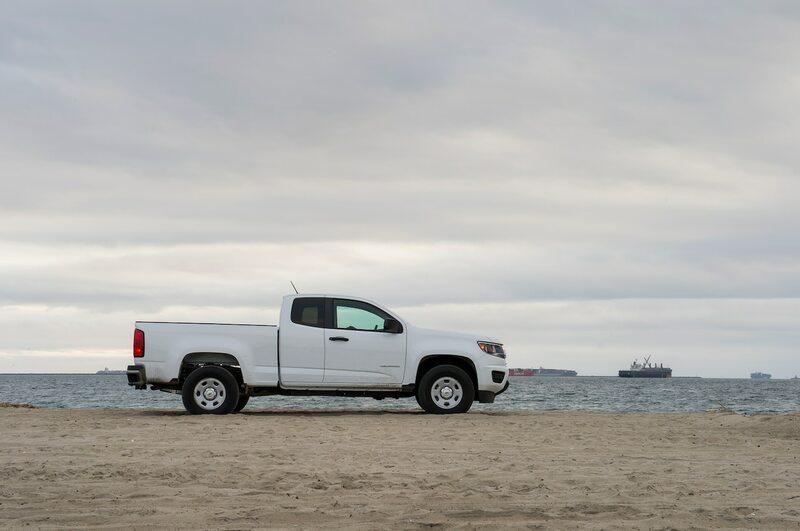 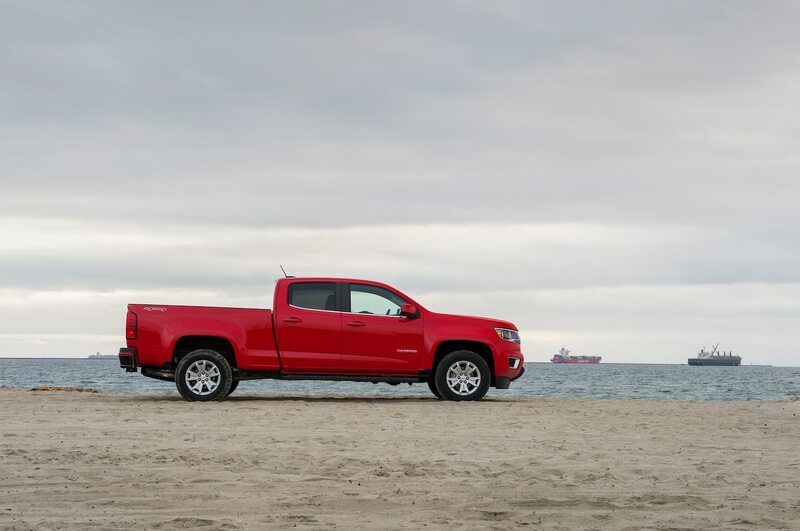 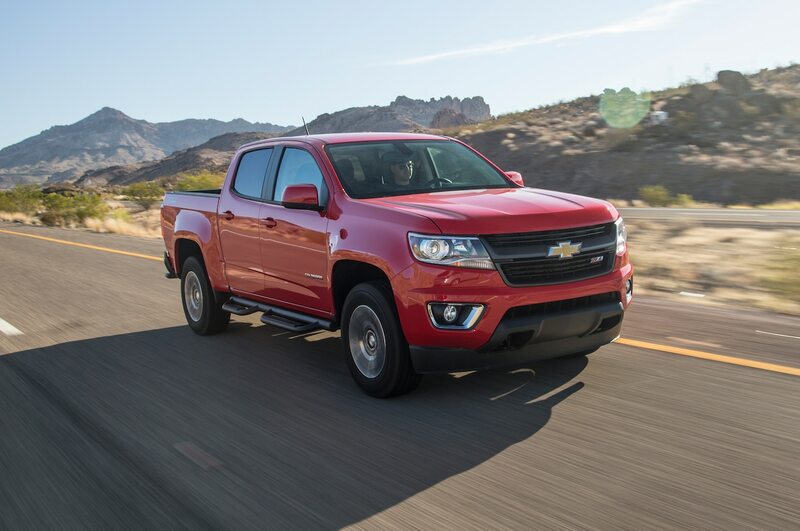 Unlike full-size offerings that can be configured more ways than a Rubik’s Cube, the Colorado comes in either extended cab or crew cab body styles and two beds: one short, the other long. 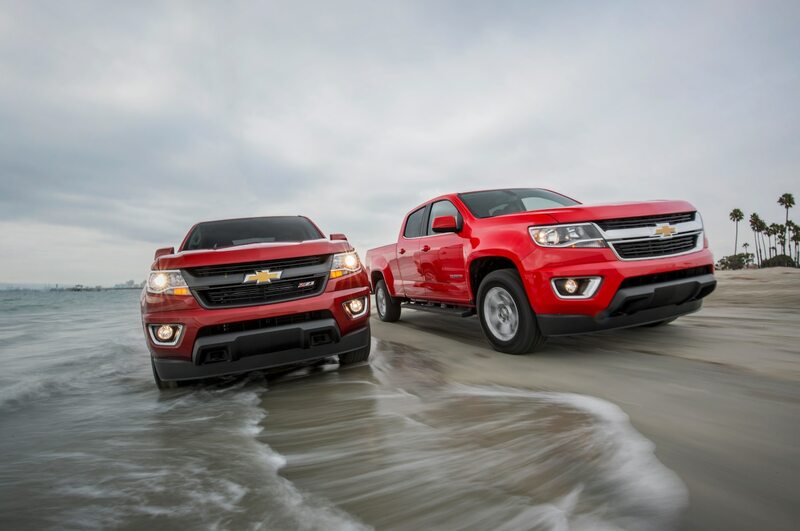 There are currently two engines and either two-wheel or four-wheel-drive options. 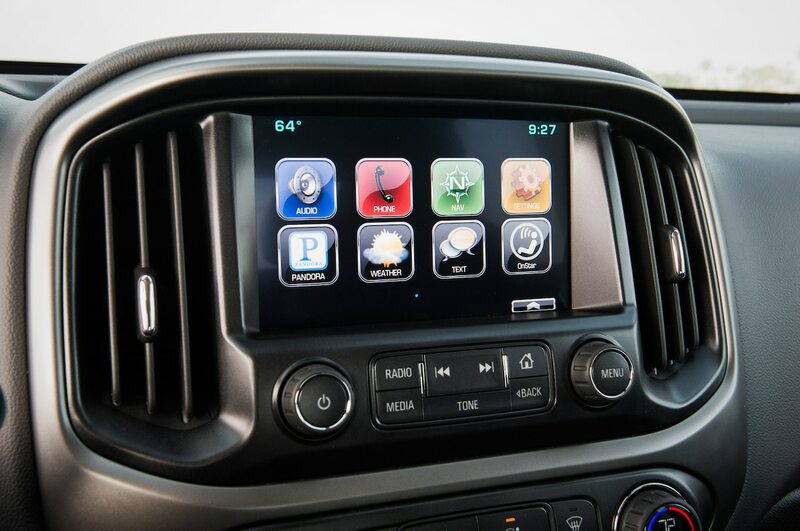 It’s smart packaging, providing enough consumer choice to make it popular but not so much to make it confusing. 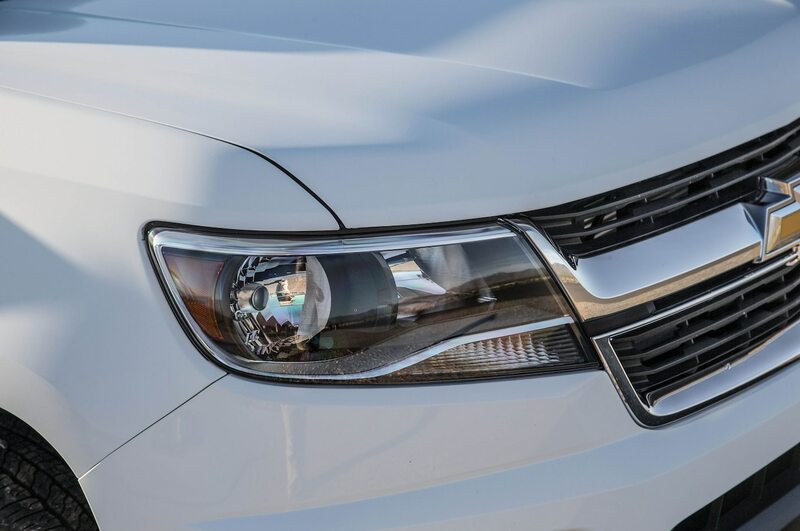 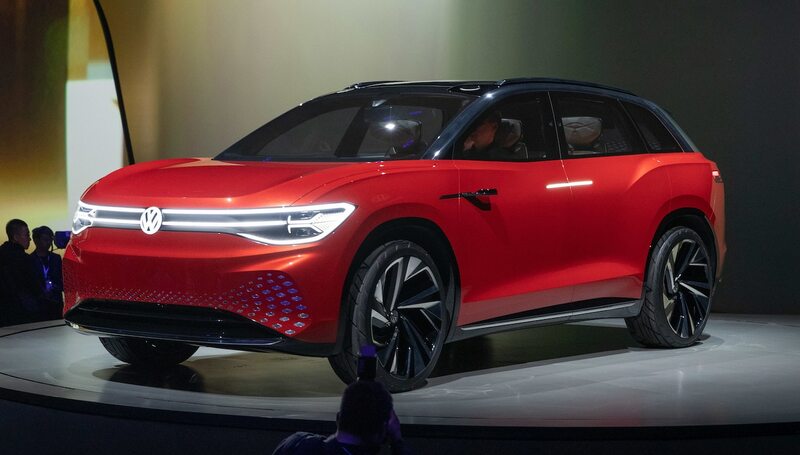 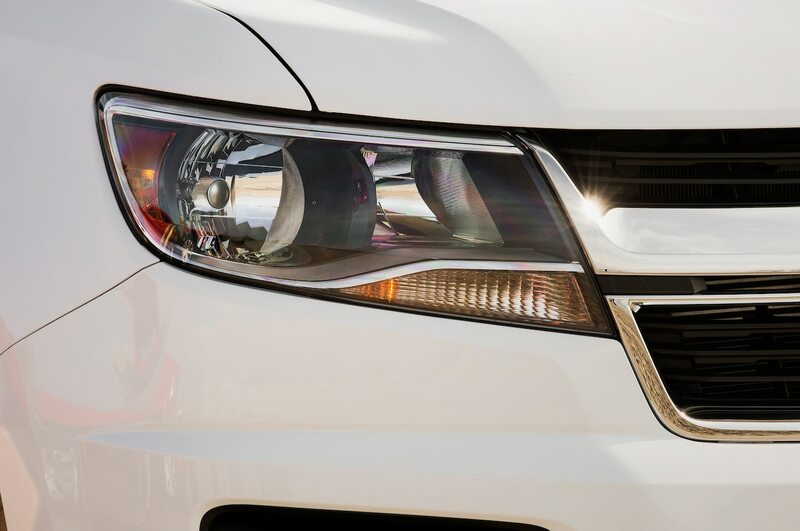 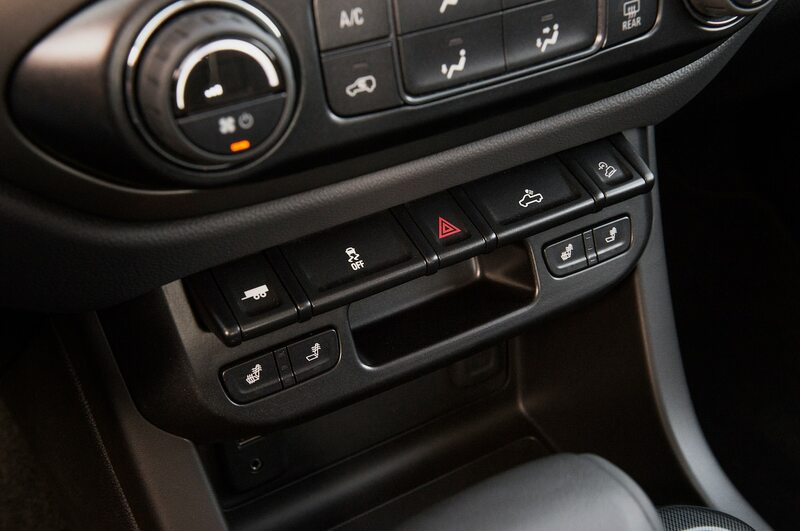 There are also a number of segment-first safety features, such as camera-dependent forward collision alert and lane-departure warning systems. 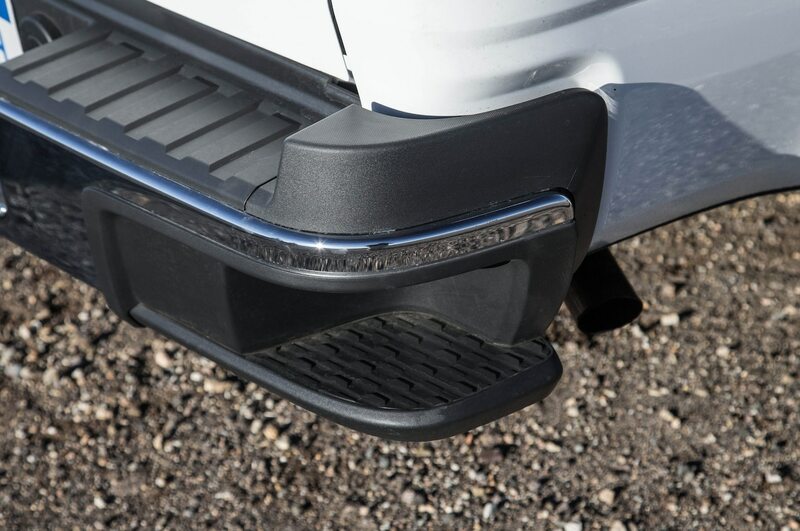 Backup cameras are standard for all vehicles. 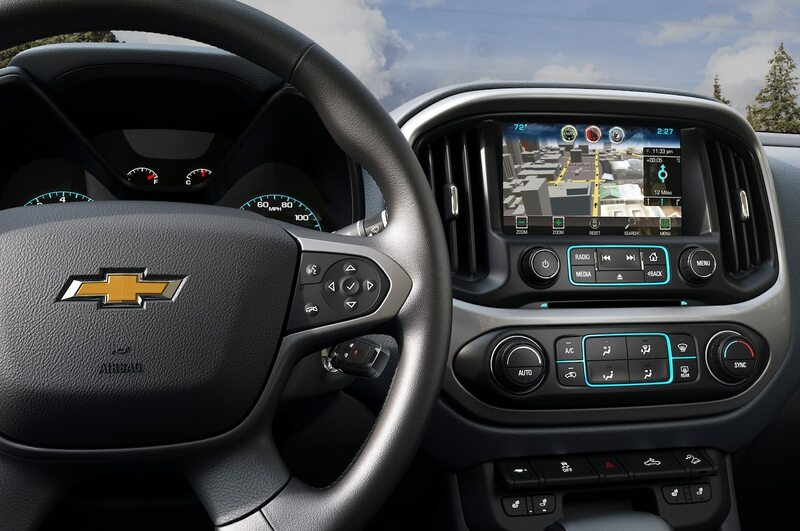 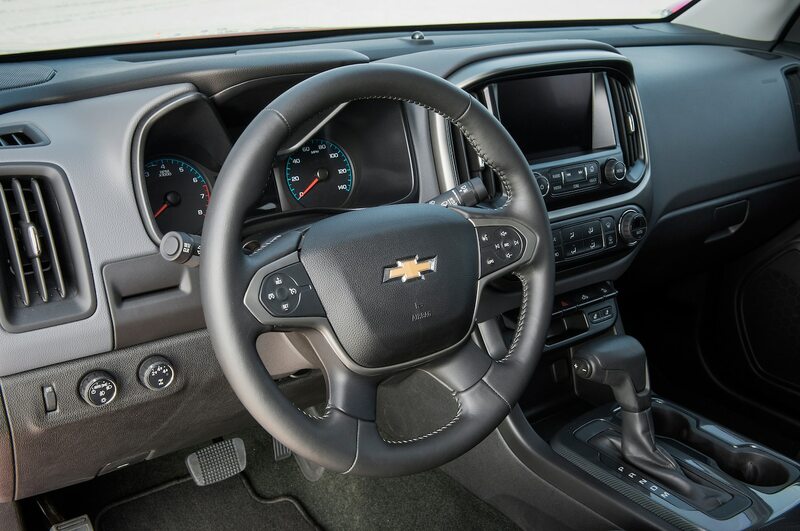 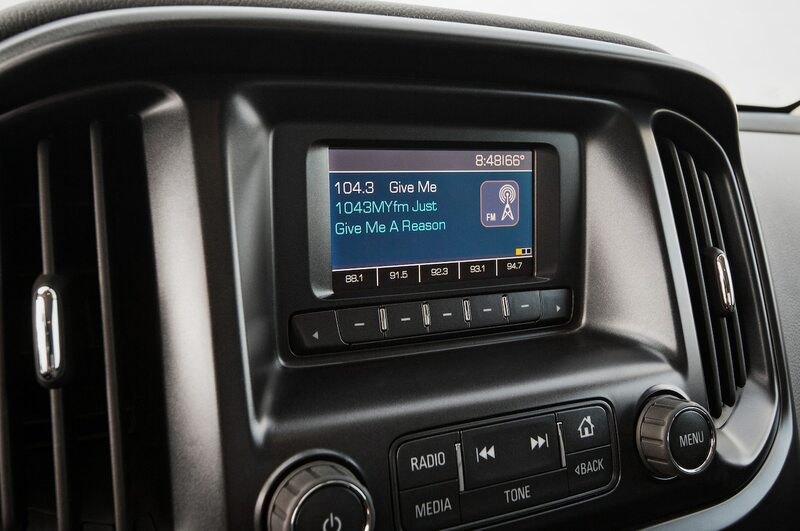 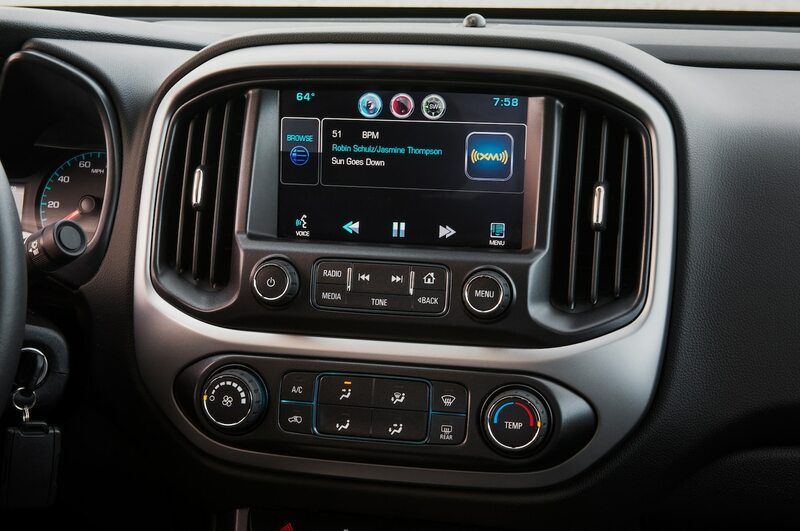 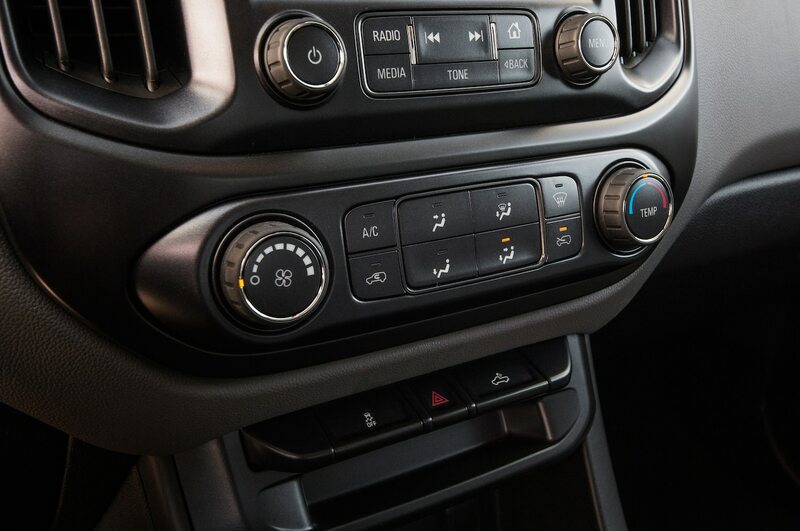 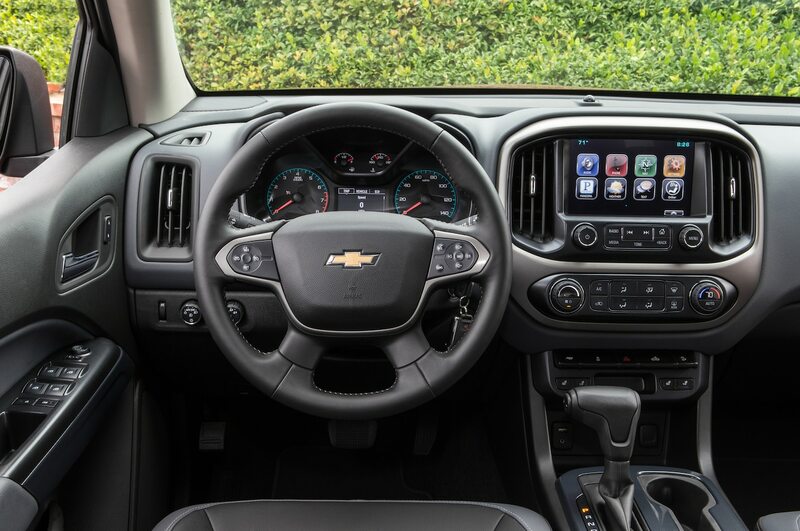 The optional Chevy MyLink provides for hands-free calling, with a button allowing use of Siri on an iPhone to control everything from music to text messages. 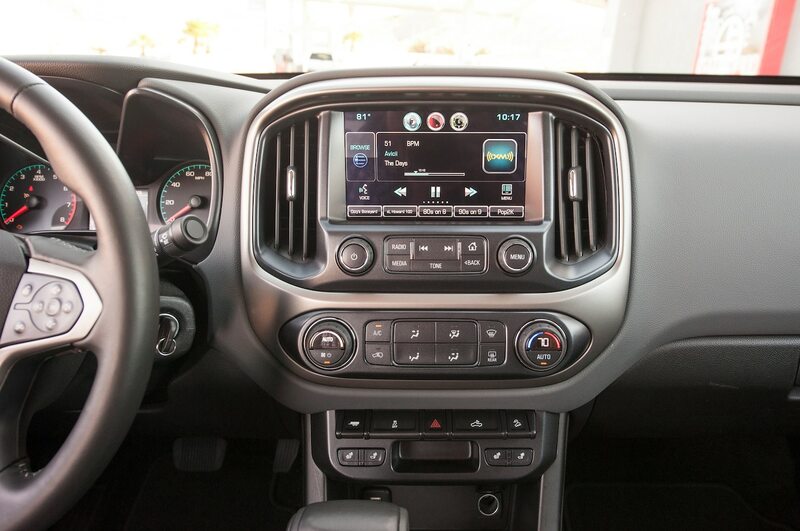 It will even read texts aloud. 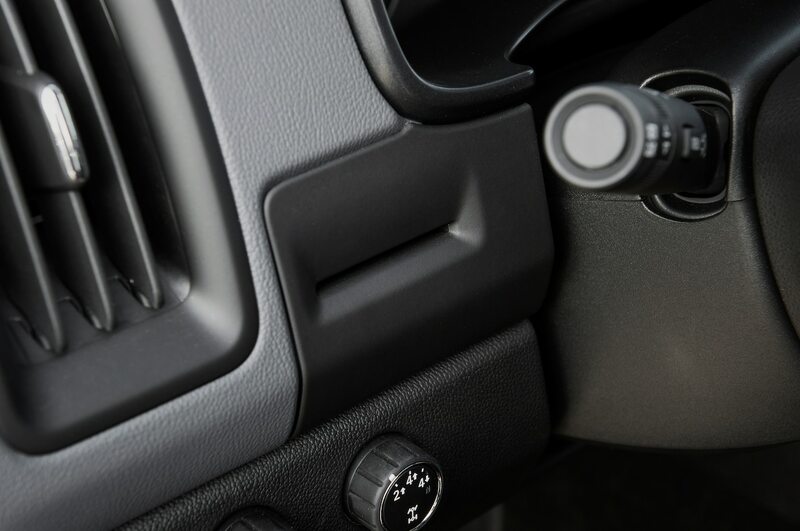 If that keeps people’s eyes on the road instead of their phone, it’s a significant safety feature. 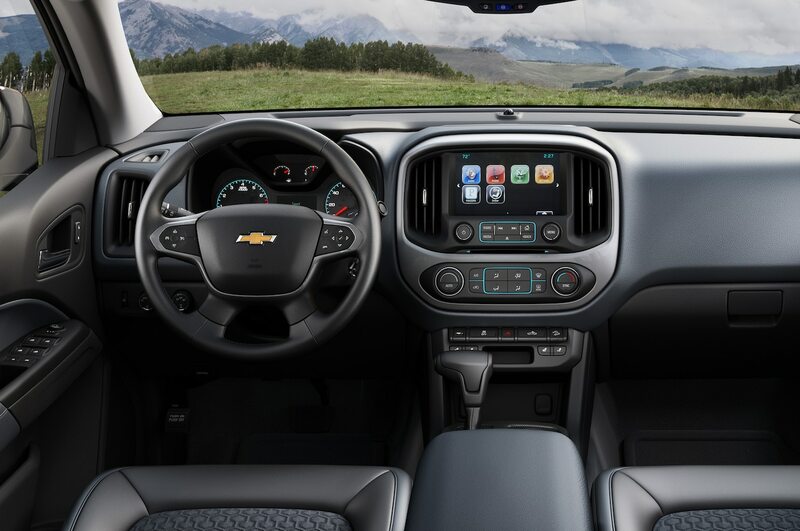 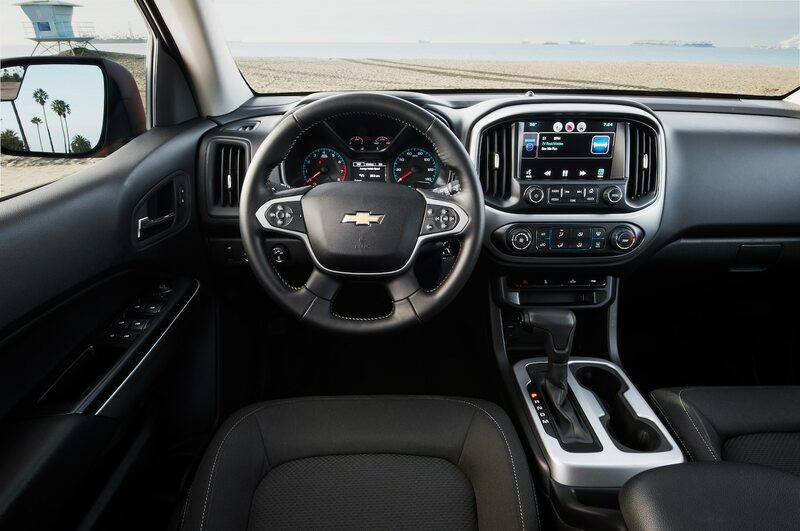 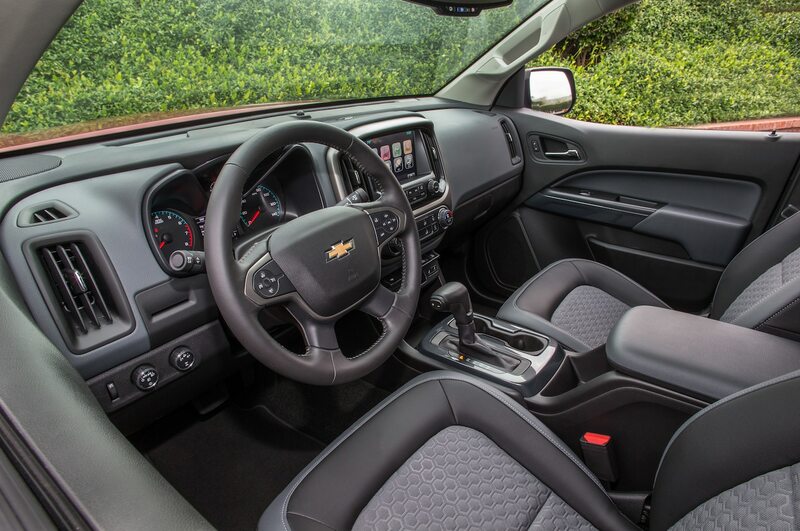 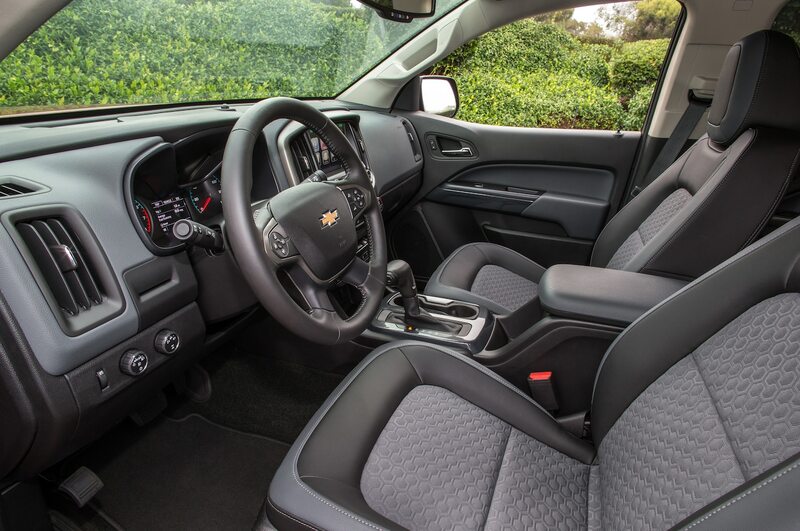 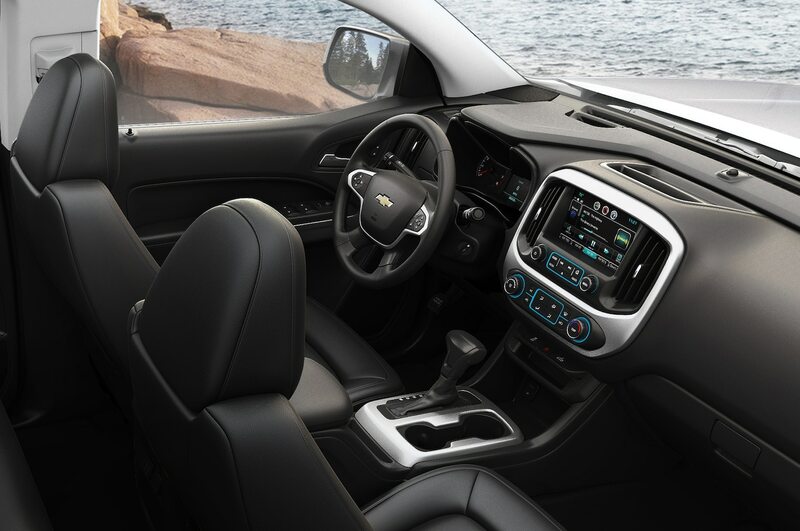 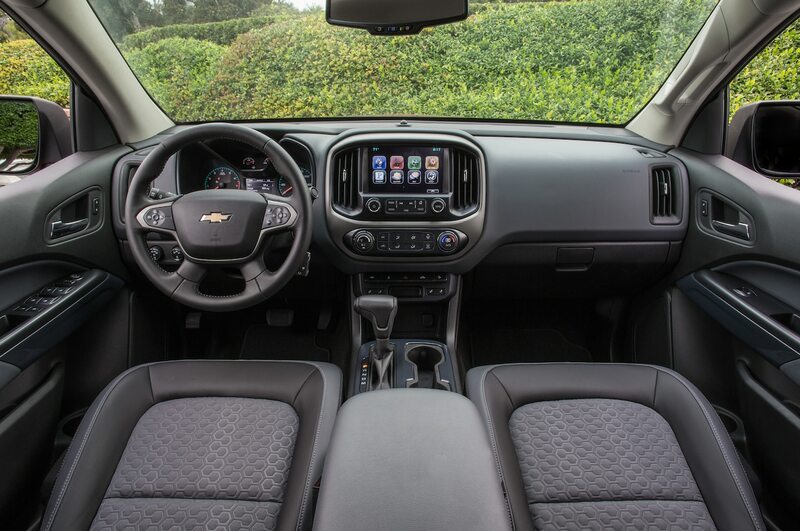 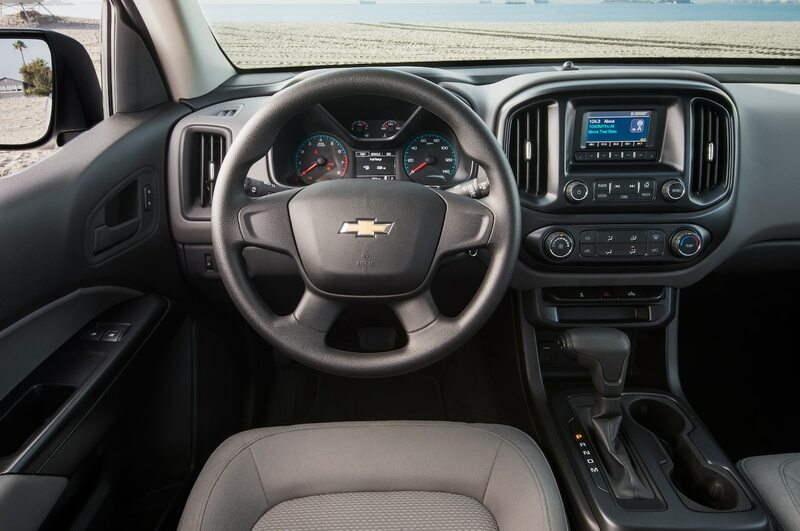 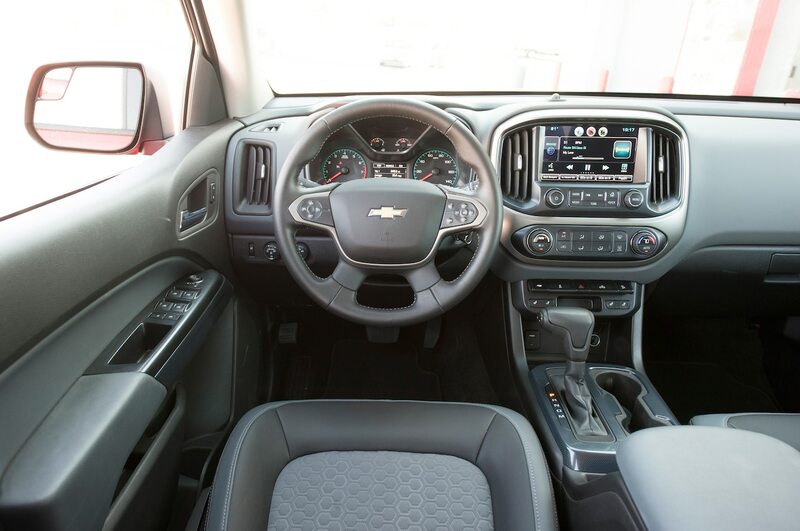 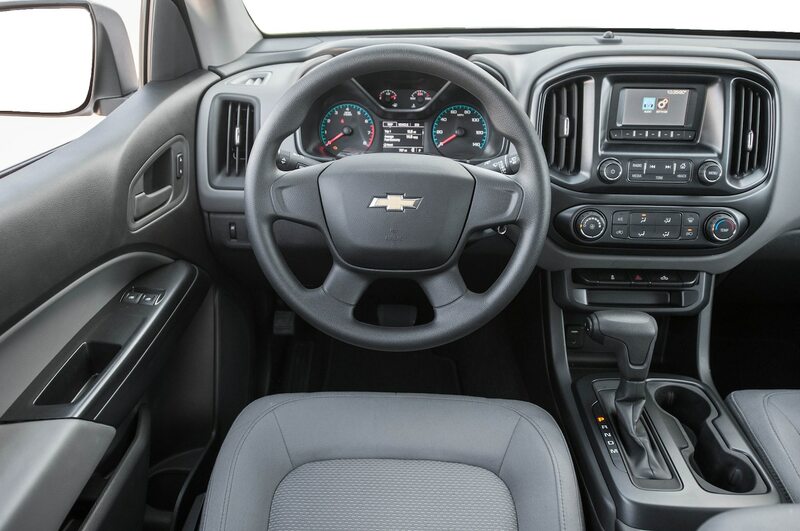 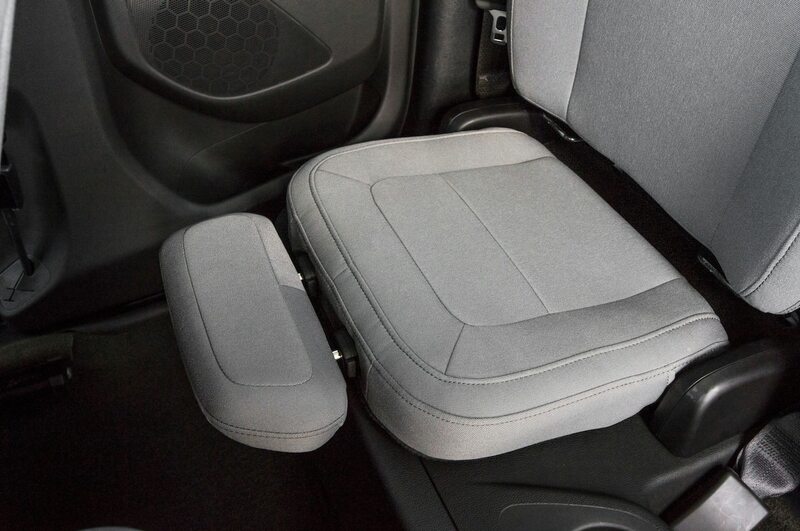 If people still foolishly look down at their phone, the Colorado comes with six airbags, and Chevy expects it to perform well in future crash testing. 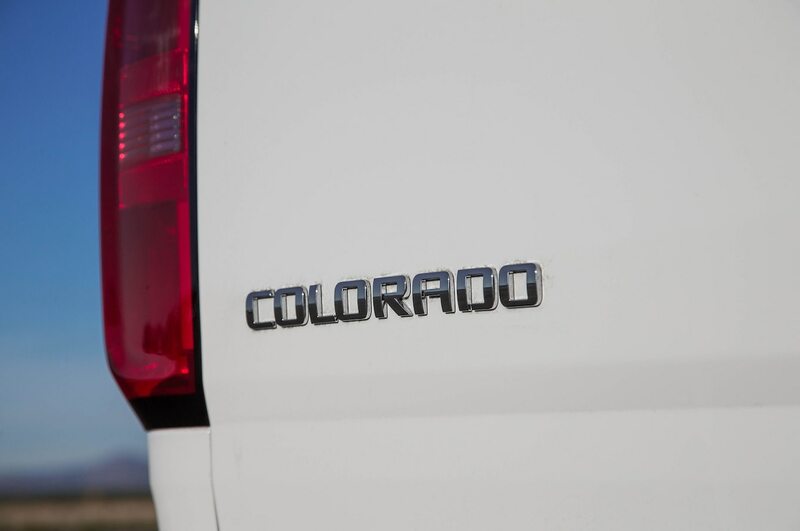 Perhaps the most impressive part of the Colorado was the base model work truck, which never felt cheap or inferior. 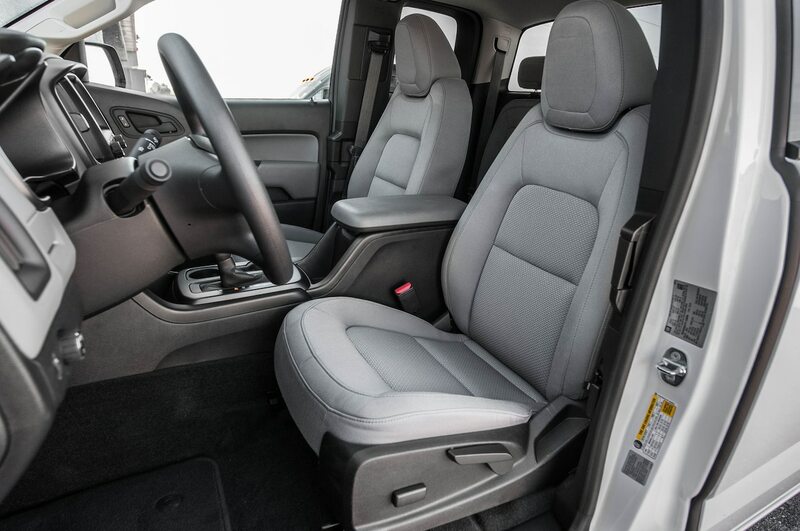 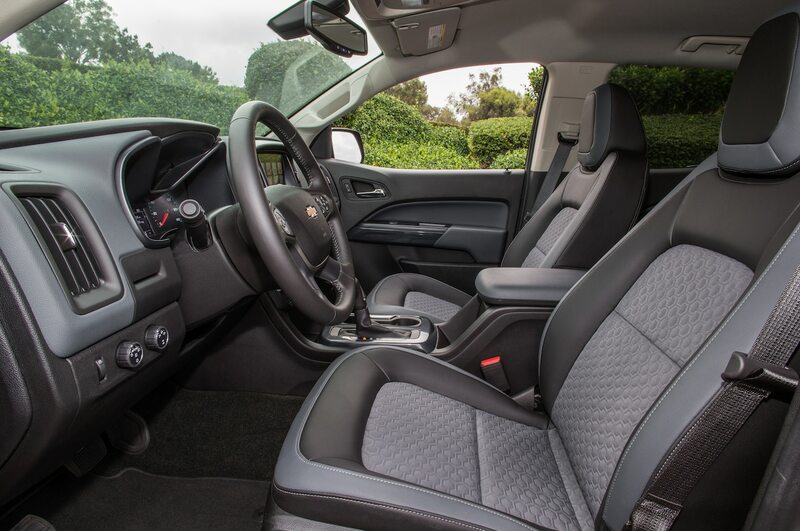 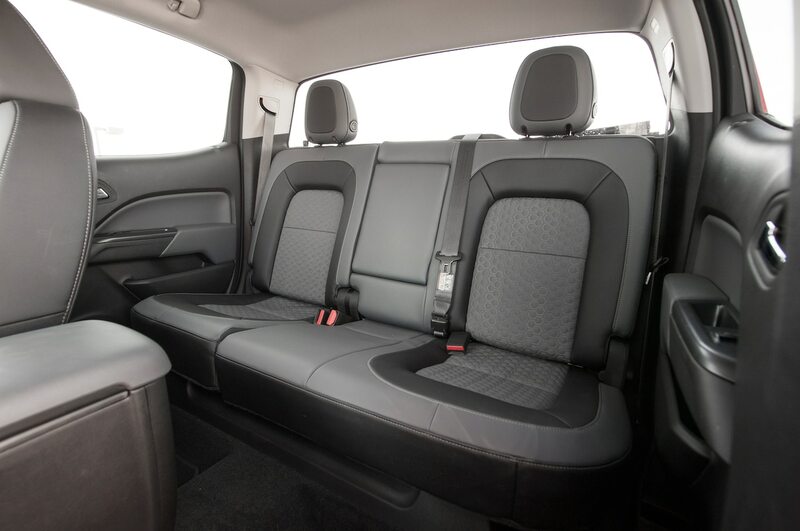 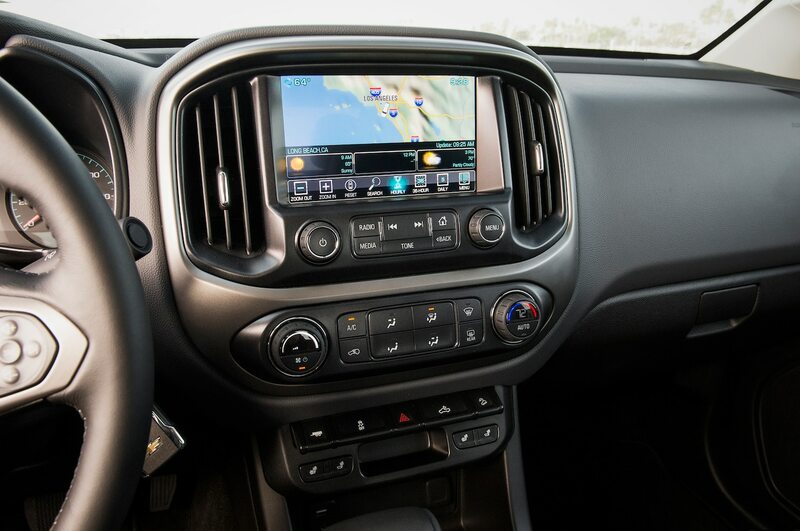 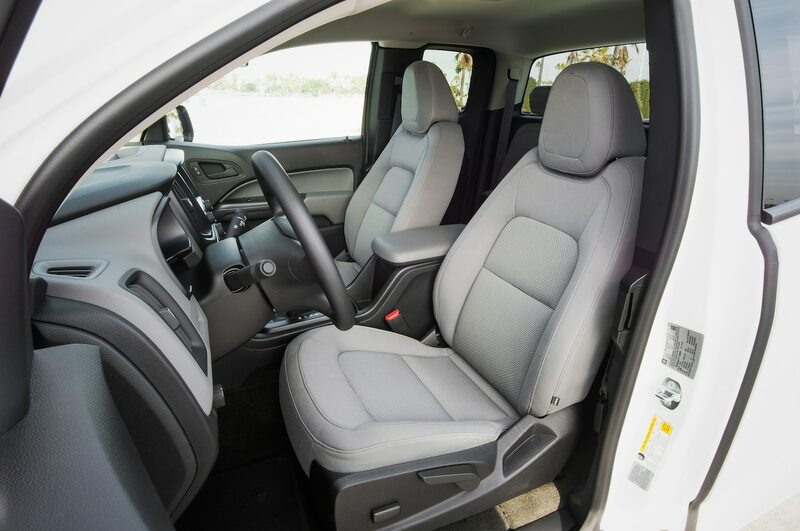 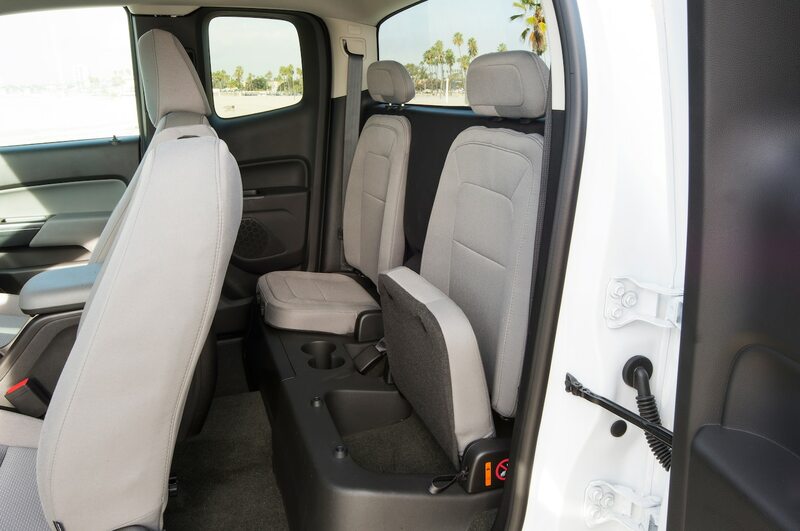 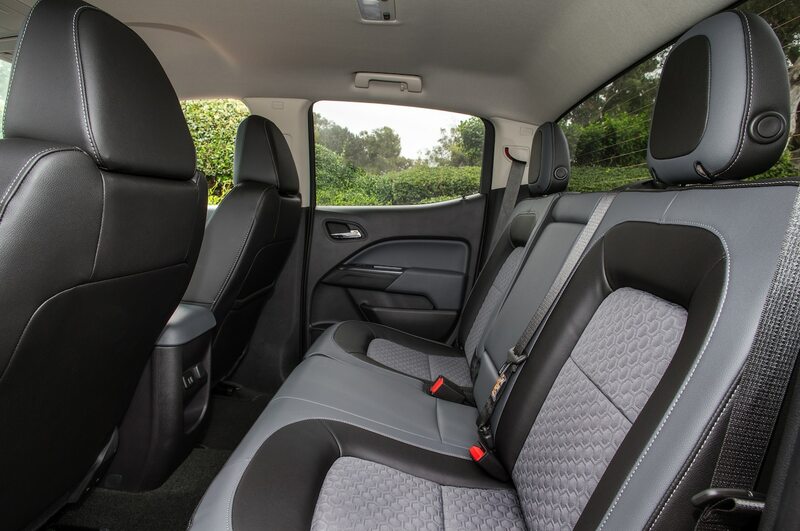 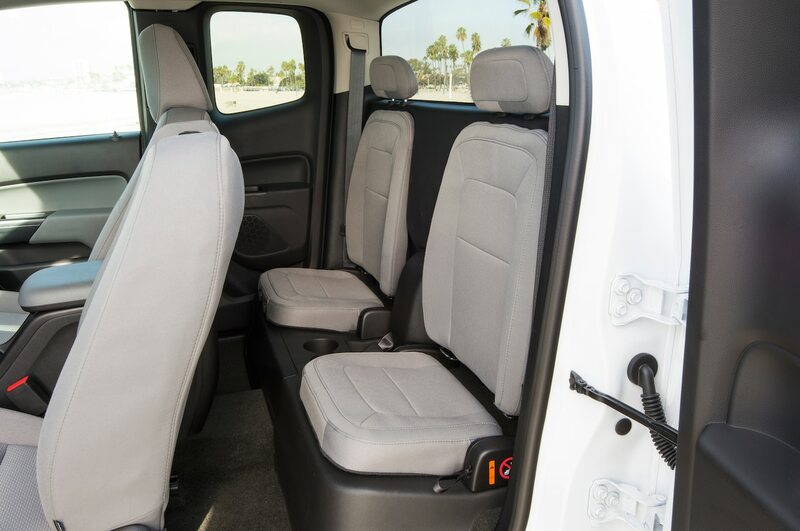 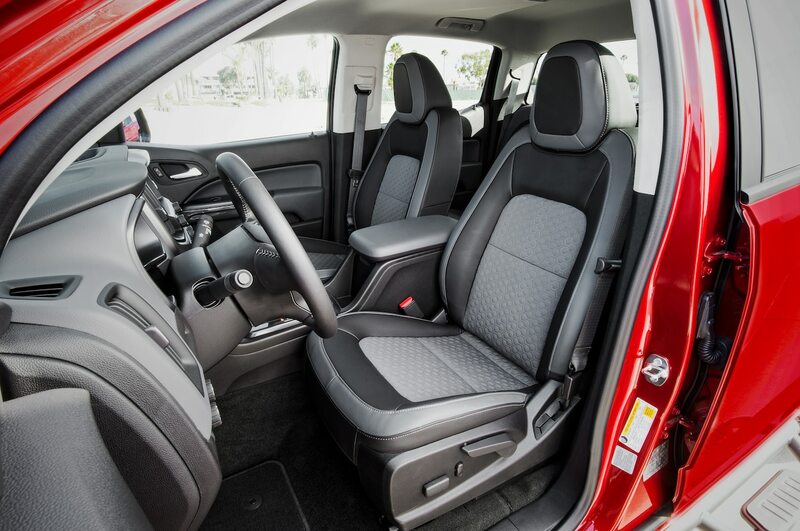 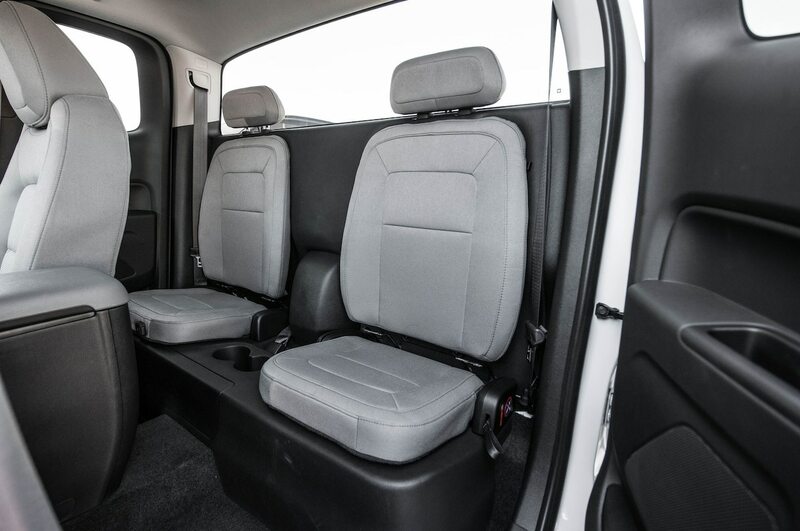 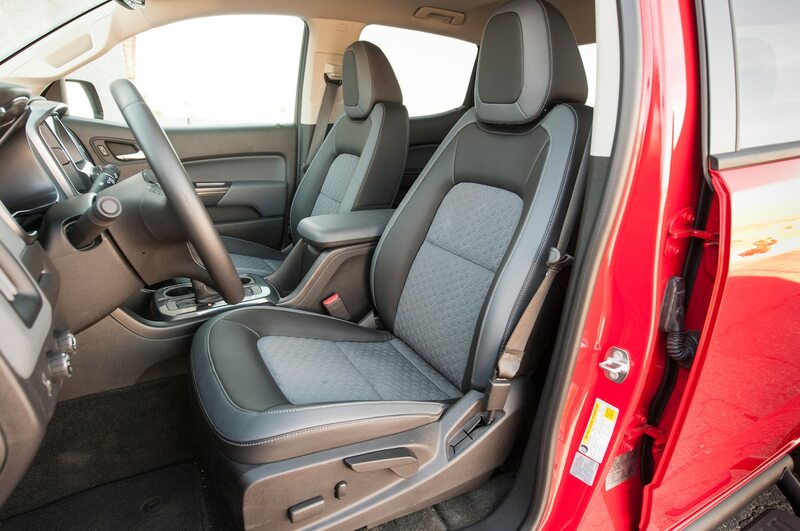 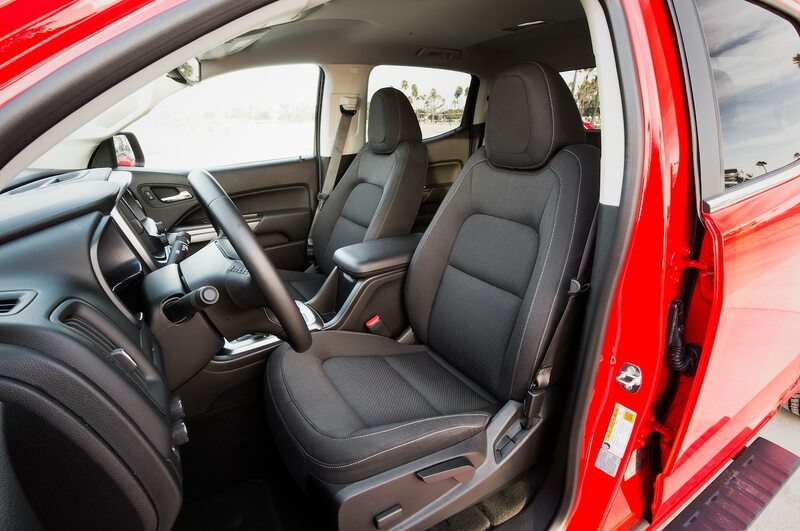 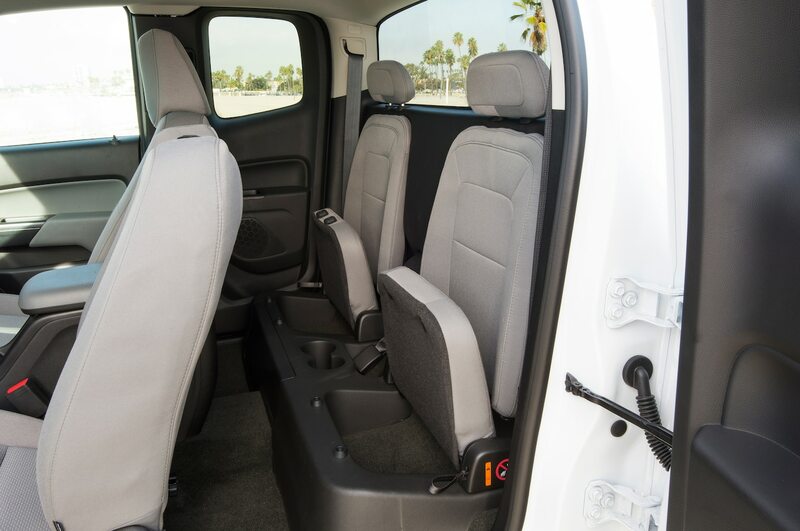 “I suspect for $23,300, many fleet drivers would be very satisfied with the Colorado because it has A/C, a meaty center armrest, nice cloth selection, and much more manageable overall size,” Kong said. 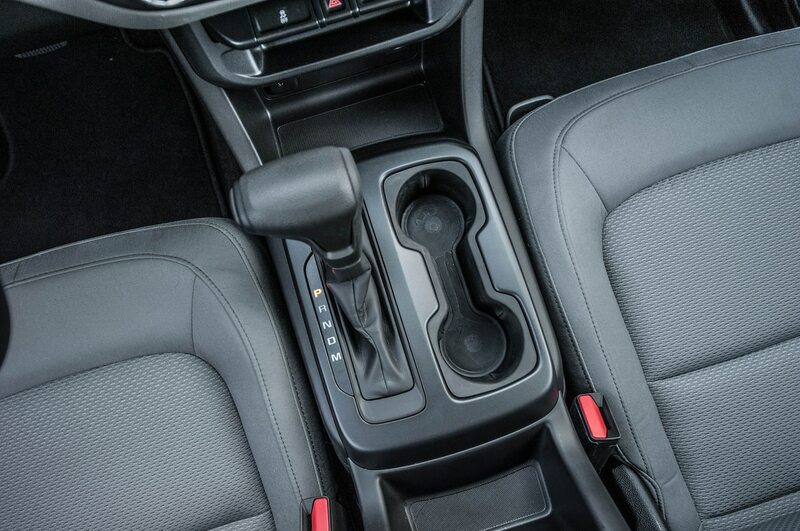 There are also a slew of standard features. 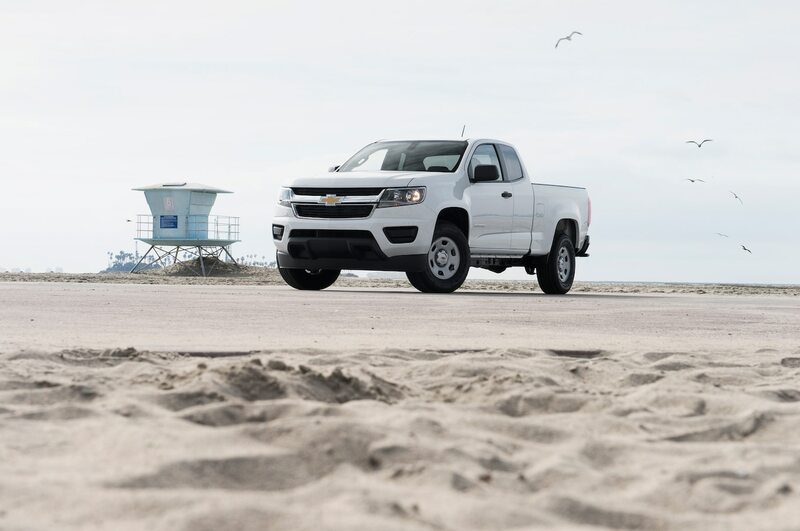 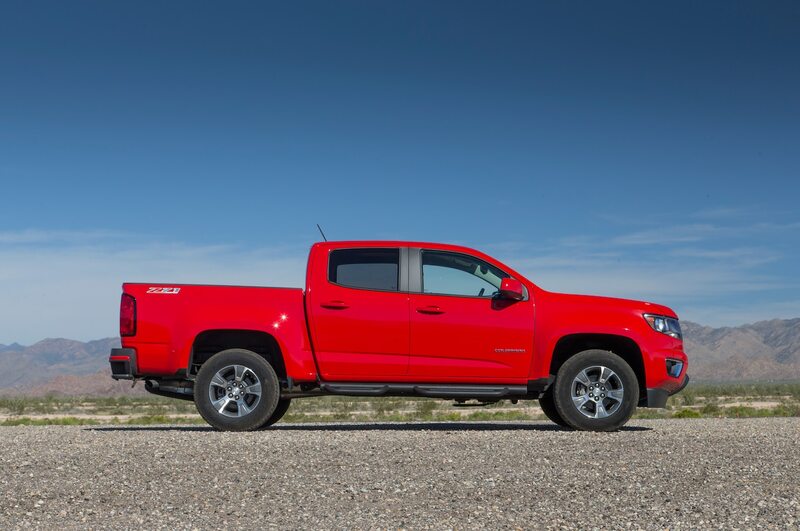 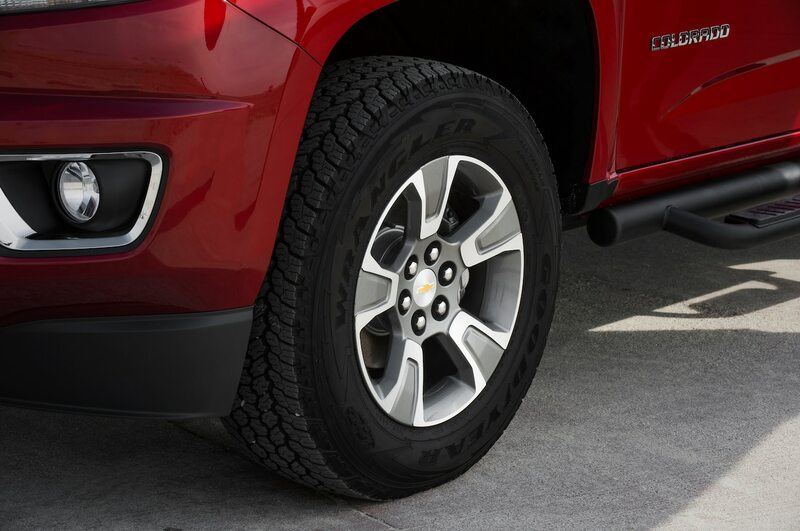 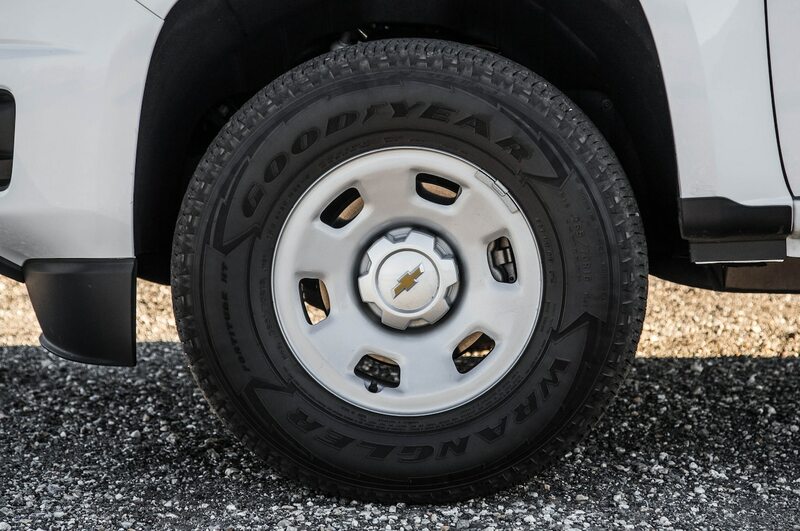 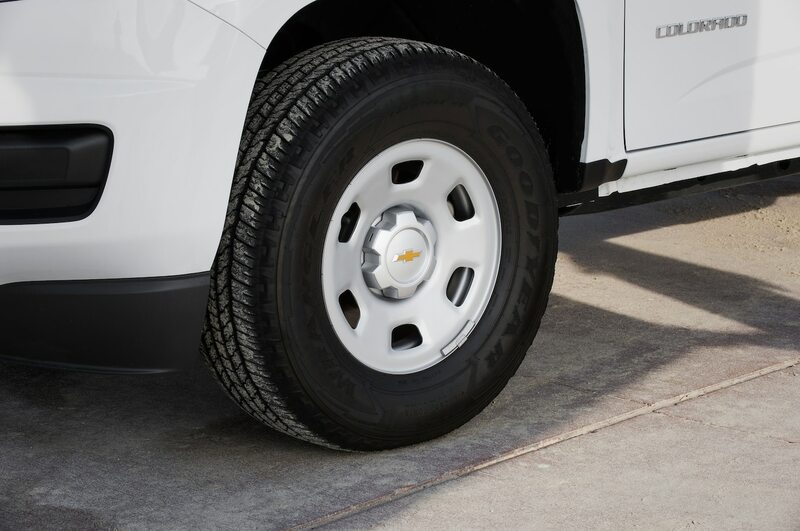 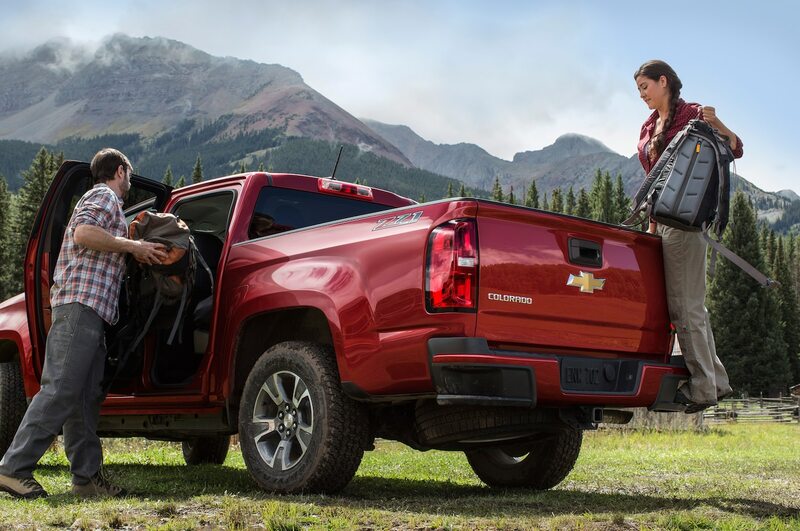 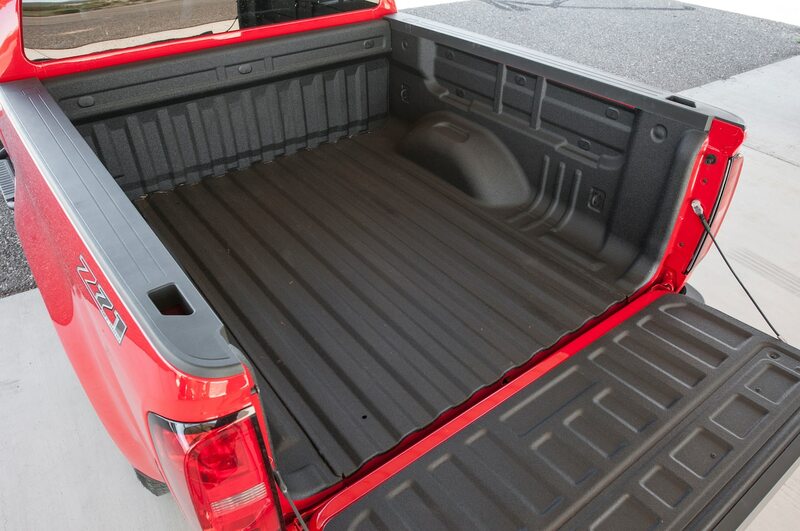 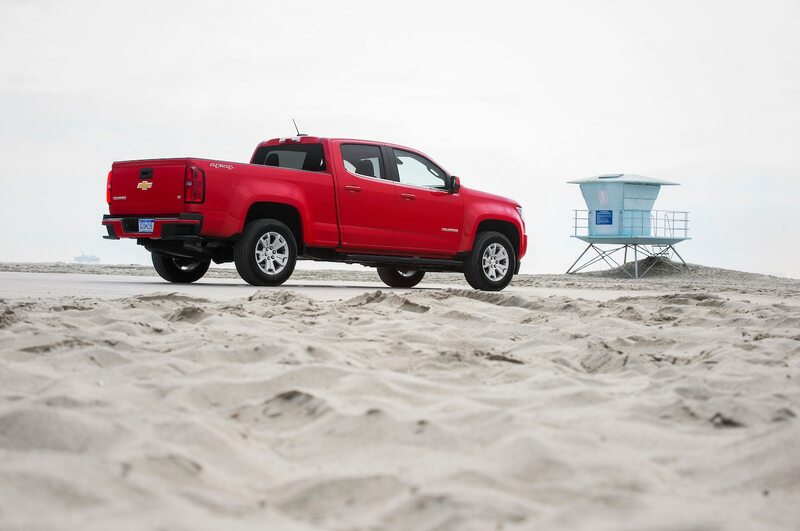 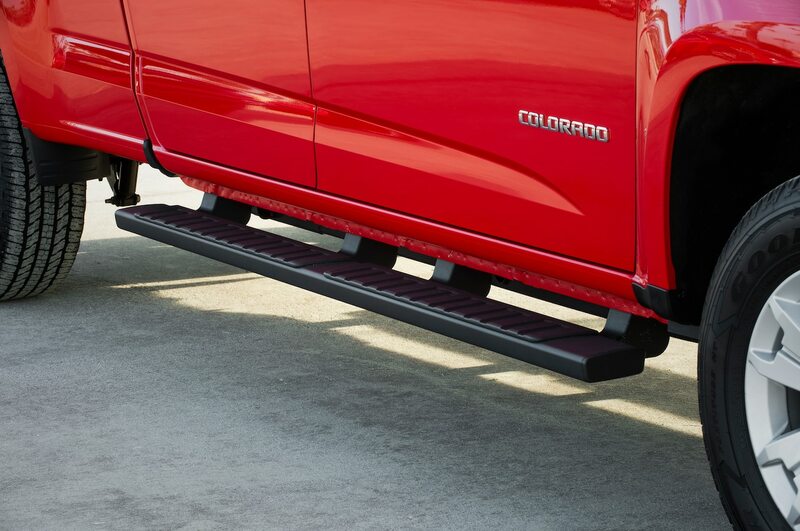 Some were developed for the Silverado and passed down to the Colorado, such as the CornerStep, which creates a foothold in the bumper so you can easily climb up into the bed. 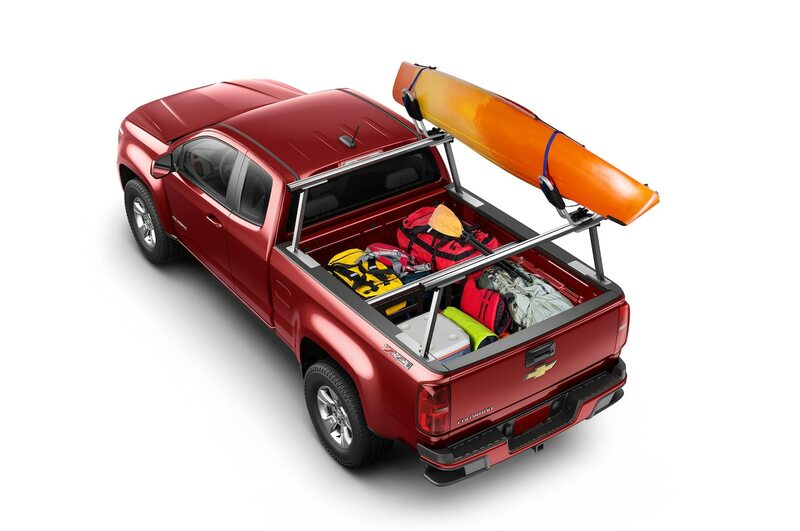 There are also 13 tie-down locations in the bed and optional moveable cargo rings that make it easier to rope down any load. 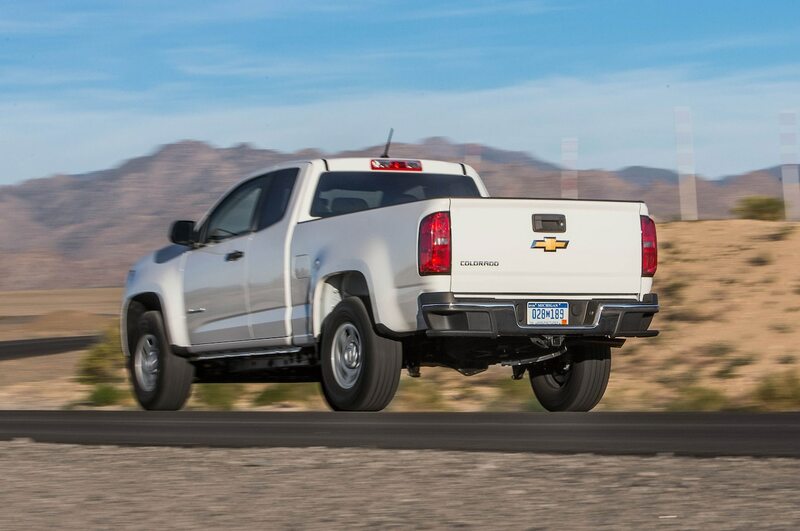 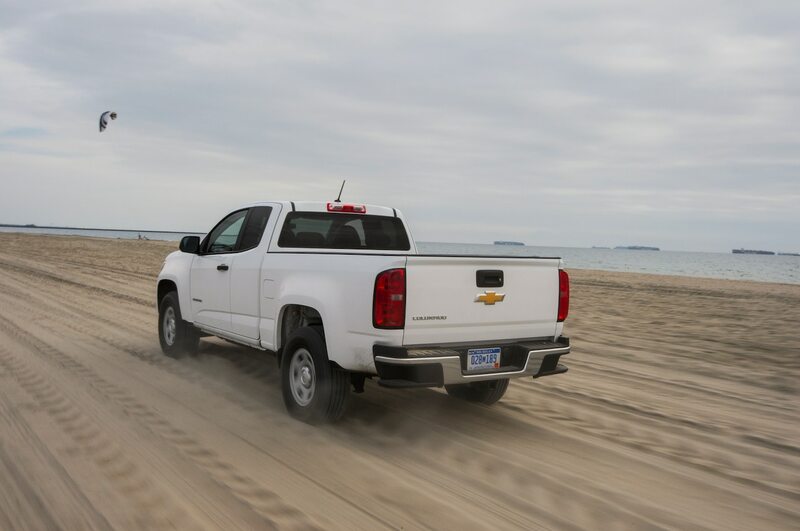 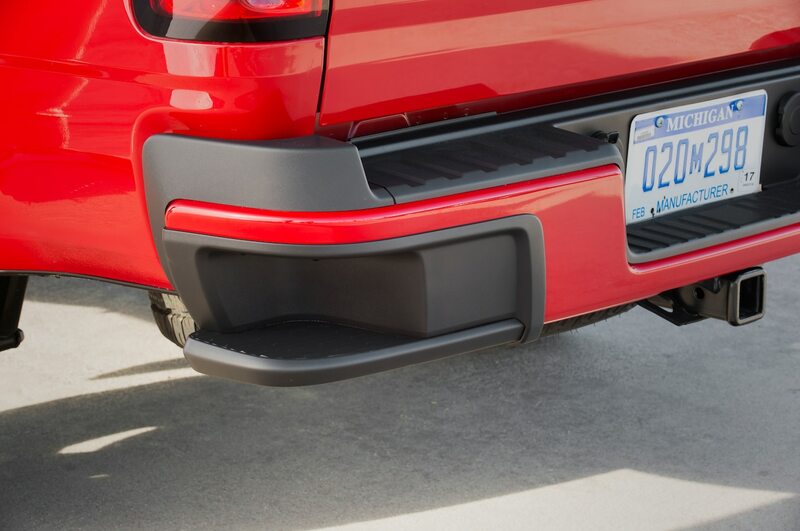 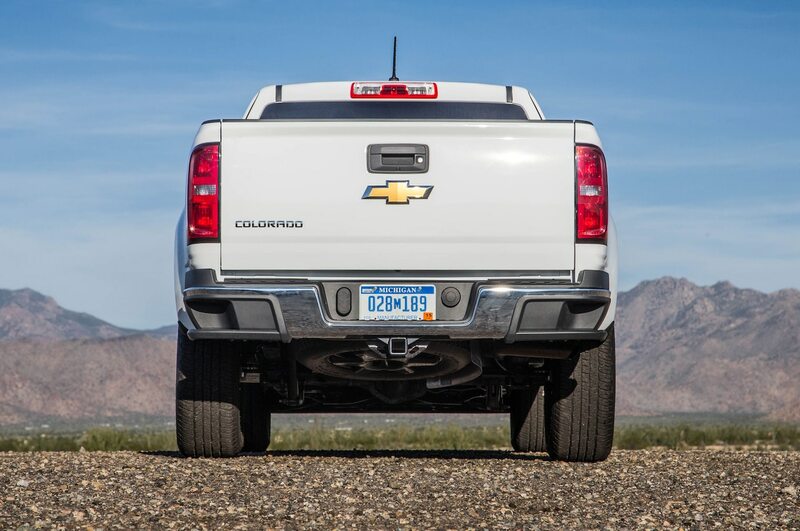 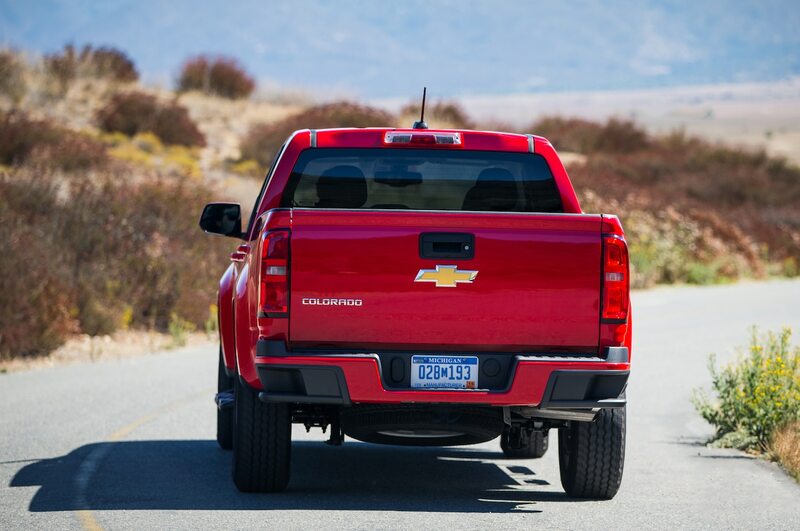 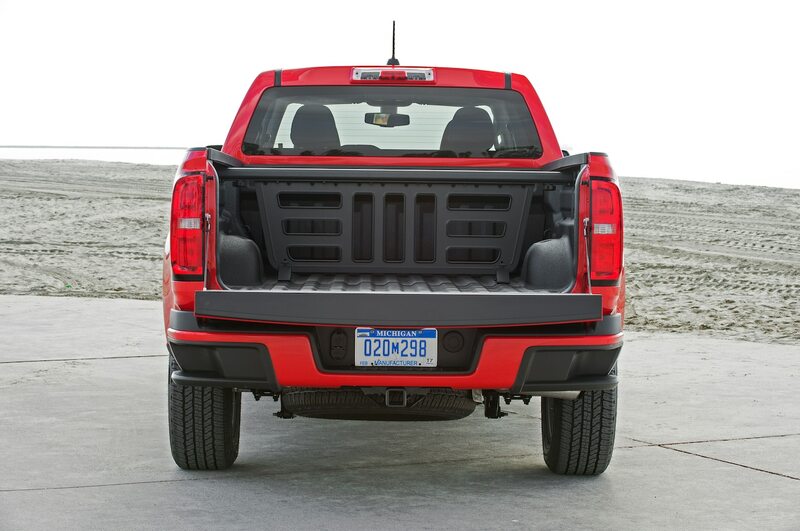 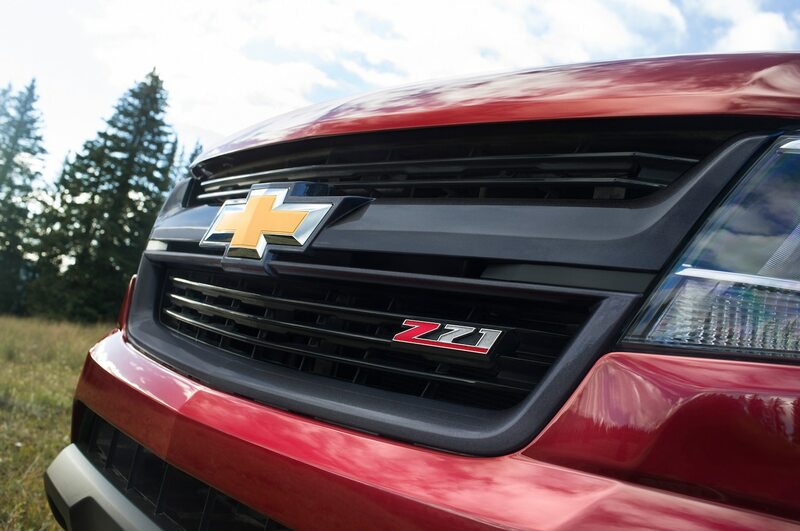 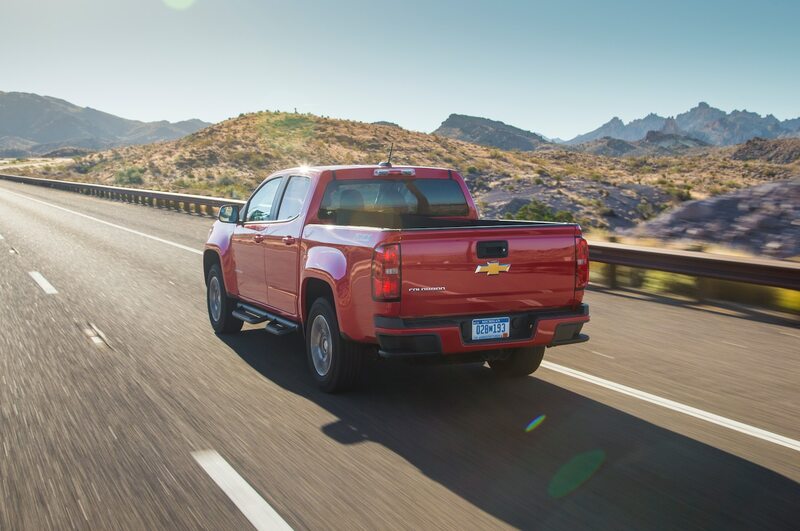 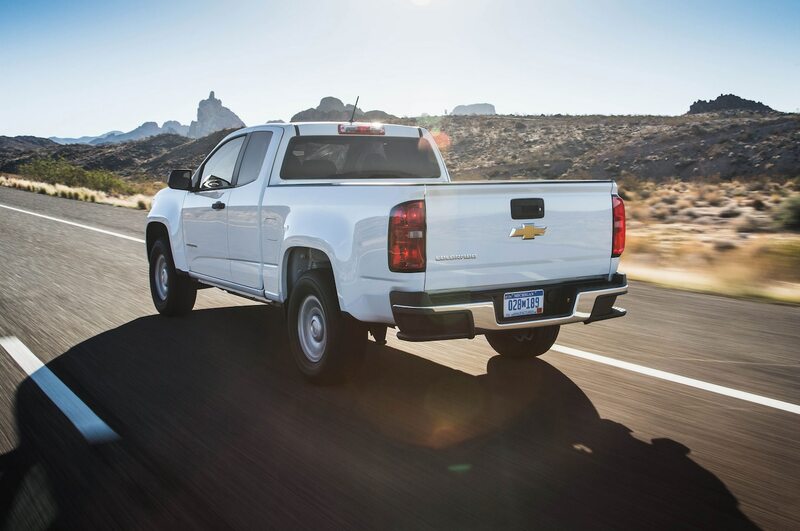 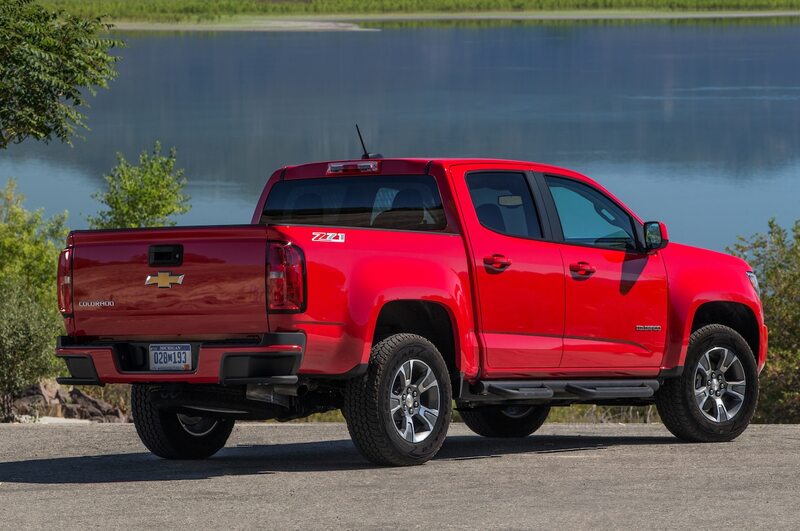 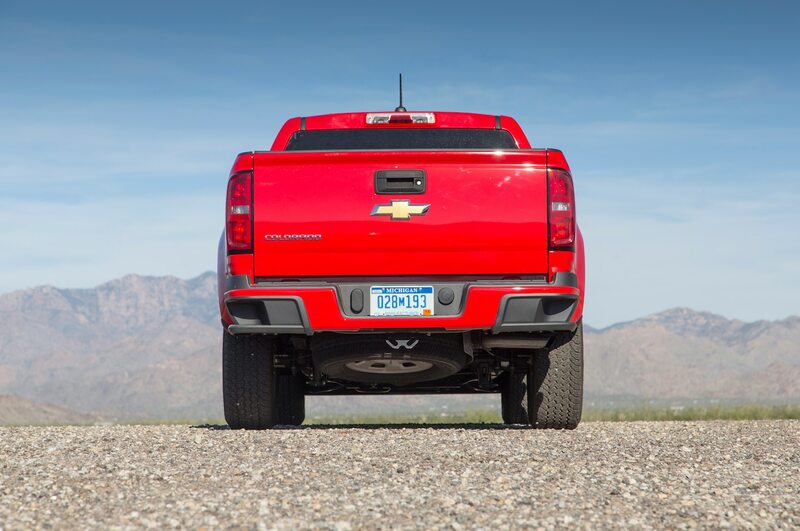 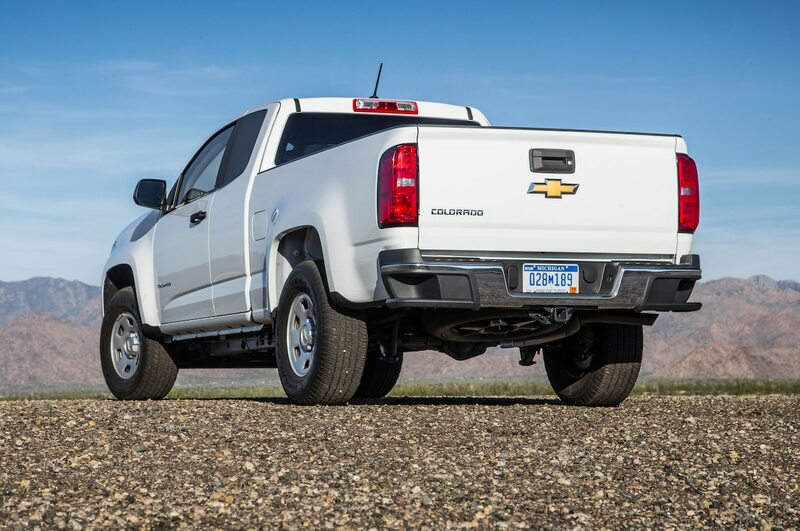 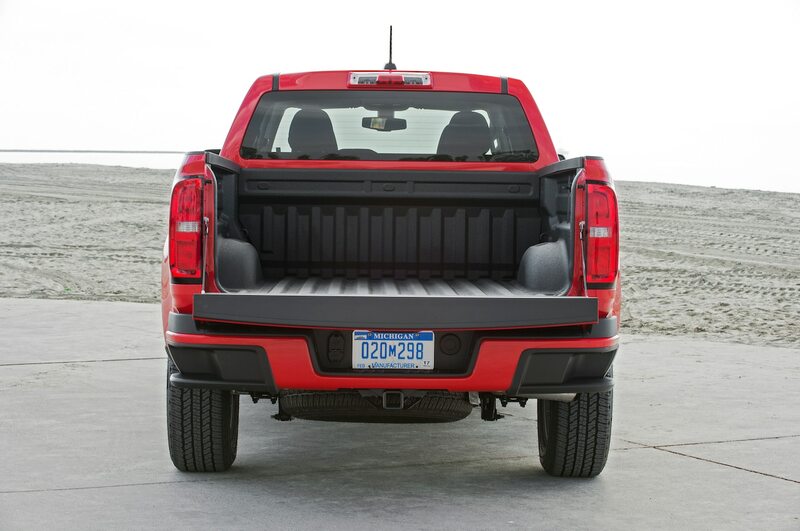 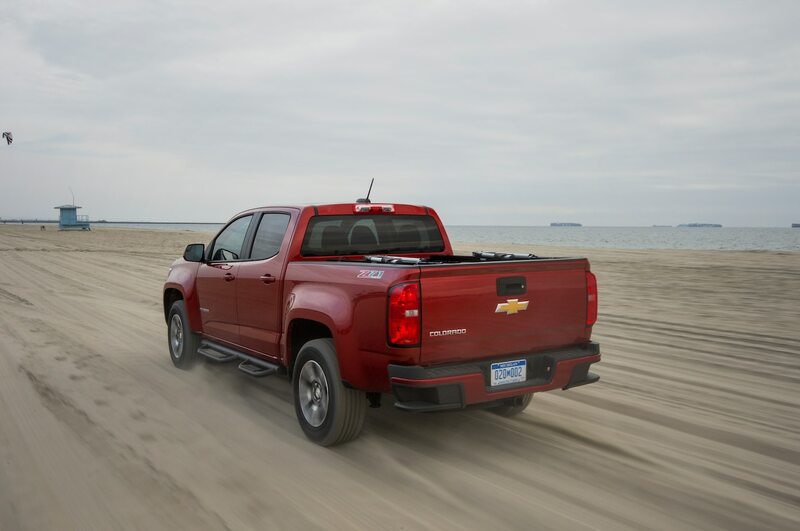 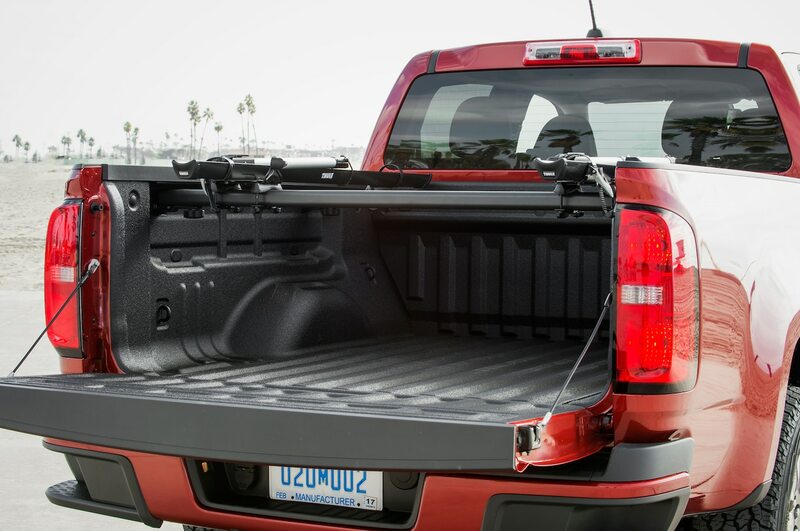 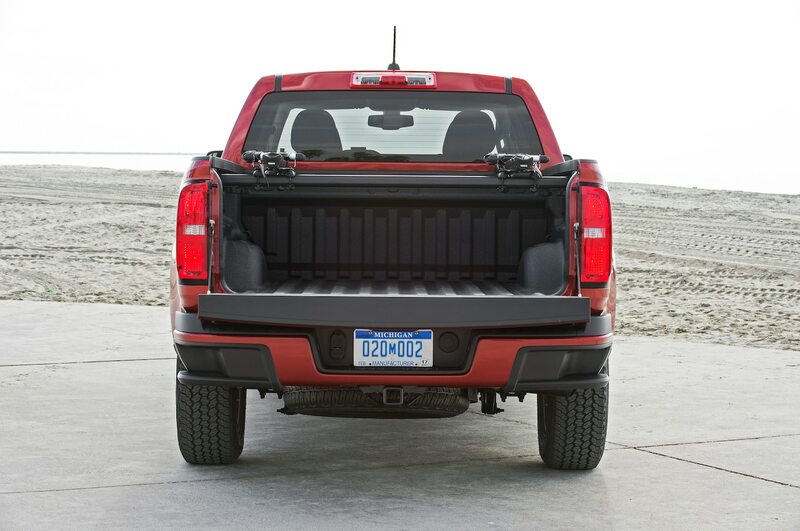 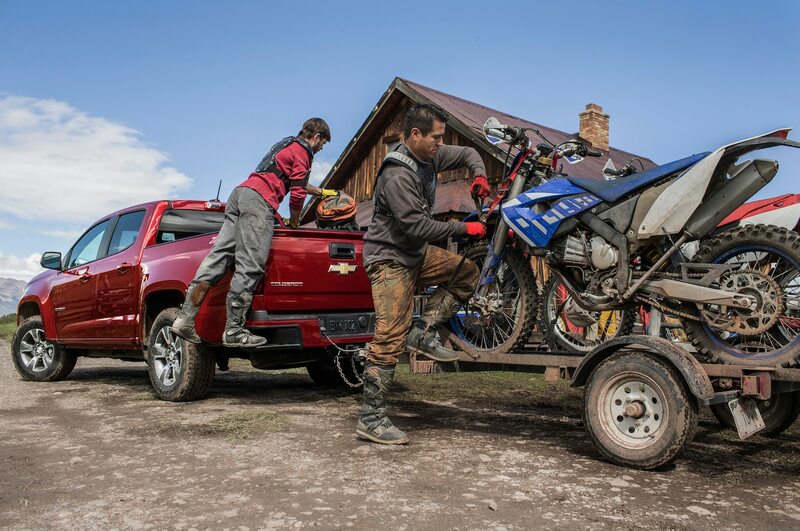 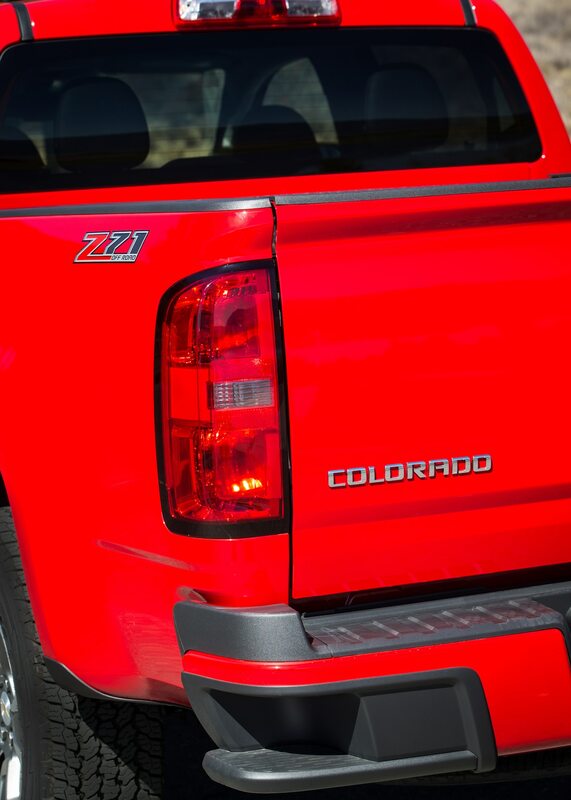 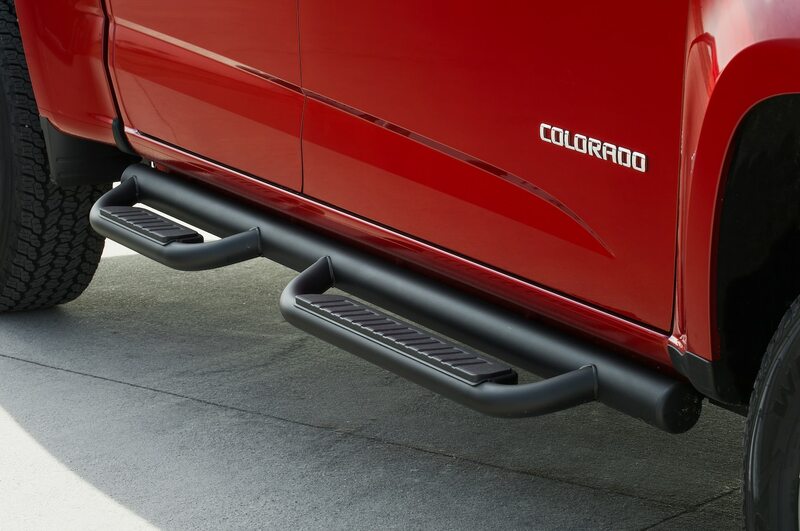 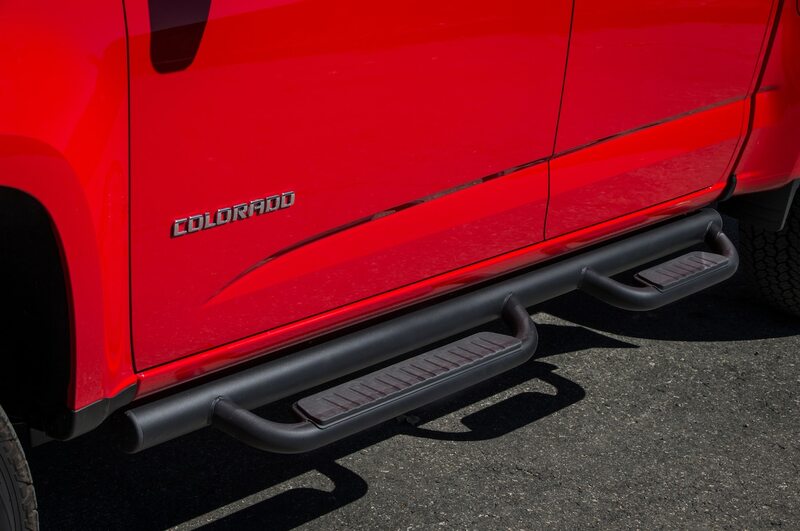 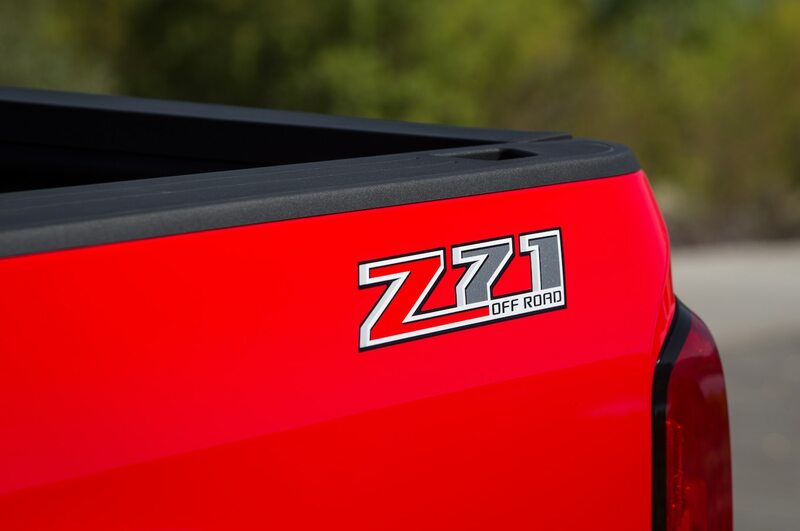 On the Z71 model, the EZ-Lift-and-Lower tailgate uses a torsion bar to reduce the effort needed to open and close the tailgate. 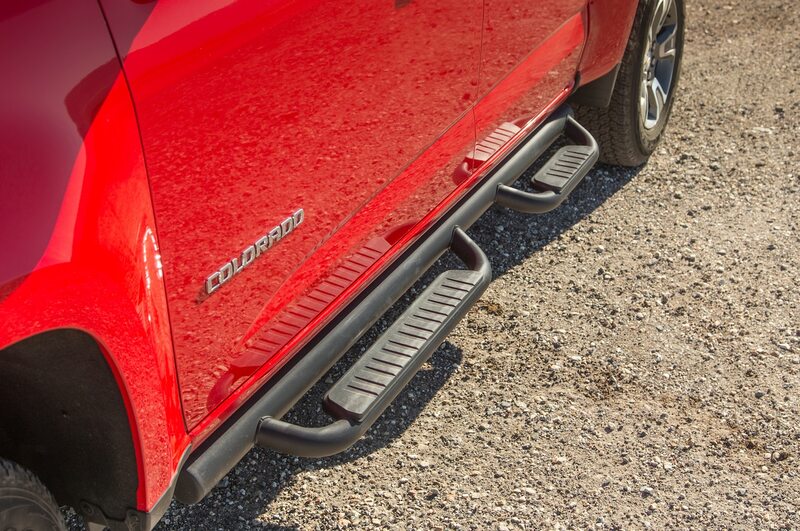 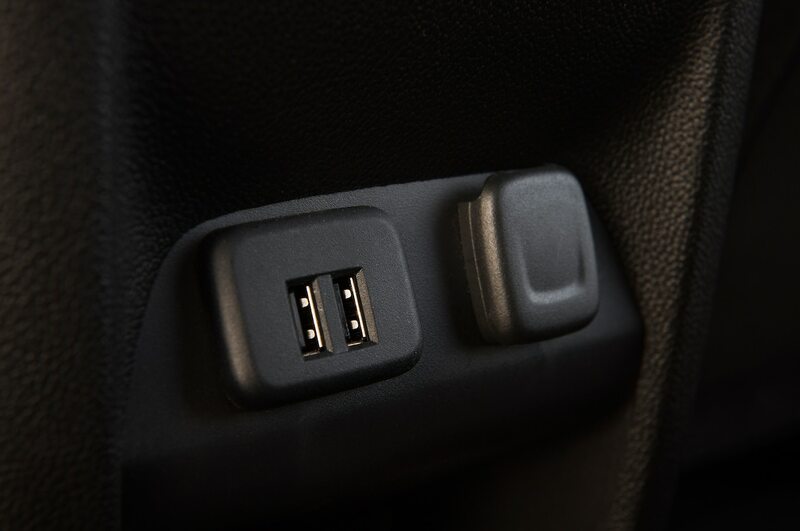 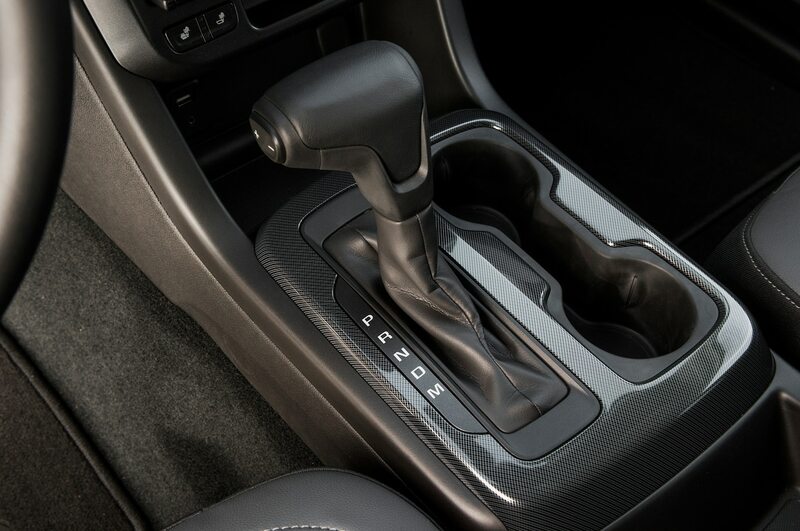 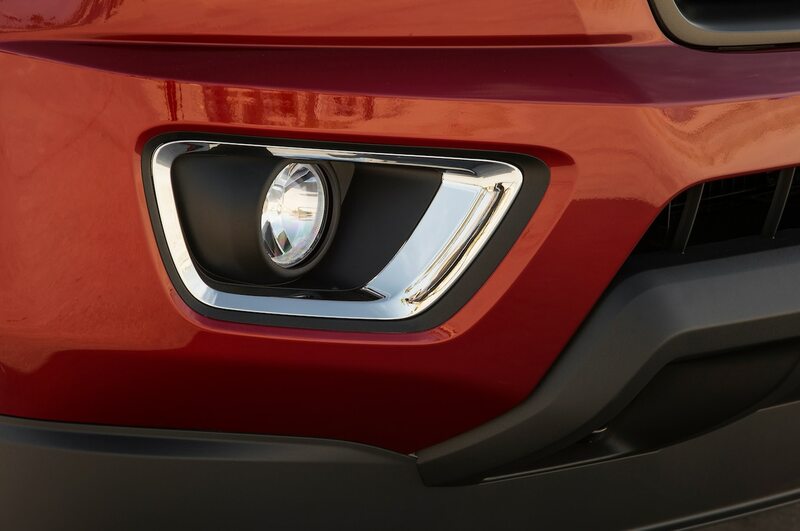 These aren’t necessarily new features to the truck market, but they are thoughtful additions to the Colorado. 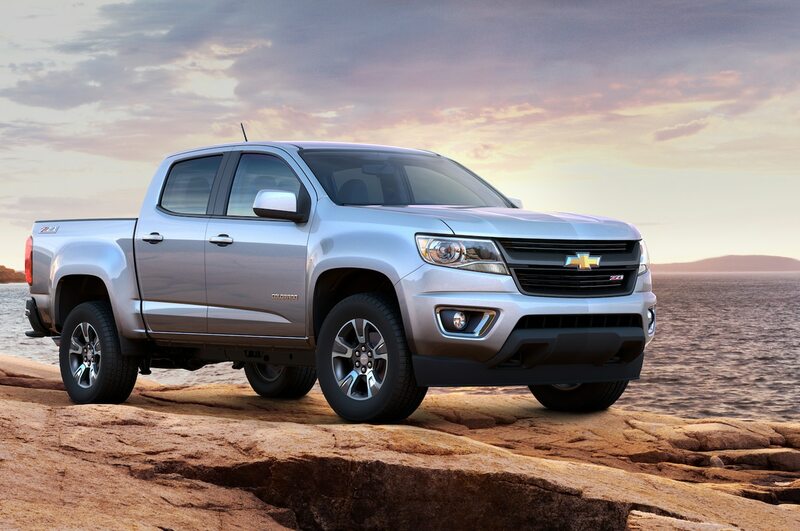 The Colorado is more than just #TechnologyAndStuff. 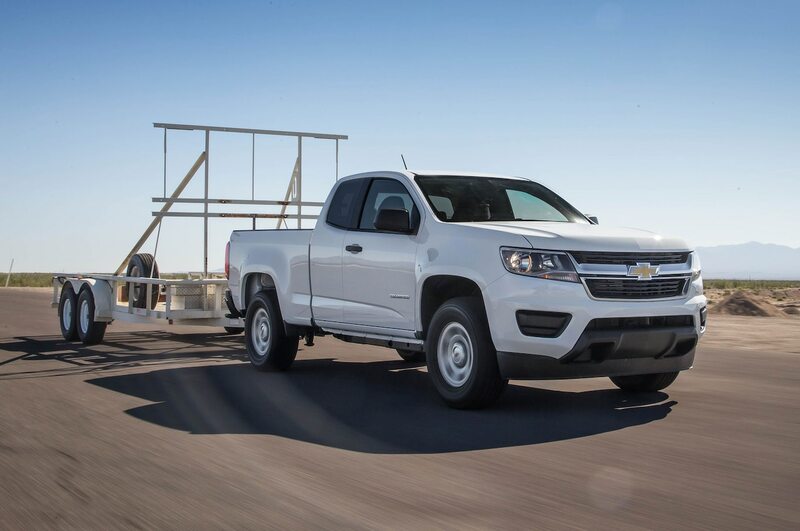 “The extra bells and whistles look great and work well — just like a mini Silverado — but don’t diminish the base model as much as you might think,” Loh said. 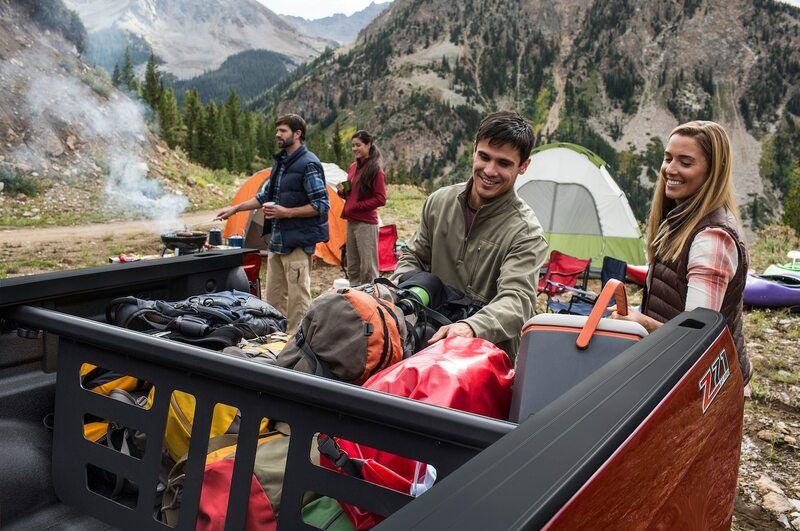 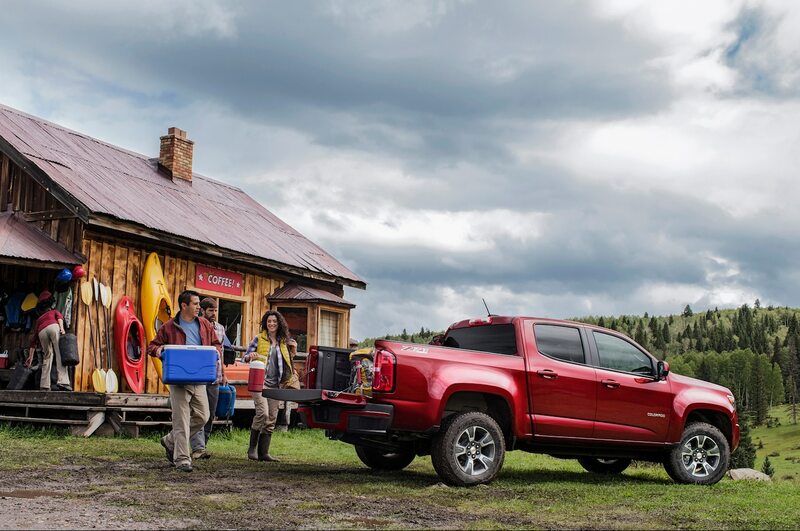 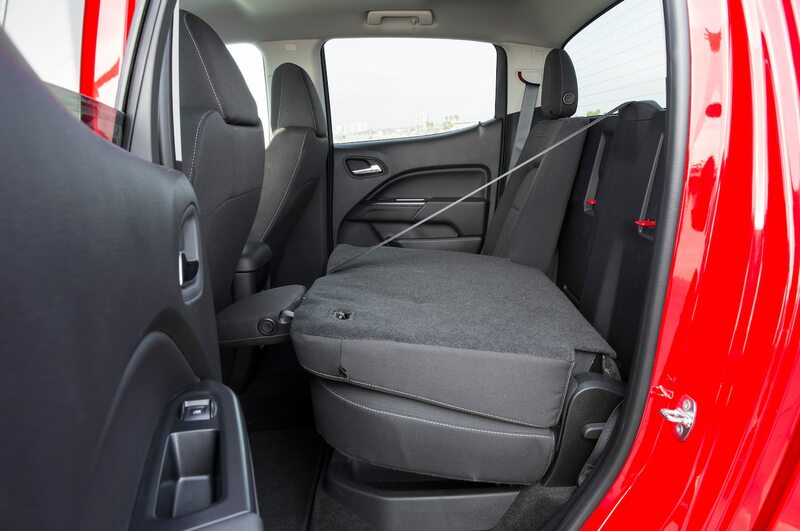 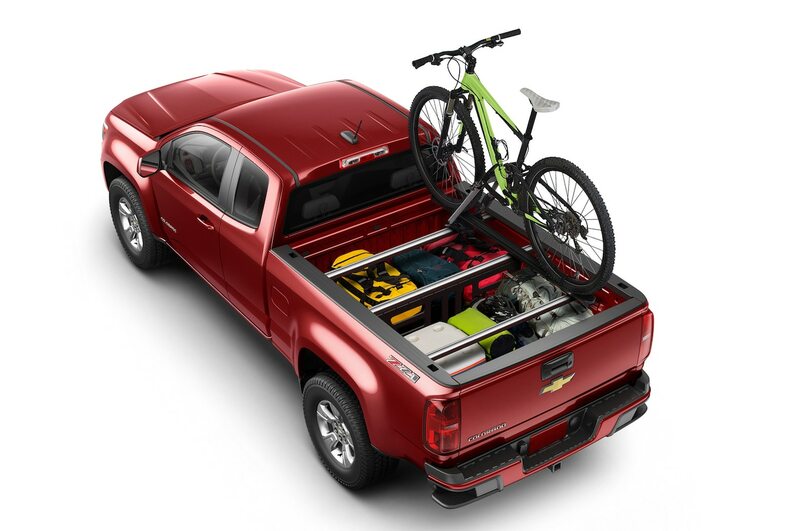 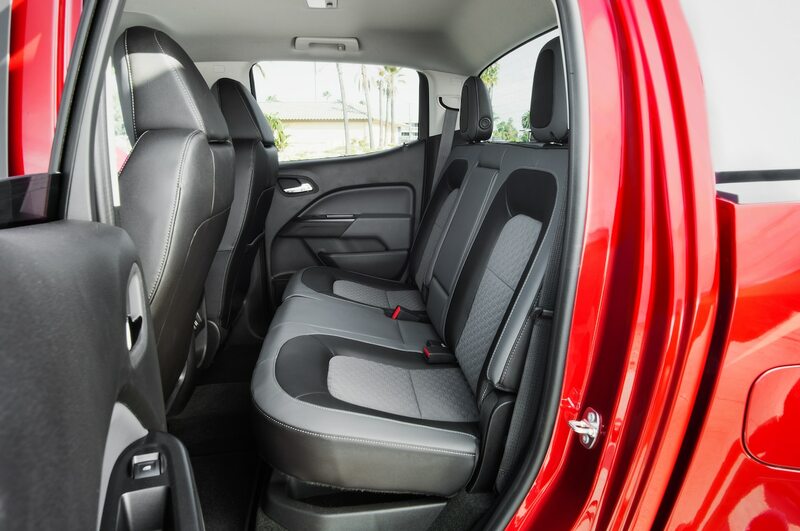 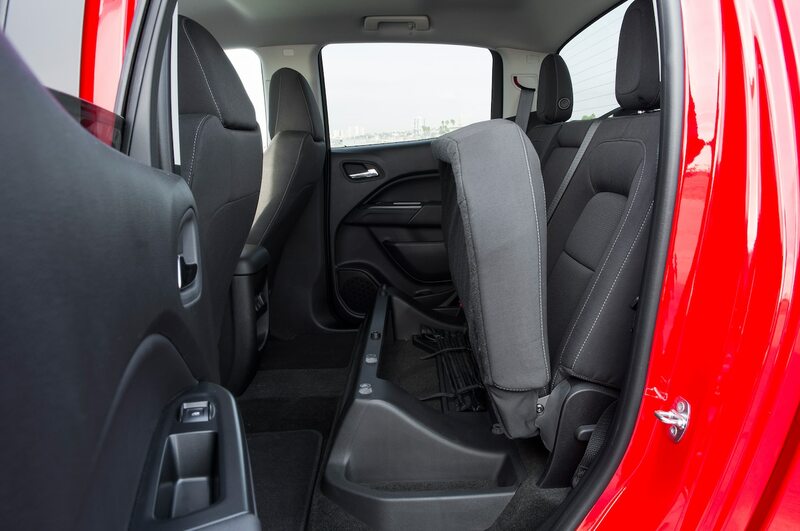 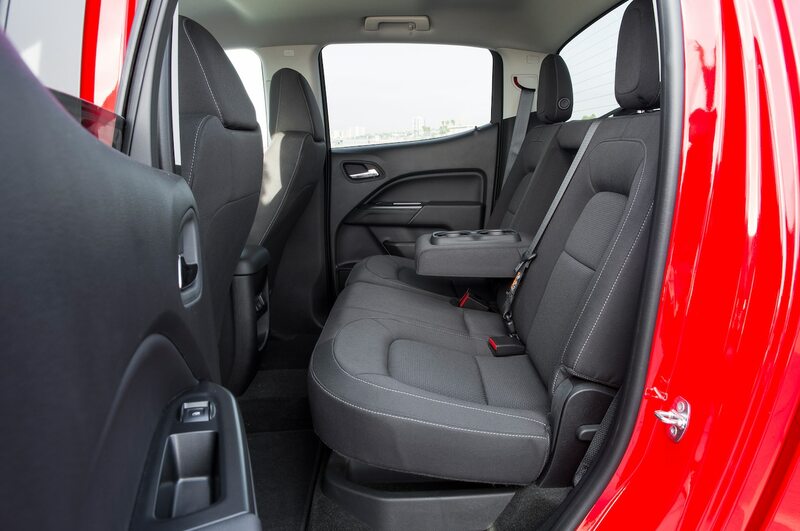 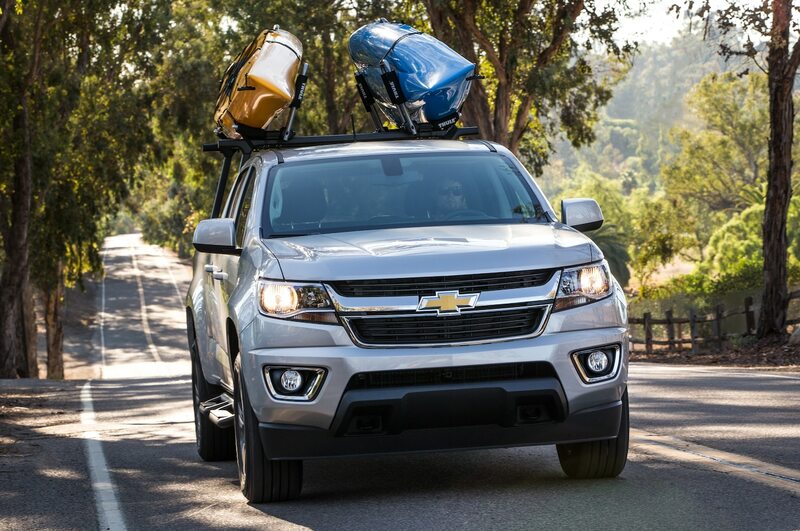 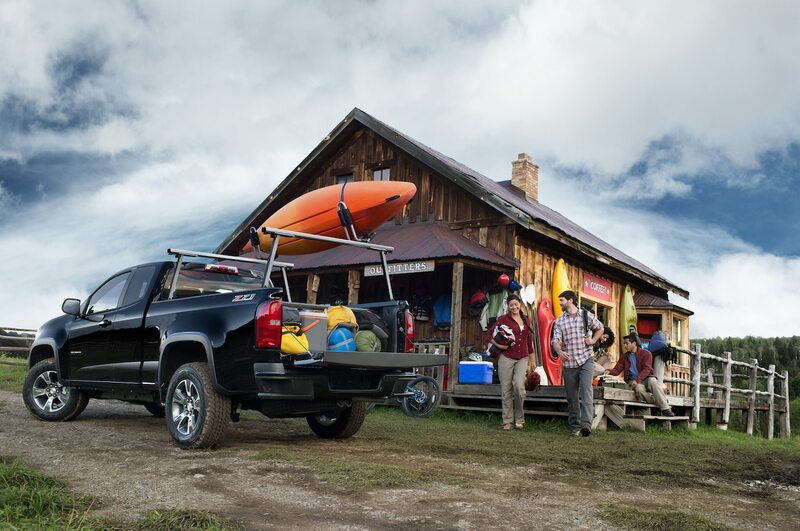 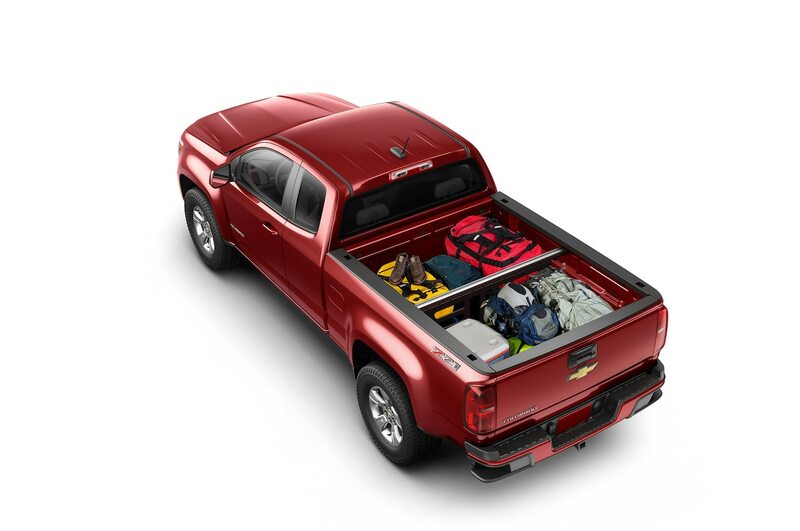 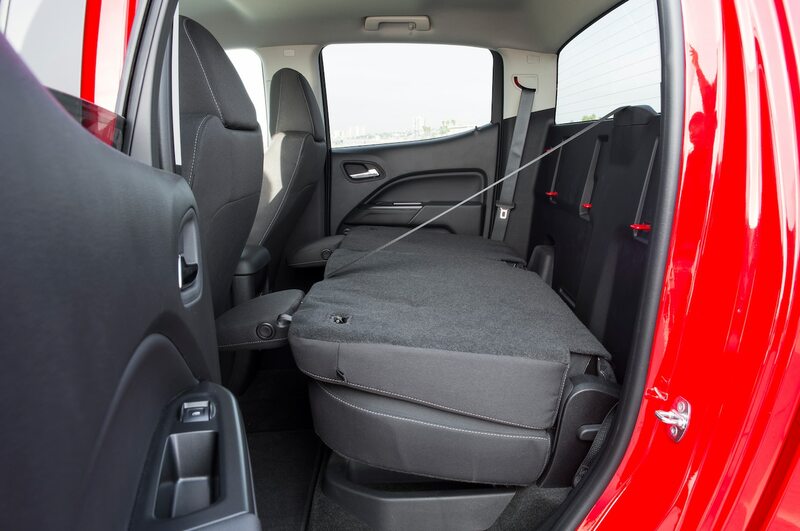 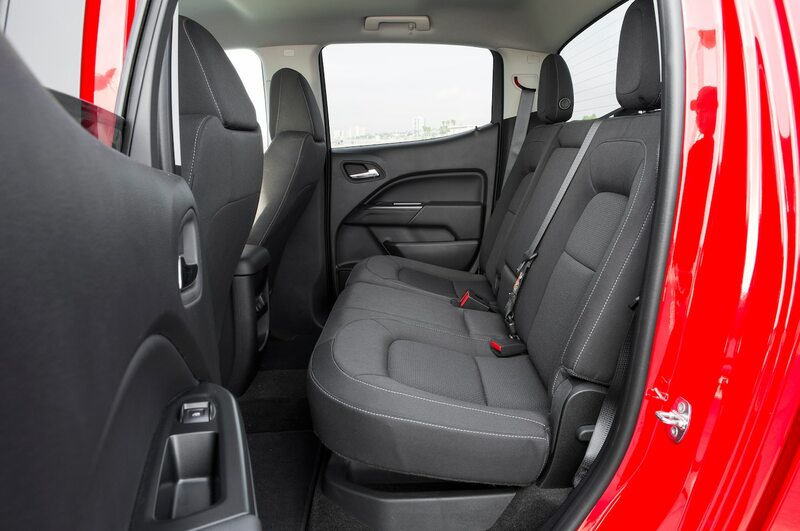 Like a Ronco knives commercial, the Colorado seemed to say, “But wait, there’s more.” Chevy loaded it up with storage bins and places to hold all the stuff a driver might need inside the cabin. 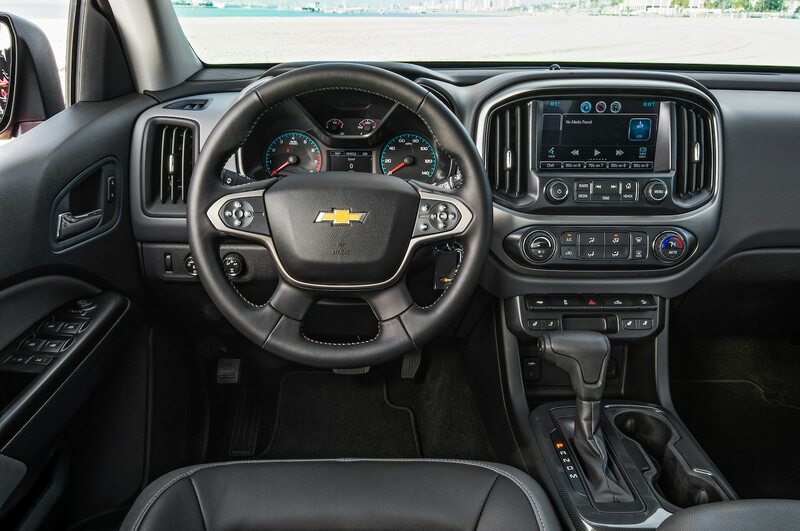 There’s even a 3.5-inch digital screen on the instrument cluster that provides the driver with trip computer and vehicle and eco-coaching information. 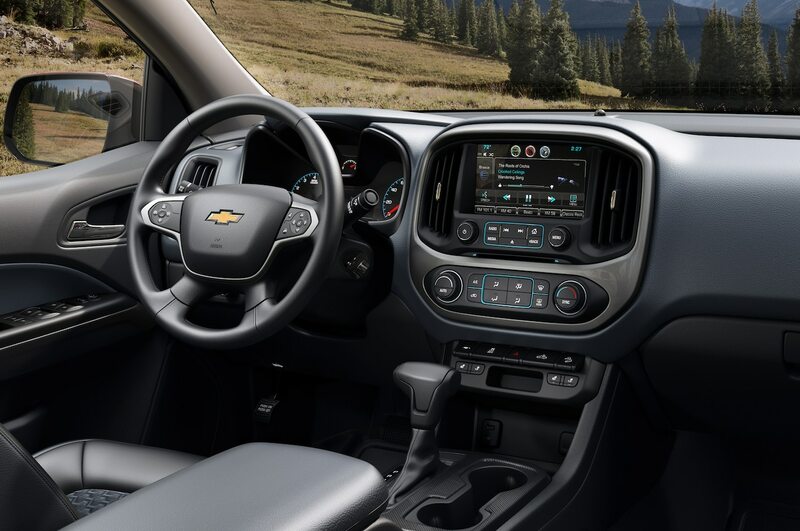 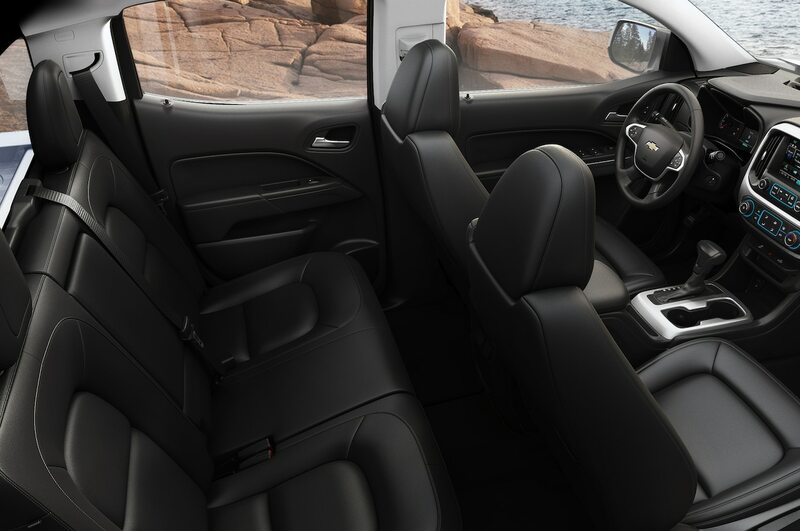 The Colorado’s interior is more loaded than a Wendy’s baked potato. 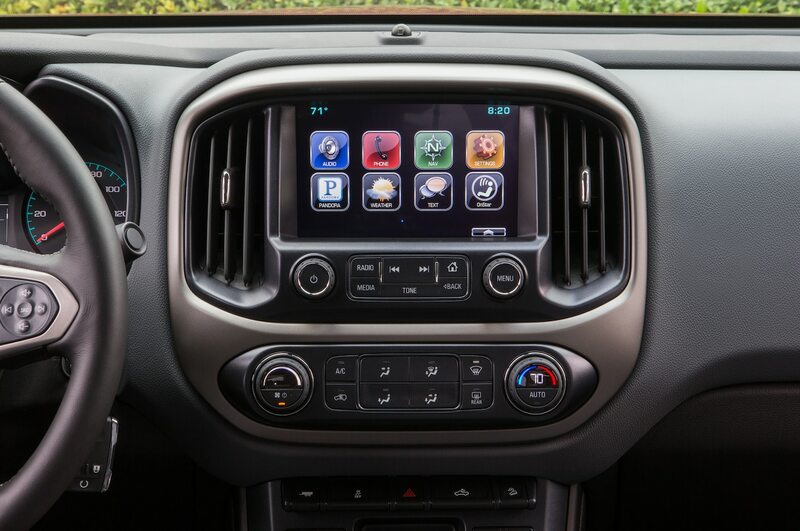 The MyLink infotainment system works flawlessly, controls are intuitive, and nice details flood the cabin. 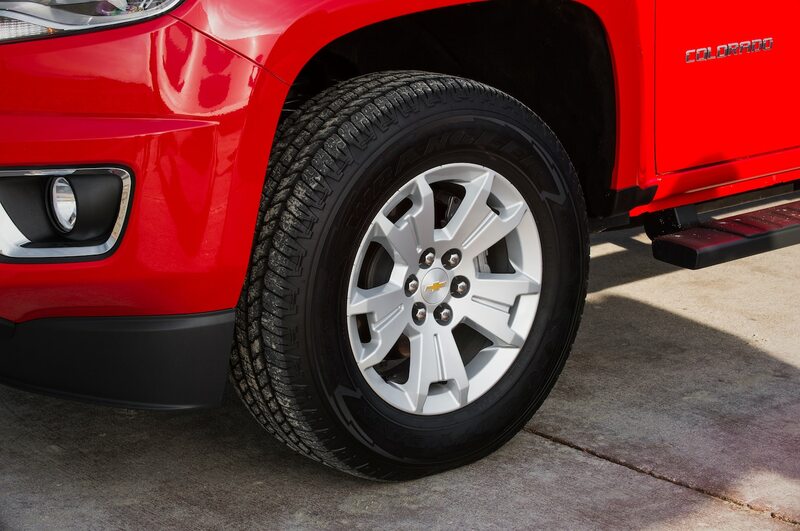 Inexpensive doesn’t mean cheap. 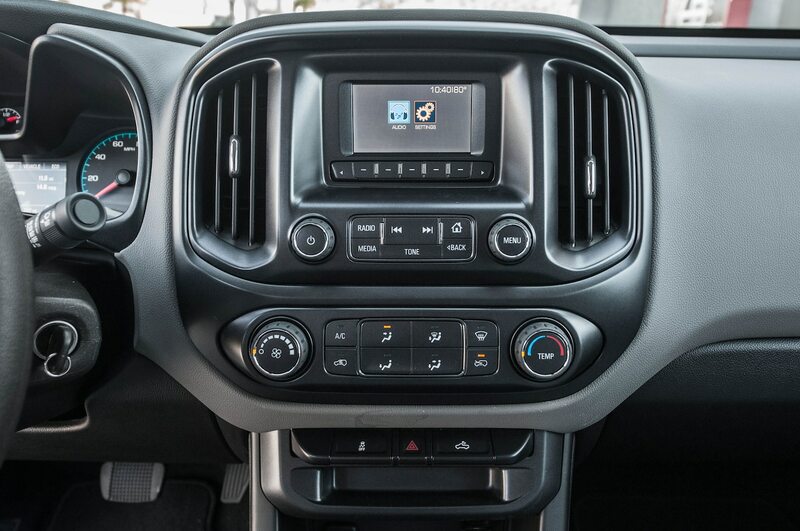 Even the base model work truck comes with a small color screen that acts as a backup camera monitor. 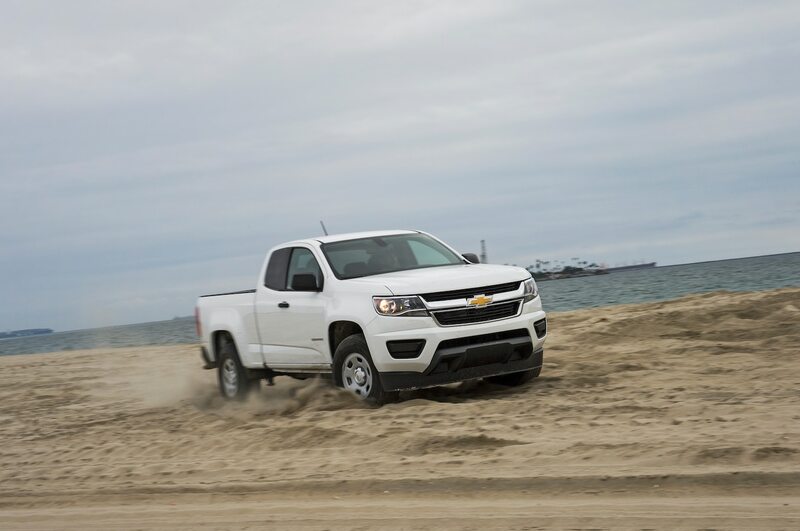 The Colorado arrives with very capable and efficient I-4 and V-6 powertrains. 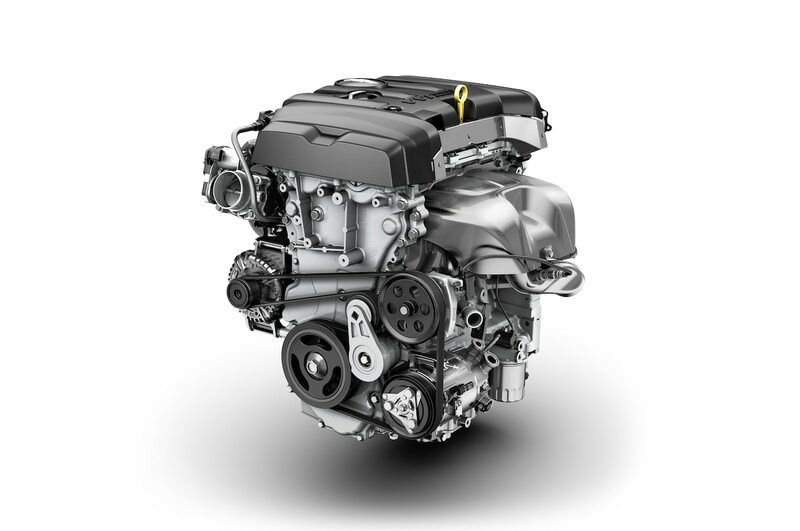 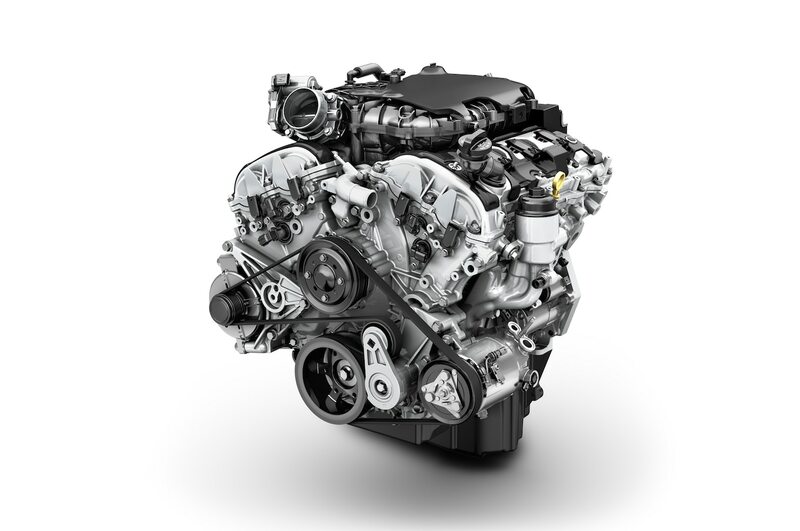 Next year, a four-cylinder diesel will debut and promises even better fuel economy. 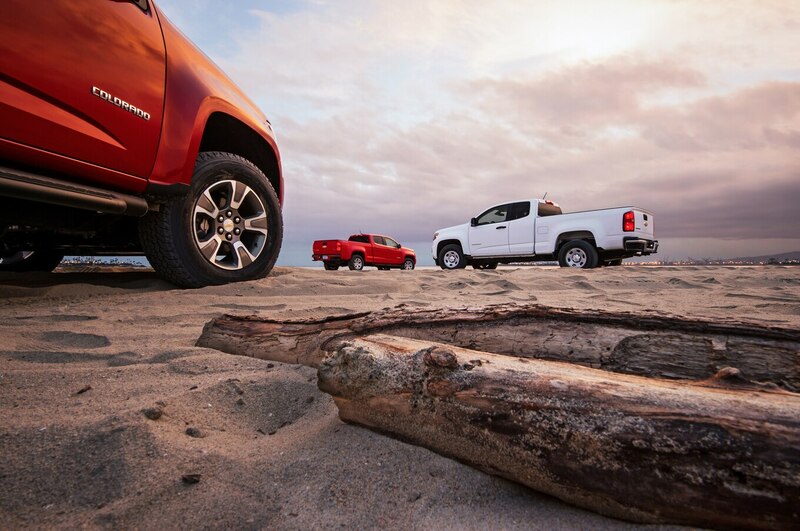 These trucks are up for many a task. 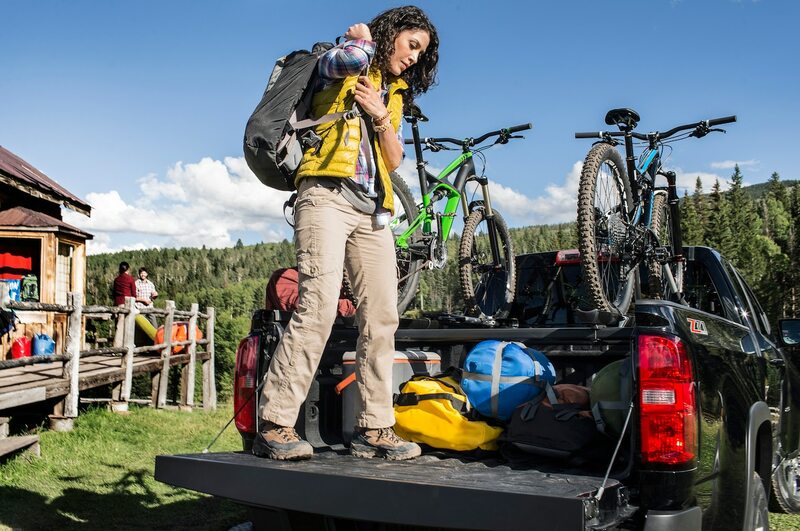 Whether hauling plywood from Home Depot, carrying bikes to a trailhead, or commuting to work, the Colorado bested everything else tested for performance of intended function. 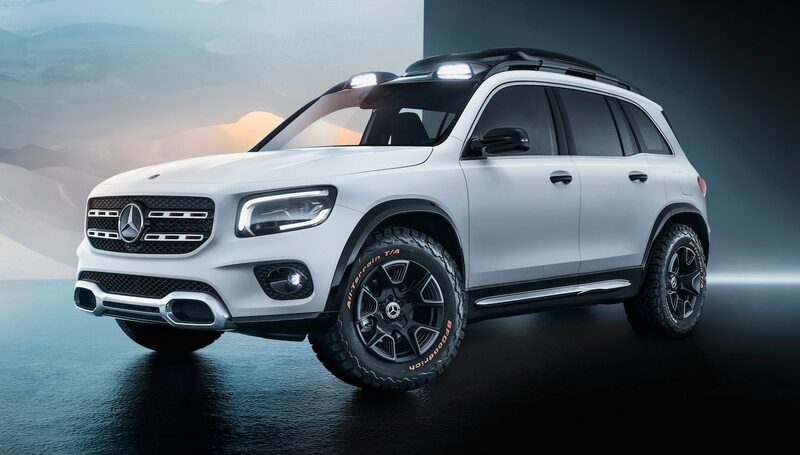 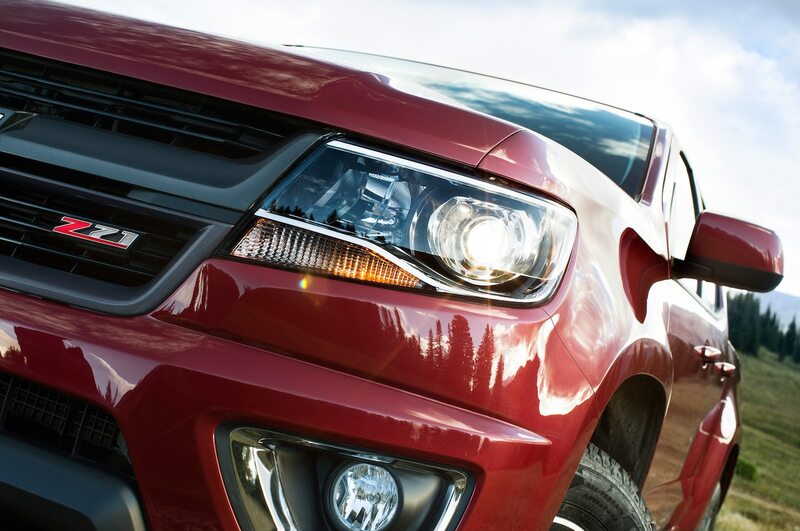 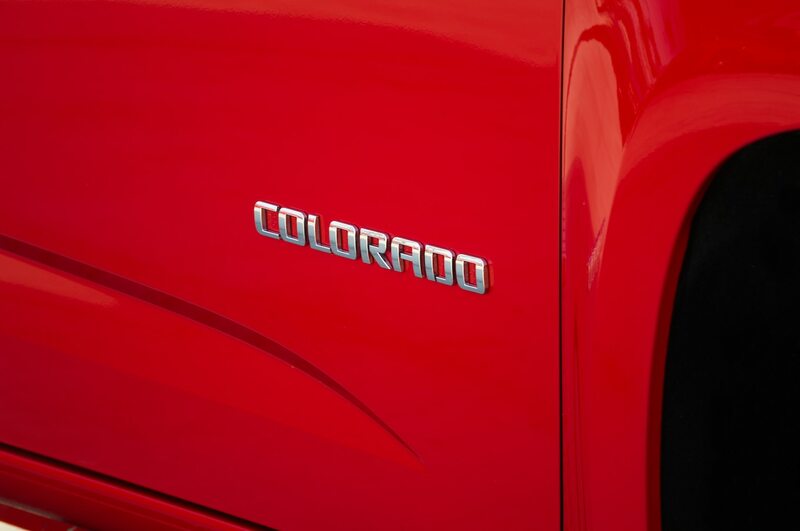 Every editor agreed that the Colorado’s exterior design was inspiring. 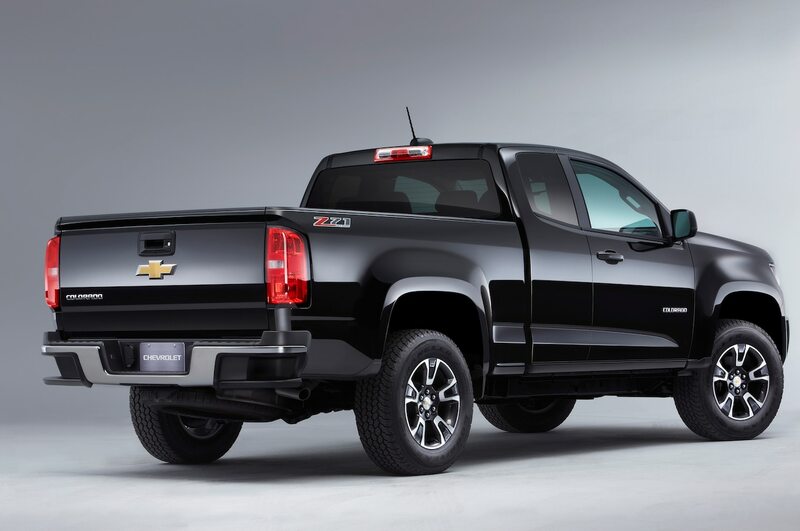 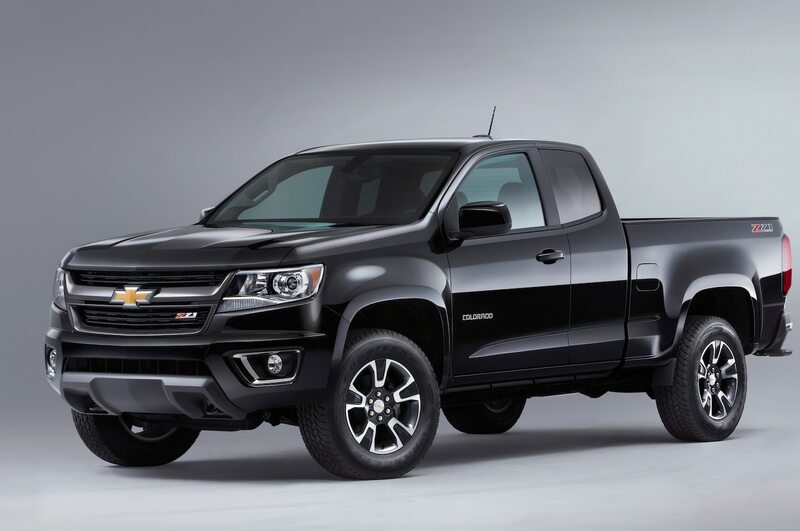 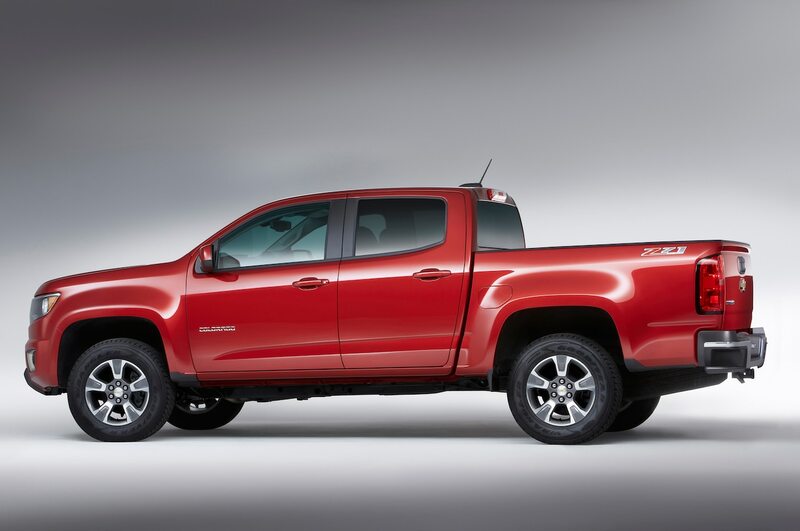 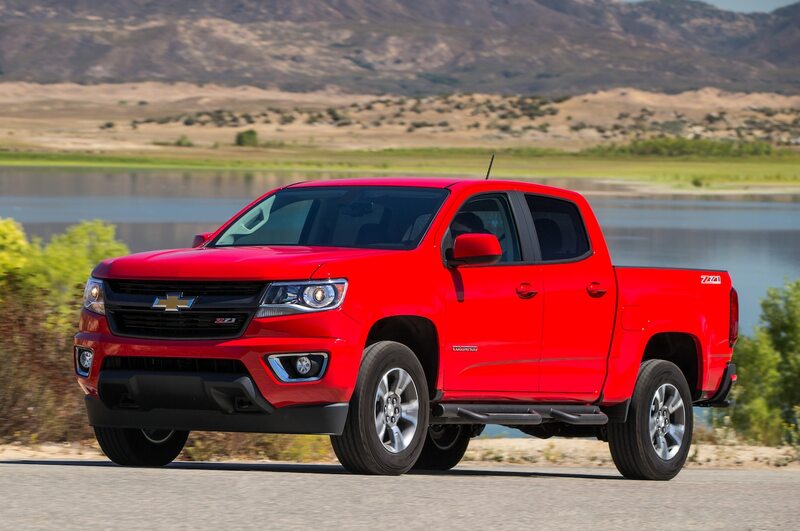 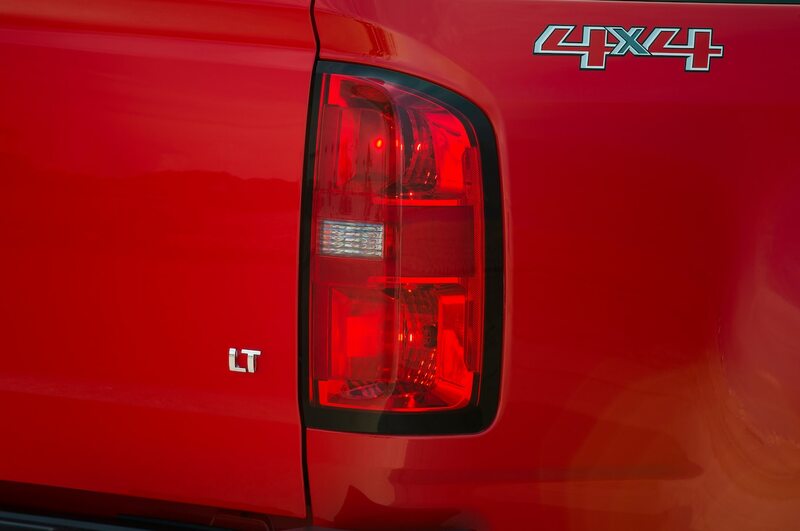 Chevrolet said it purposely pushed the pickup’s design to look different than the Silverado’s. 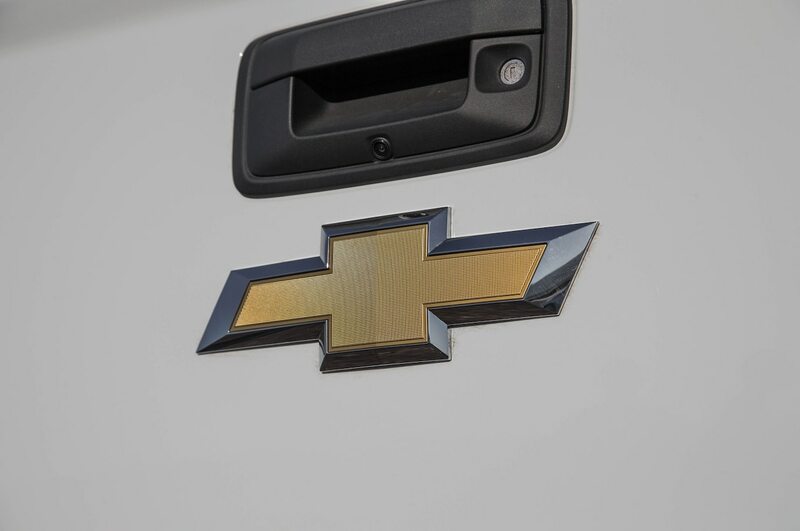 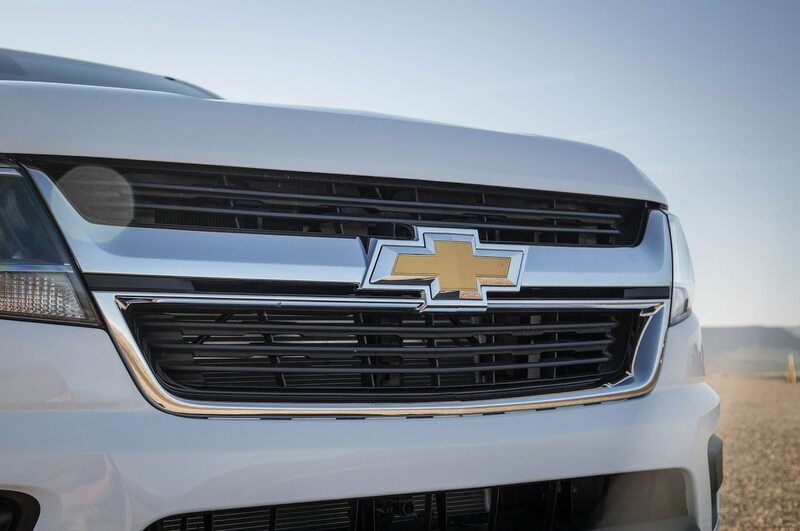 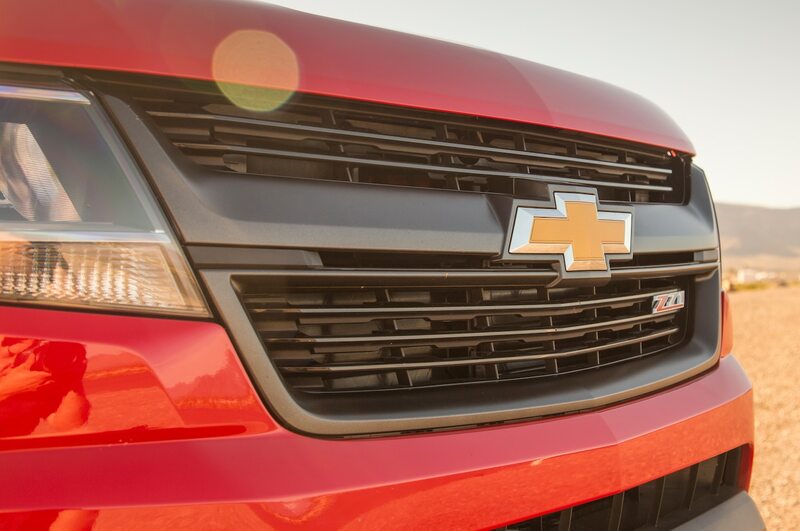 The unique grille comes in either chrome or gunmetal and carries a big Chevy bow tie in the center. 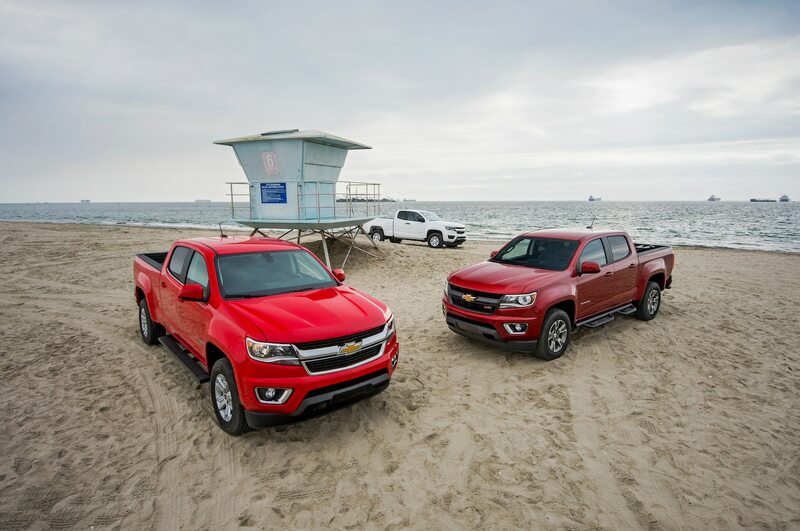 Really, when you look back to the original small pickups, the new Colorado is quite large in comparison. 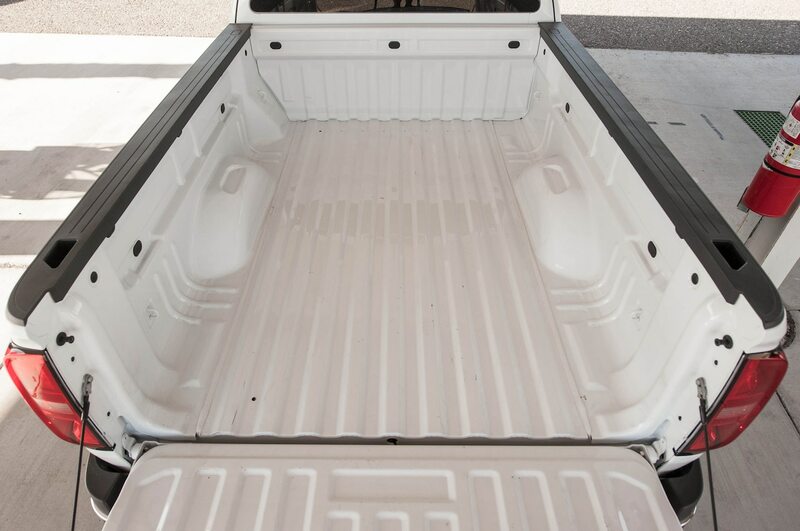 A regular cab, short-bed 2003 Chevy S-10 was just 190.1 inches long and 62.0 inches tall; a new Colorado in its smallest configuration is 212.7 inches long and 70.3 inches tall. 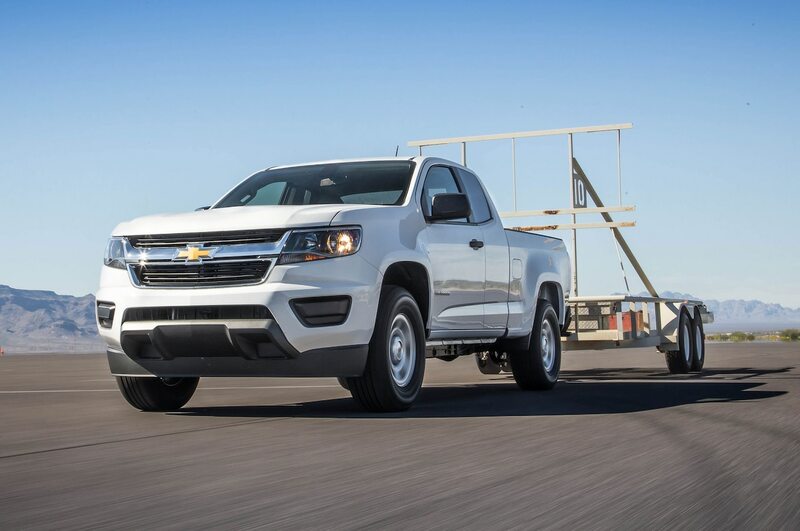 But it’s not nearly as big as all of those full-size pickups, which have incredible power and capability that many owners will never likely use. 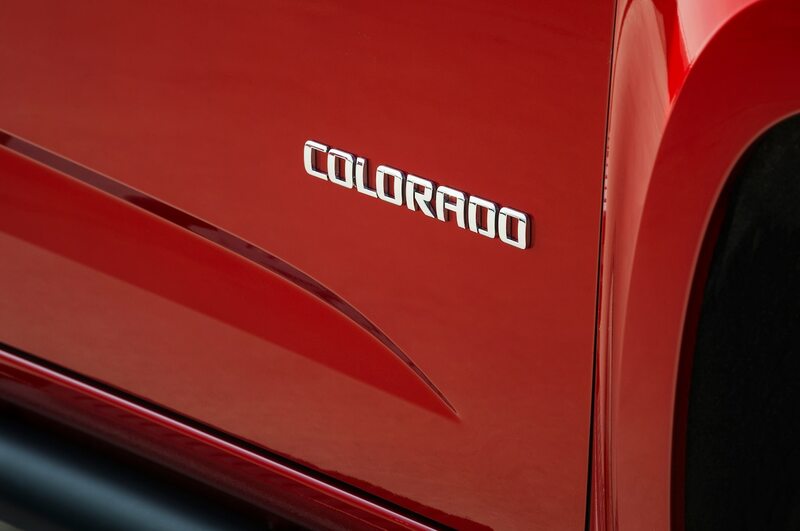 More important, no contender that we tested excelled in all six of our judging criteria to the extent the Colorado did. 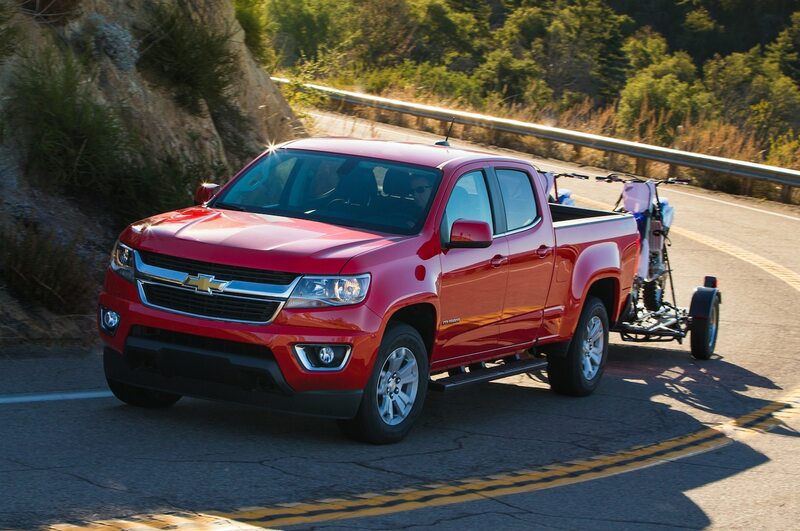 It’s well-designed and thoughtfully engineered, and it conquers its segment. 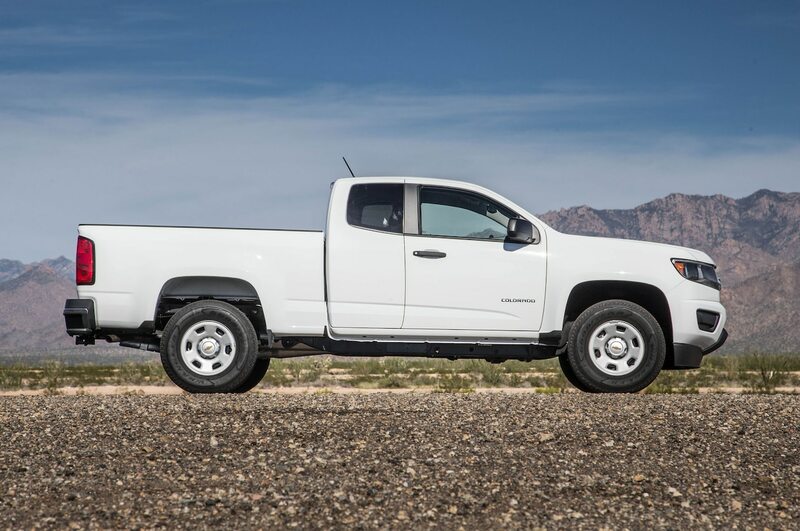 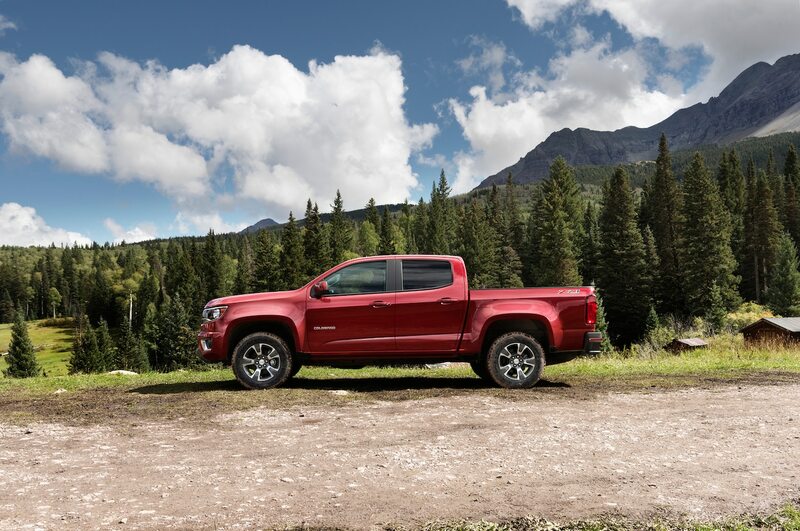 By creating a truly smaller truck, the Colorado should go on the shopping list of people who want the utility of a pickup but not the grandiose size. 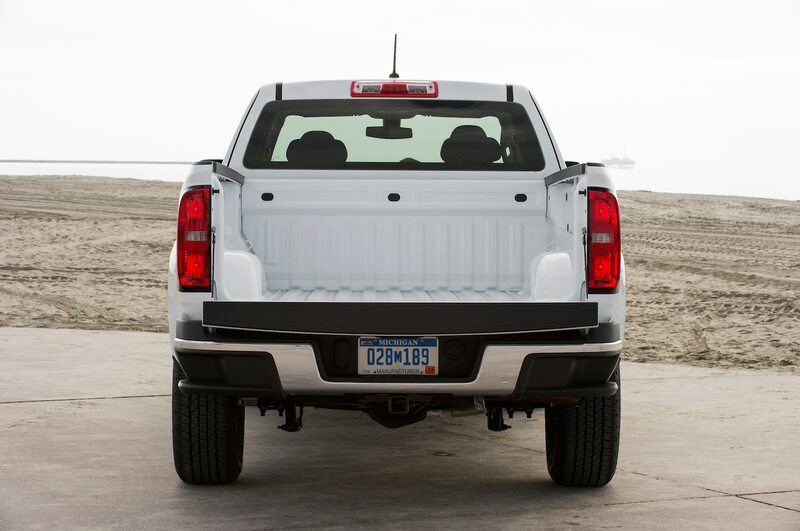 Texas may not embrace this truck, but a lot of other people will love it for what it is — and what it is not. 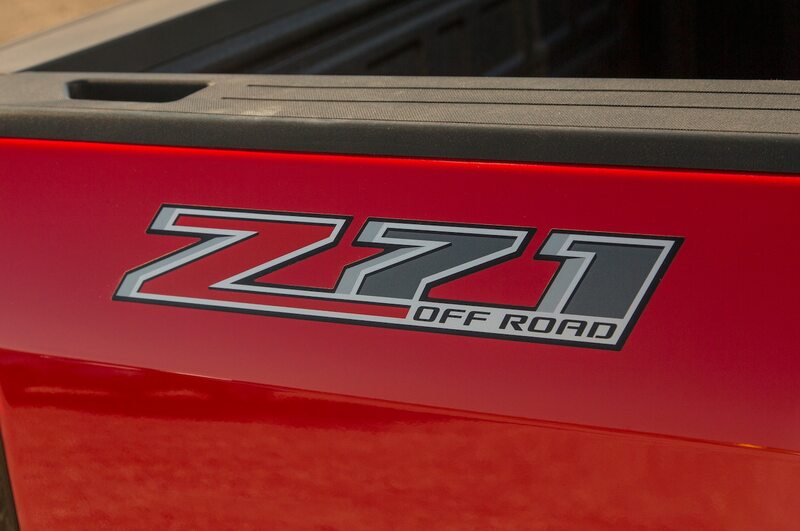 *7,000 lb, 3.6L with tow package. 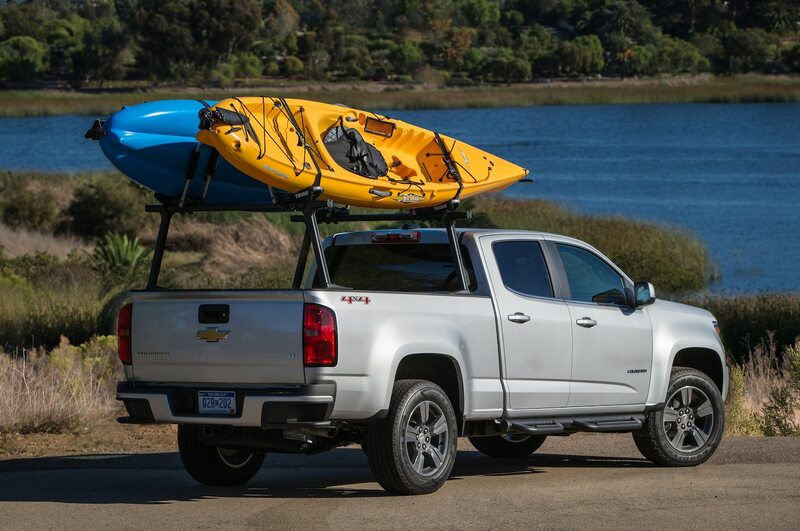 Note: Chevy doesn’t sell a hitch with the 2.5-liter but rates it at 3,500 lb for aftermarket hitches, so we mounted a hitch ourselves for this test. Photos by Motor Trend staff and provided by the automaker.